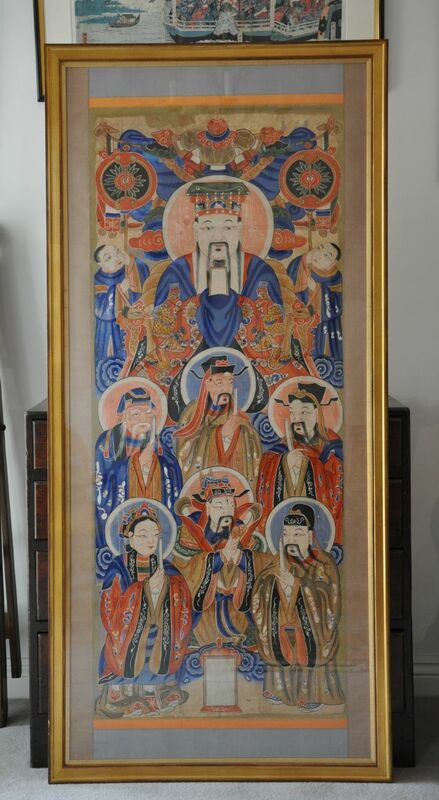 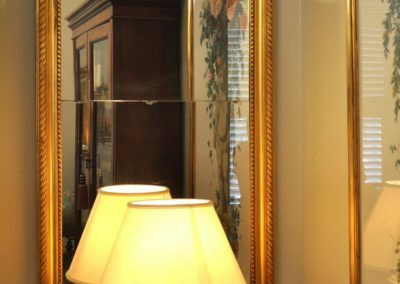 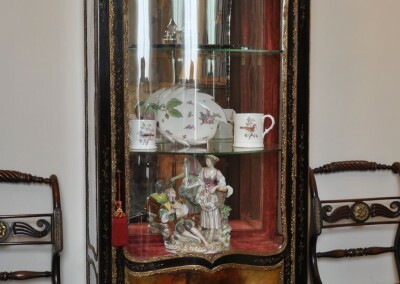 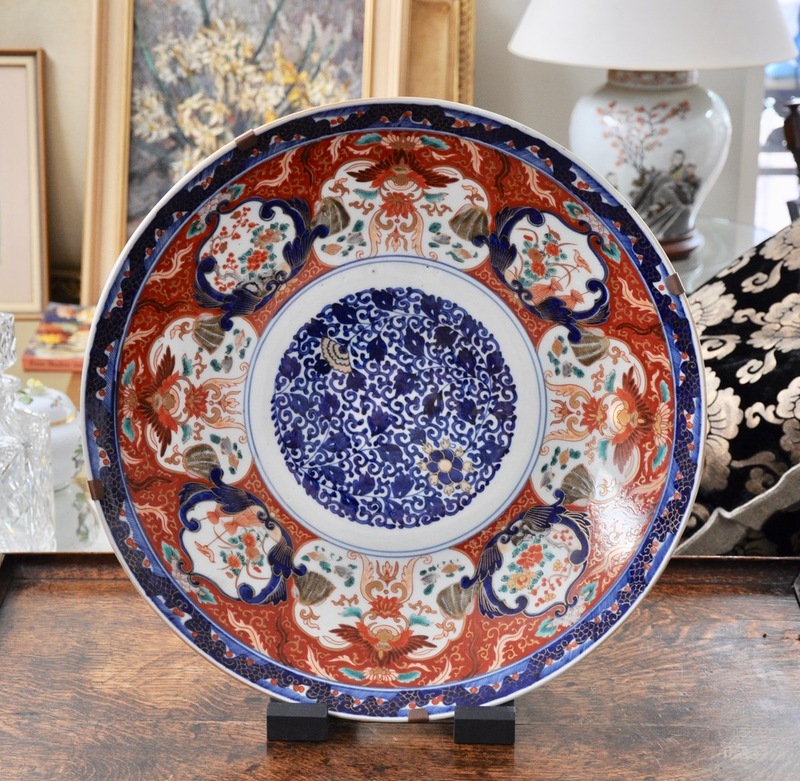 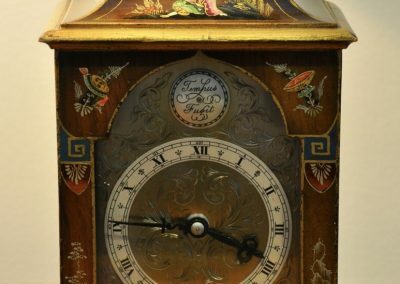 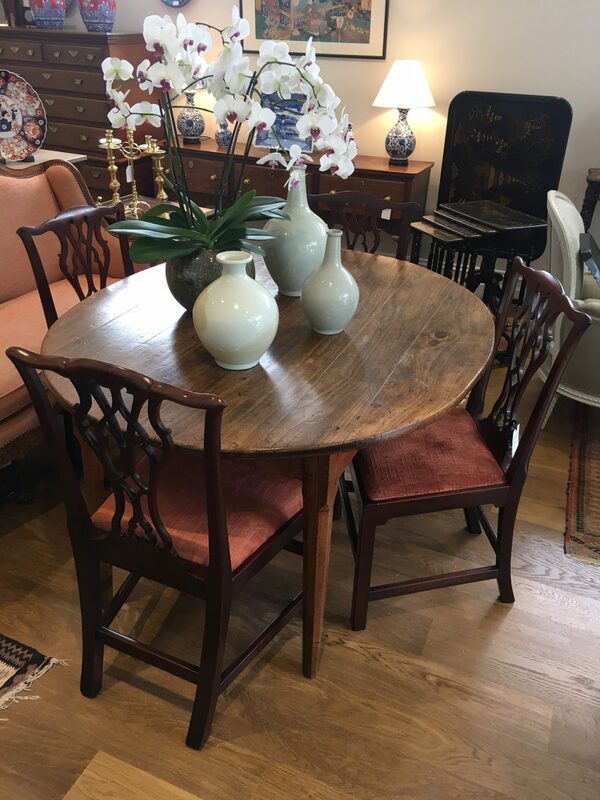 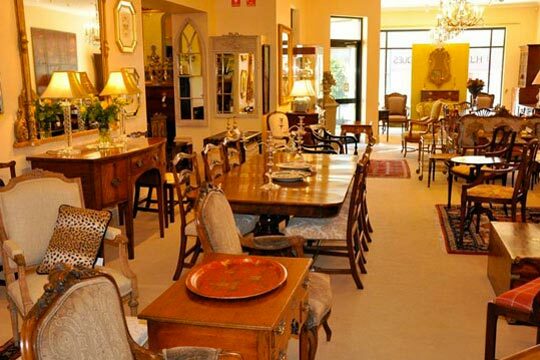 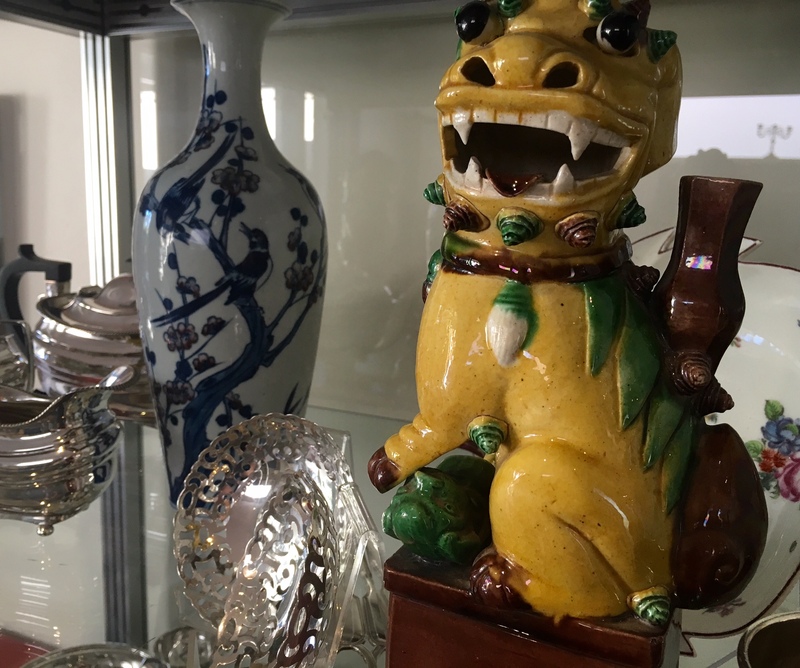 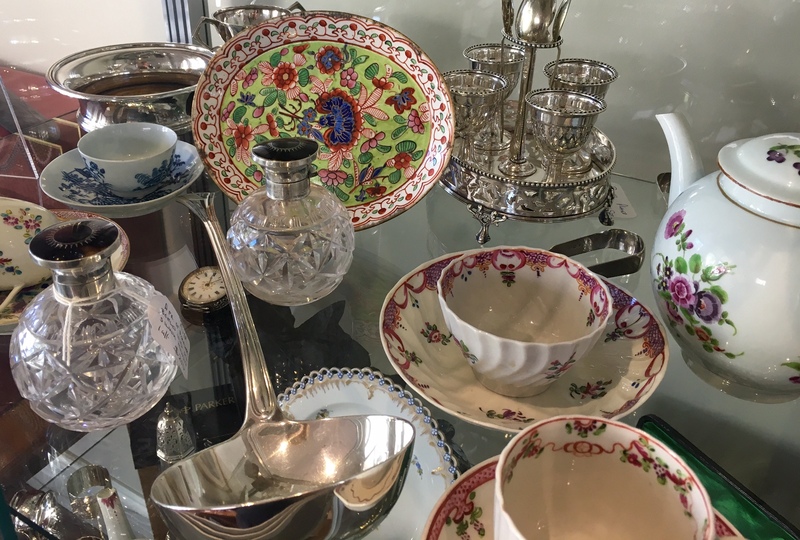 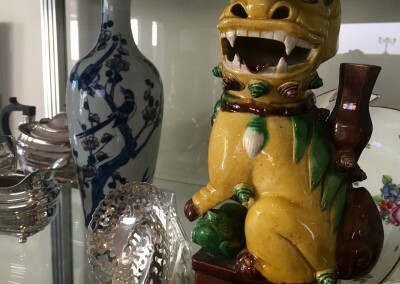 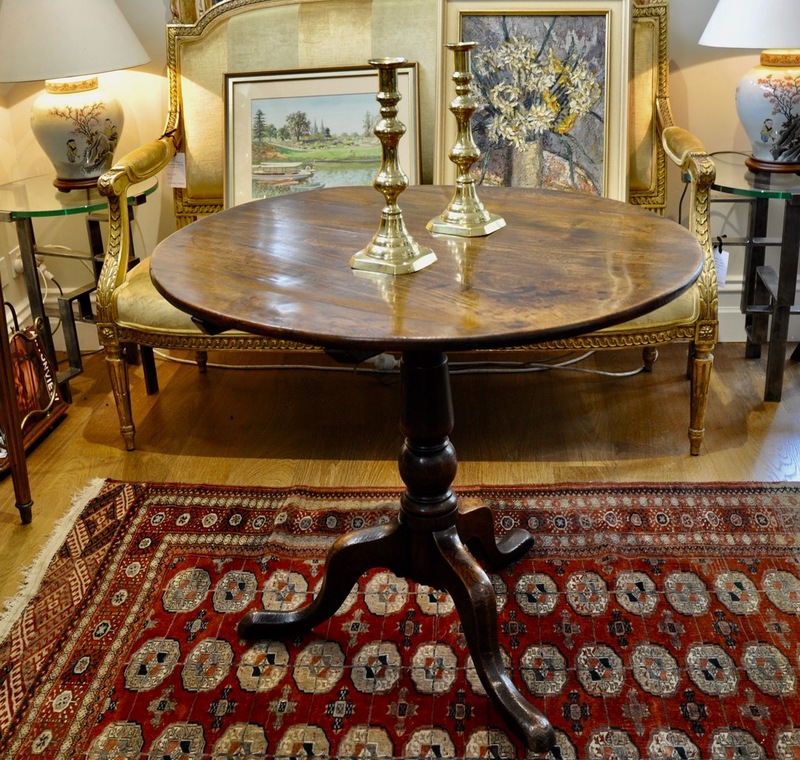 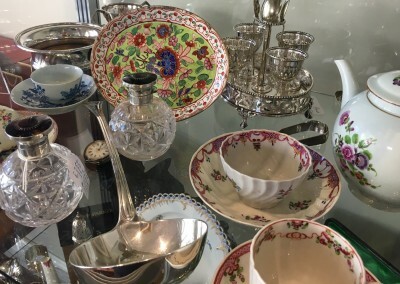 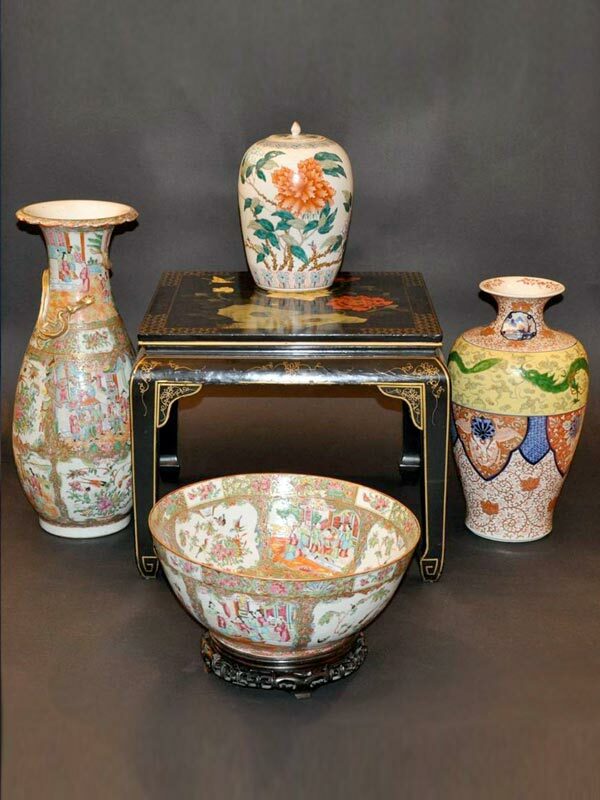 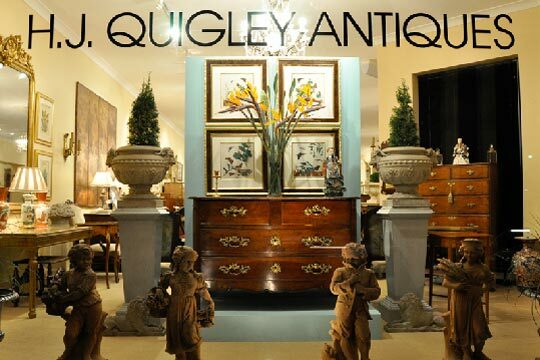 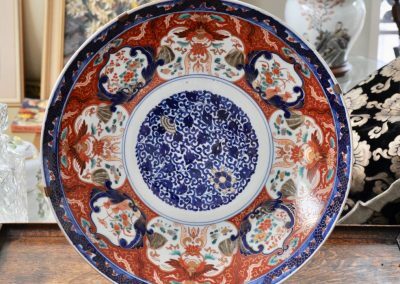 H. J. Quigley Antiques was established in 1982 but the family business has been in existence for over 100 years. 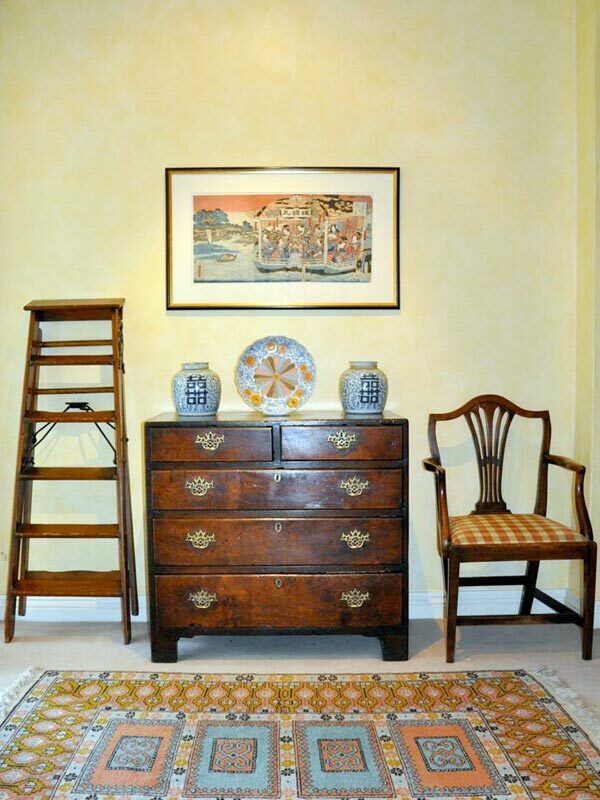 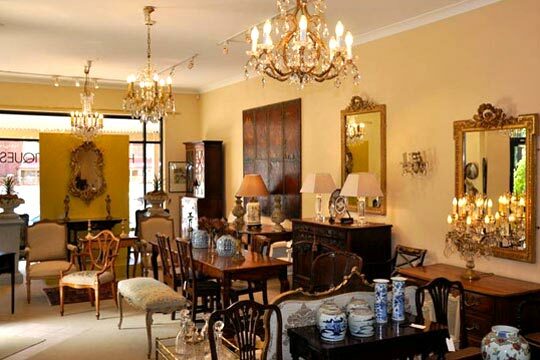 Today the business is run by Judith Quigley after taking over from her father Harold who spent his lifetime in antiques. 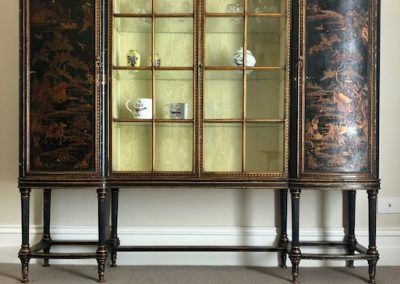 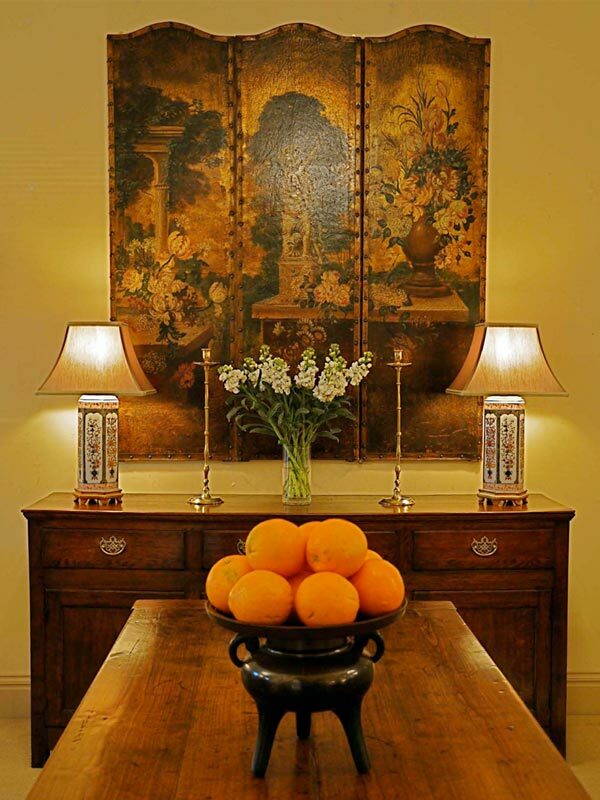 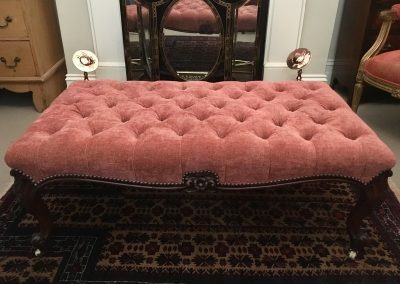 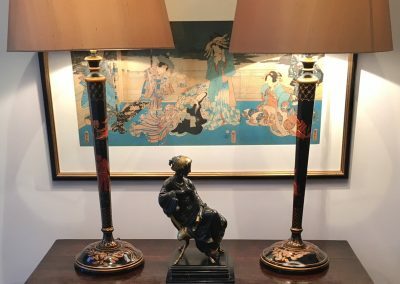 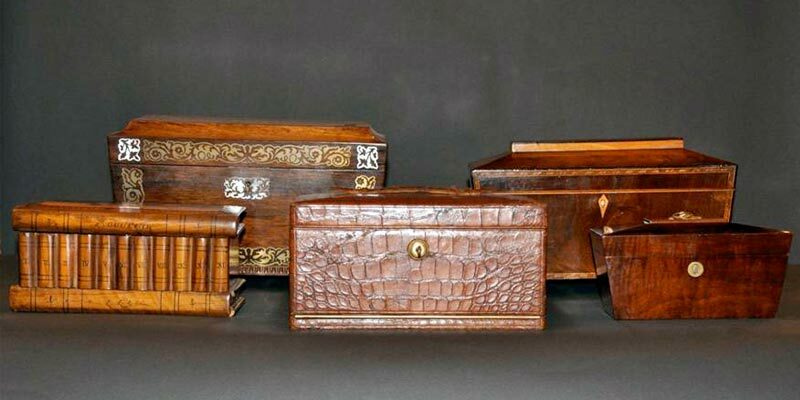 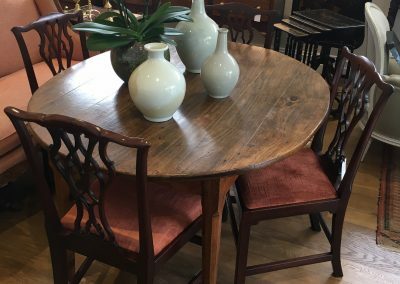 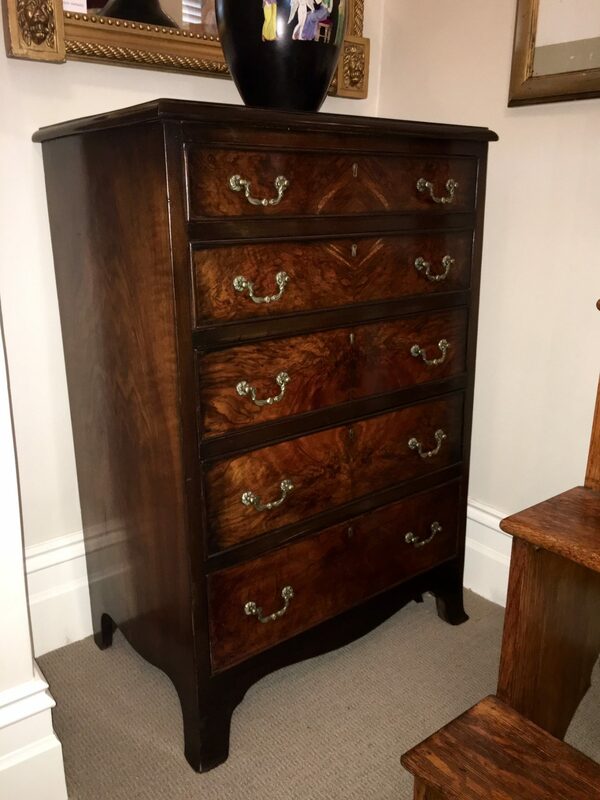 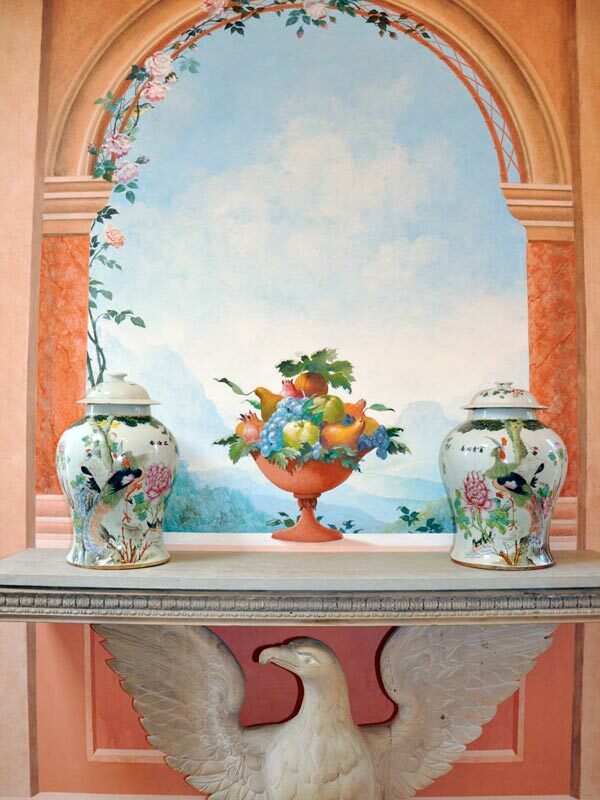 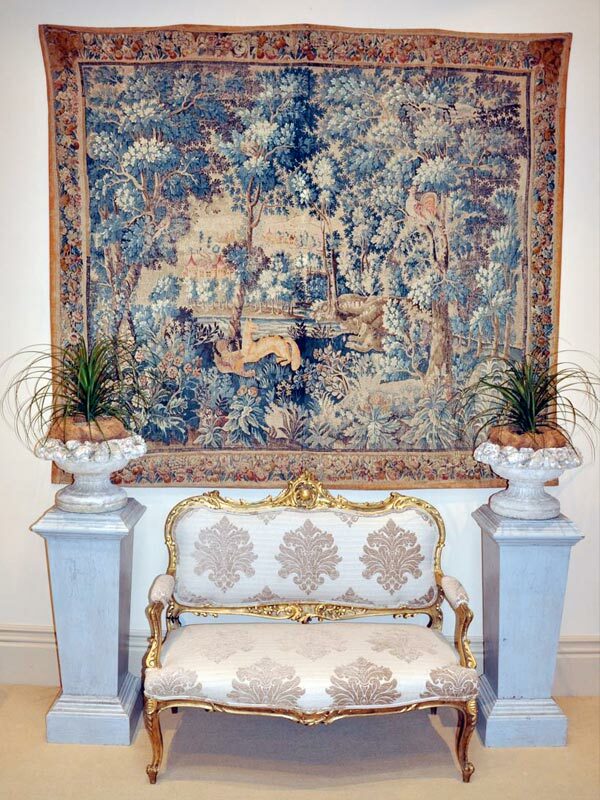 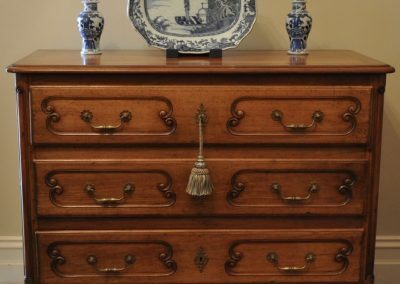 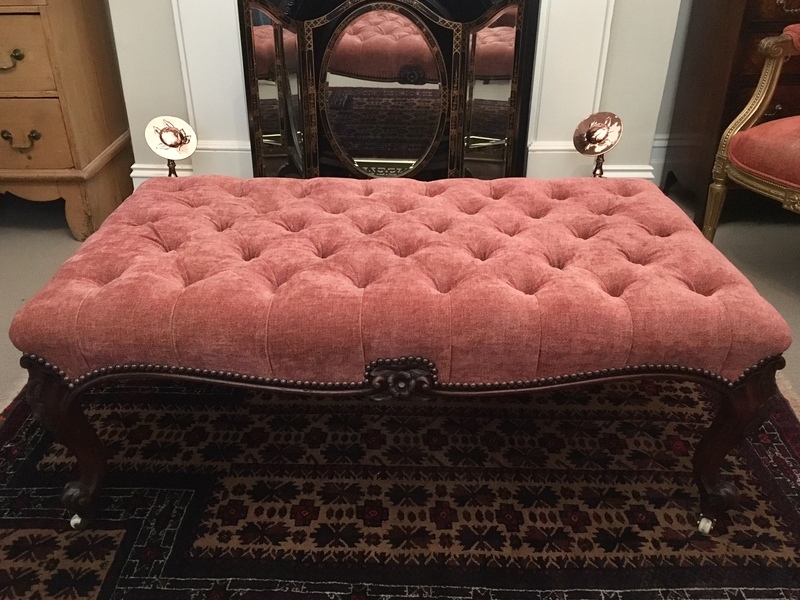 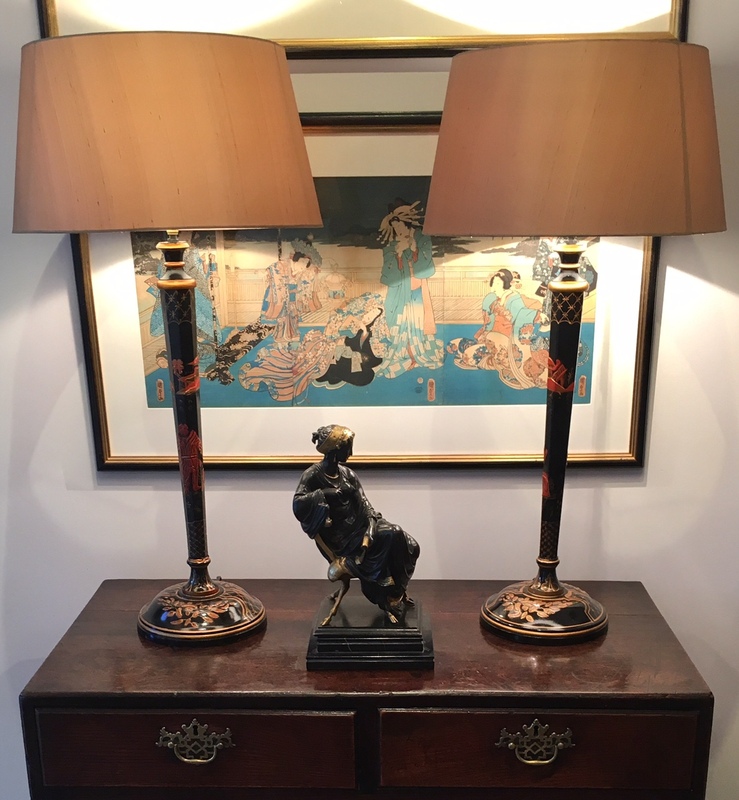 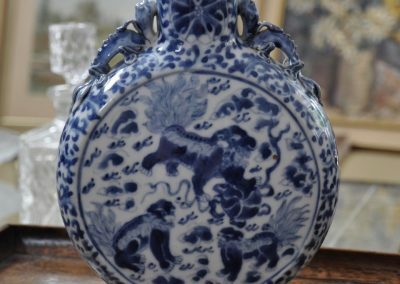 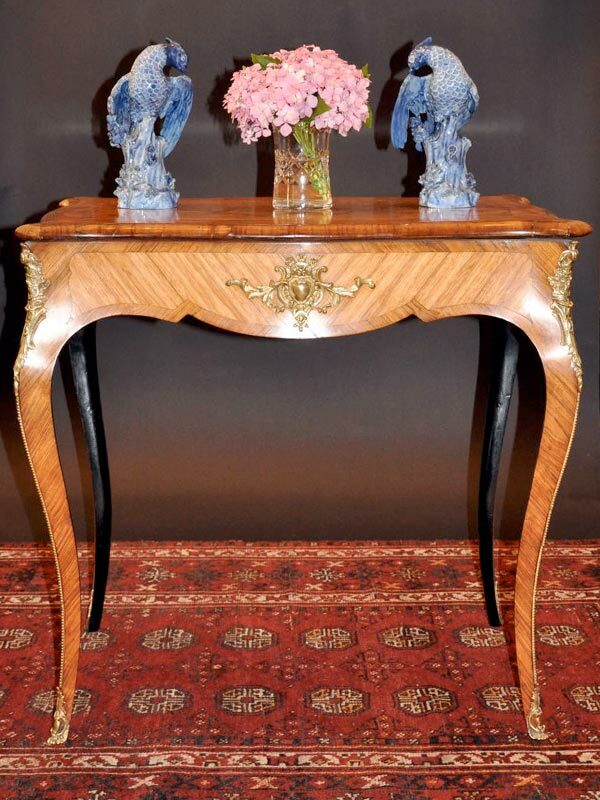 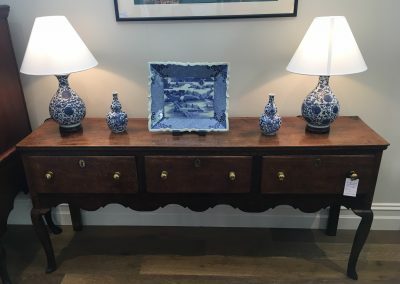 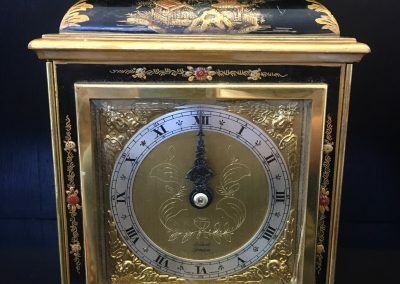 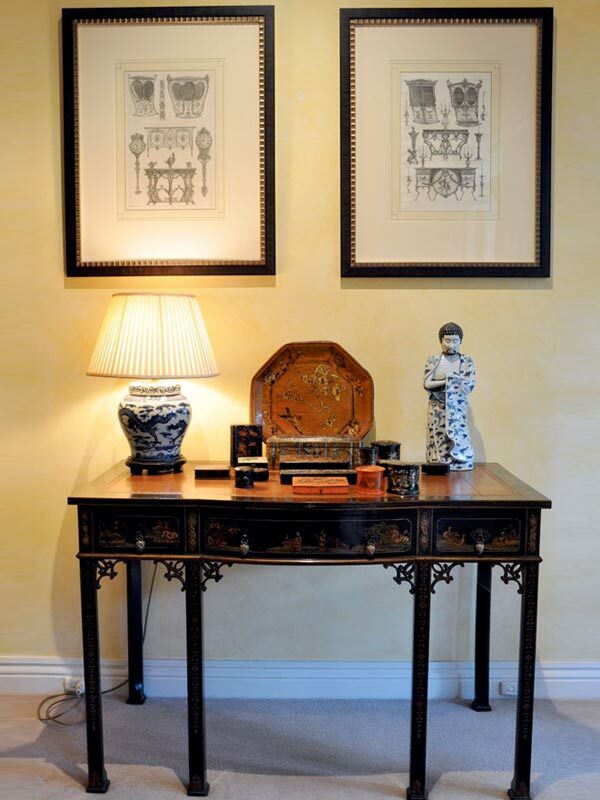 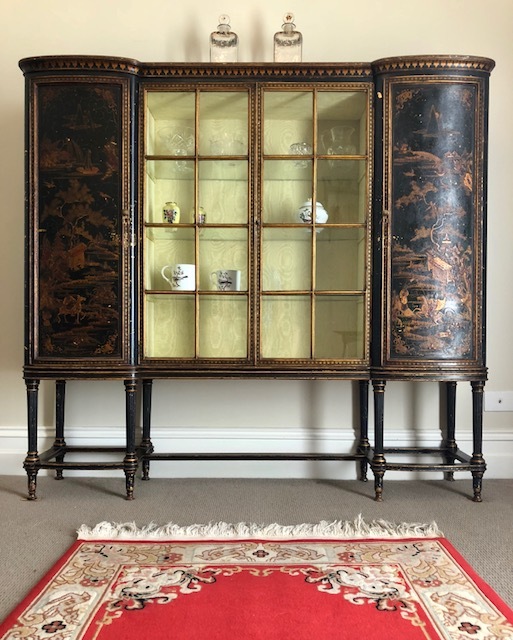 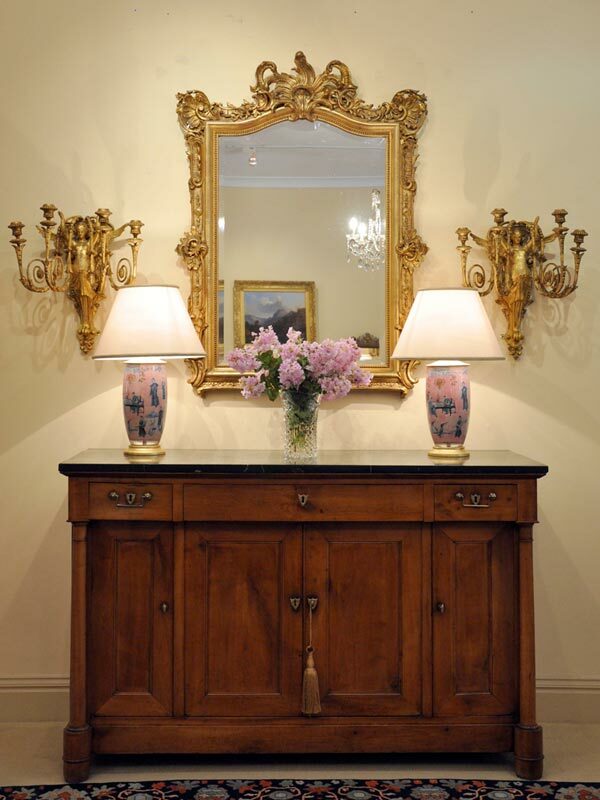 The priority has always been to provide our South Australian and interstate clients with top quality furniture and works of art from the 17th, 18th & 19th Centuries. 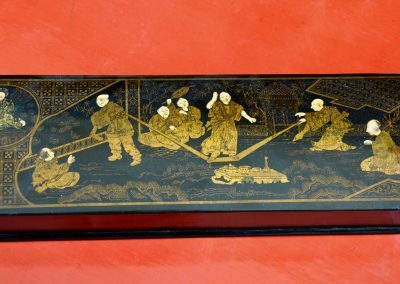 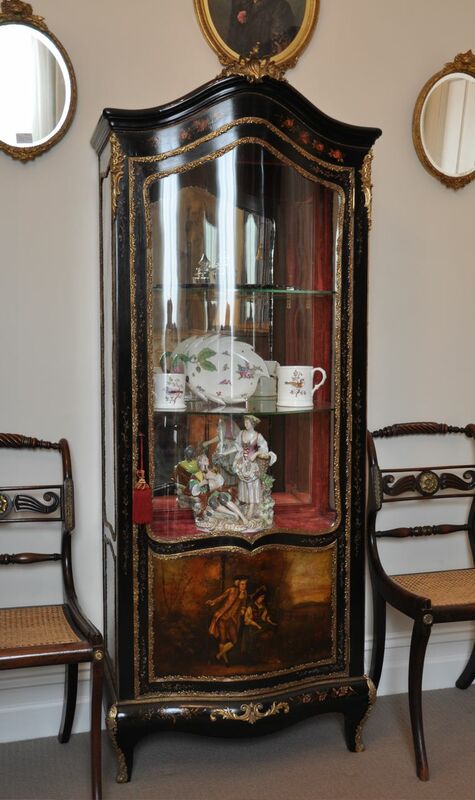 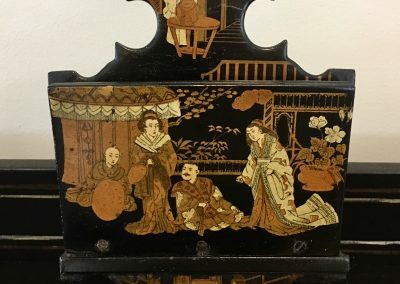 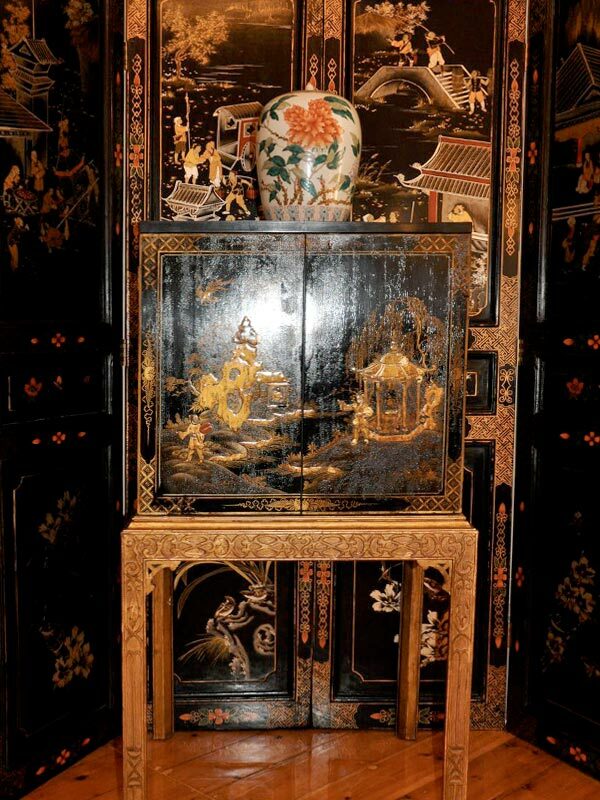 A lacquered chinoiserie cabinet c.1880. 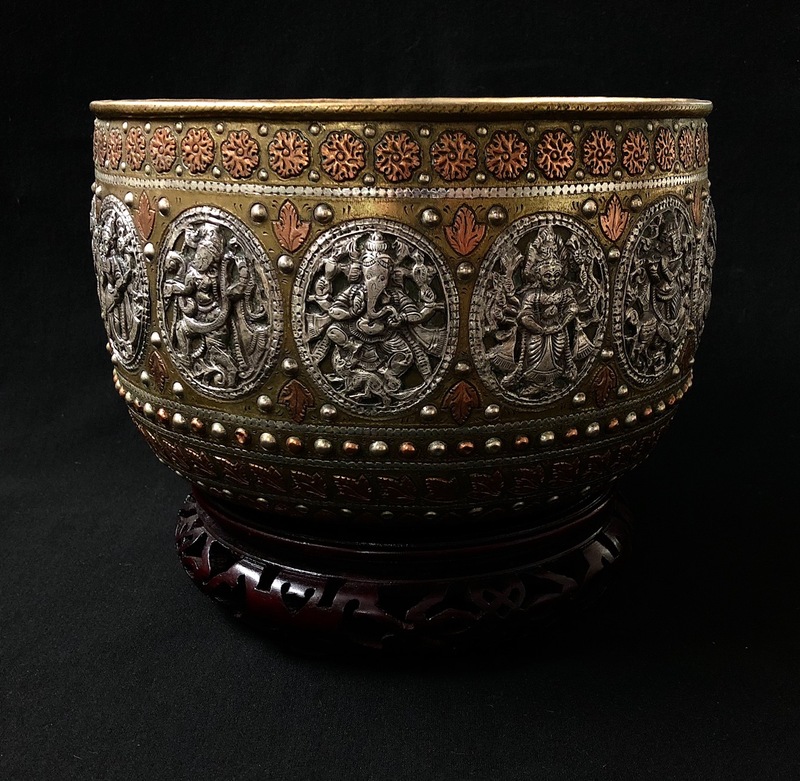 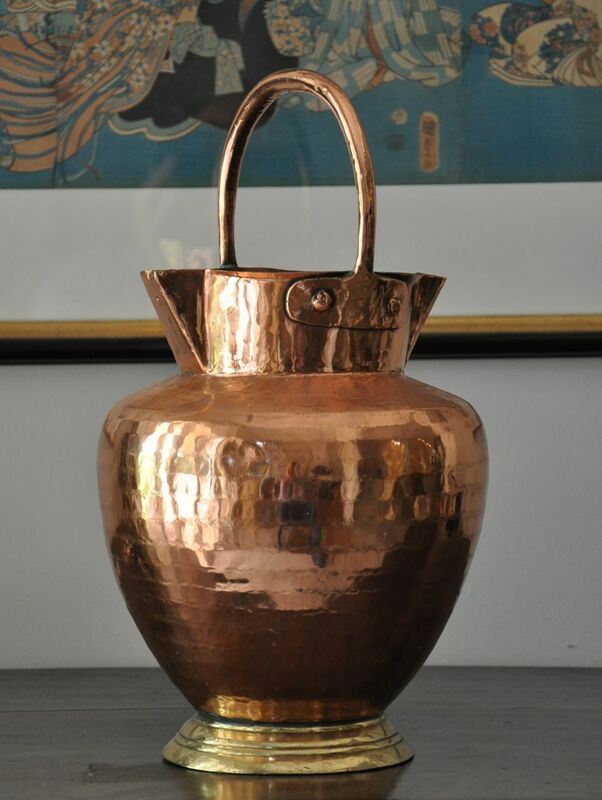 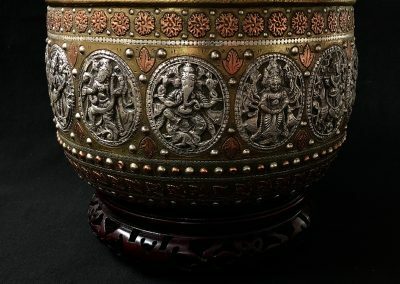 An Indian Brass Copper & Silver Jardiniere on stand c.1900. A collection of Sterling Silver. 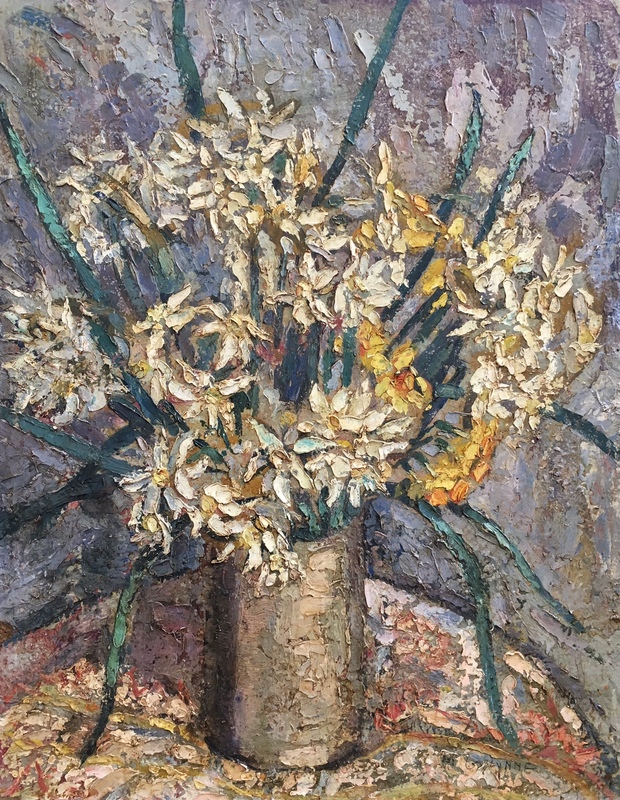 Frederick Millward Grey (1899-1957) Oil on board 56x51cm. 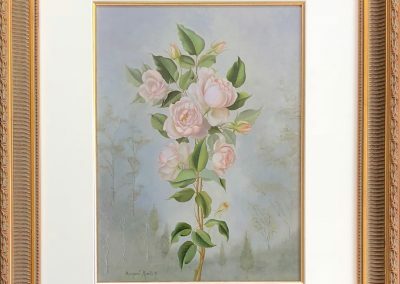 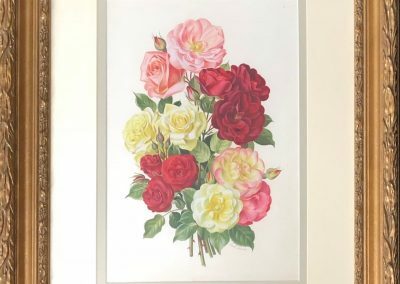 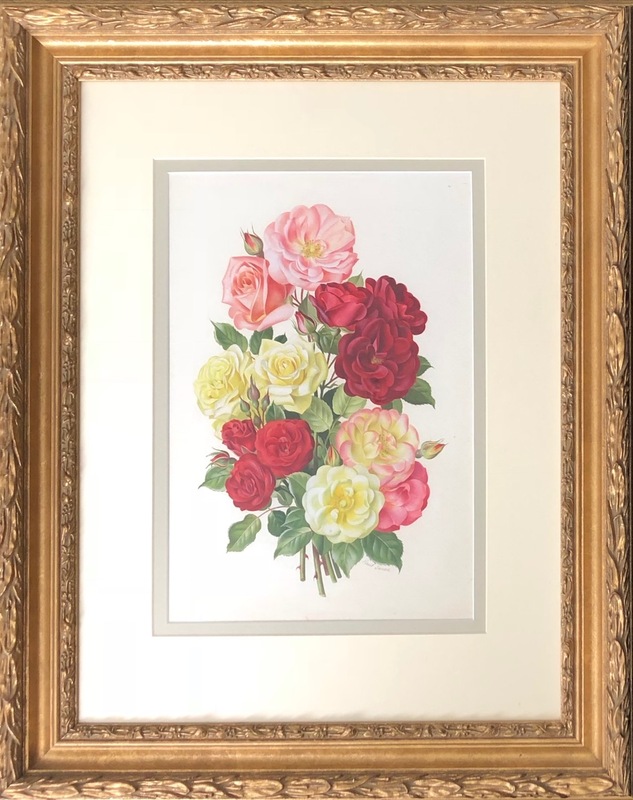 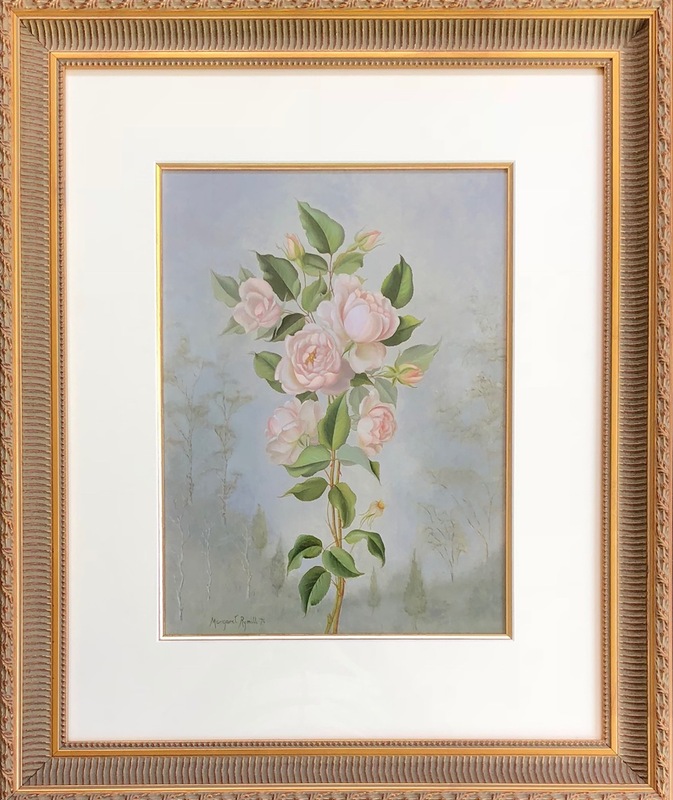 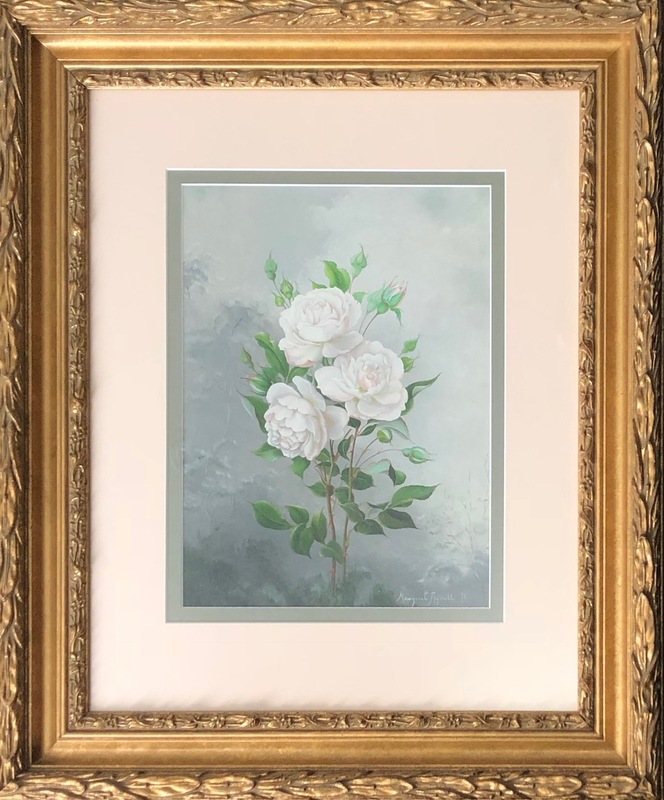 Margaret Rymill (1913-2004) Roses 1976 38x28cm Oil. 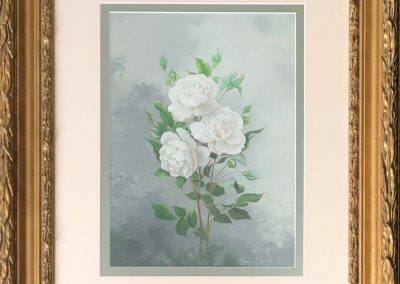 Margaret Rymill (1913-2004) Roses 1971 Oil 29x21cm. 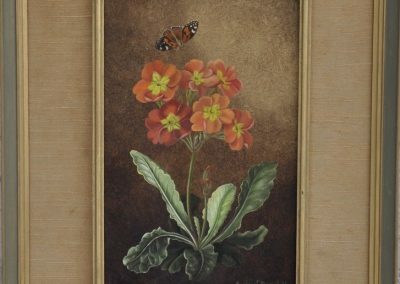 Paul Jones (1921-1997) Gouache 37x25cm. 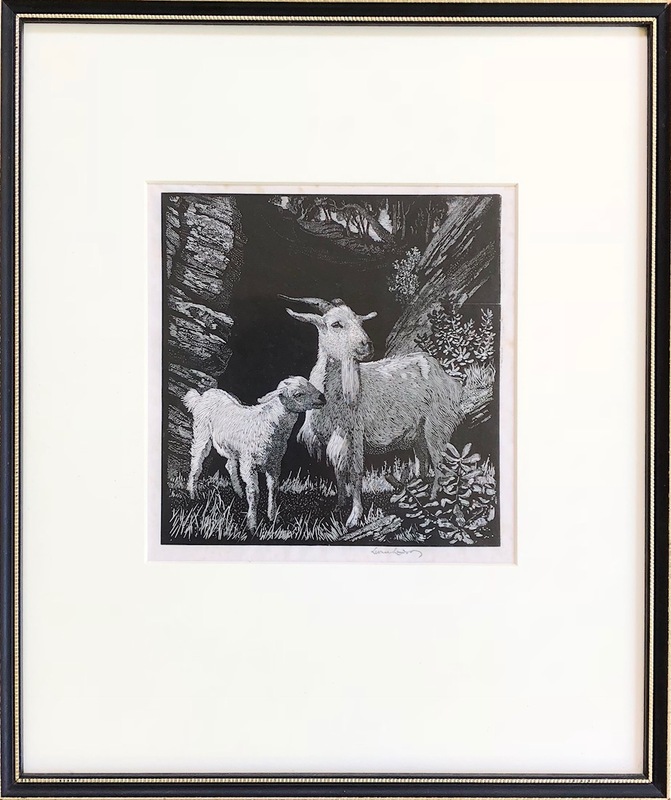 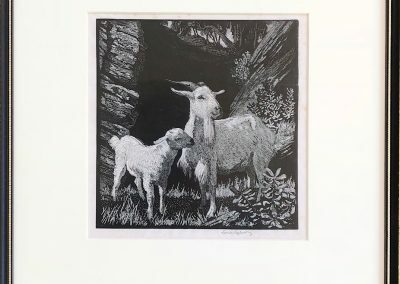 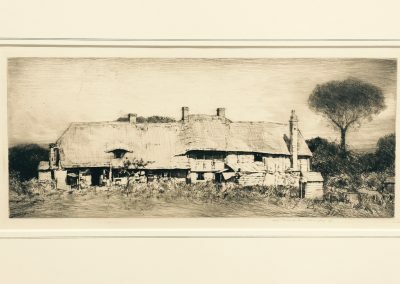 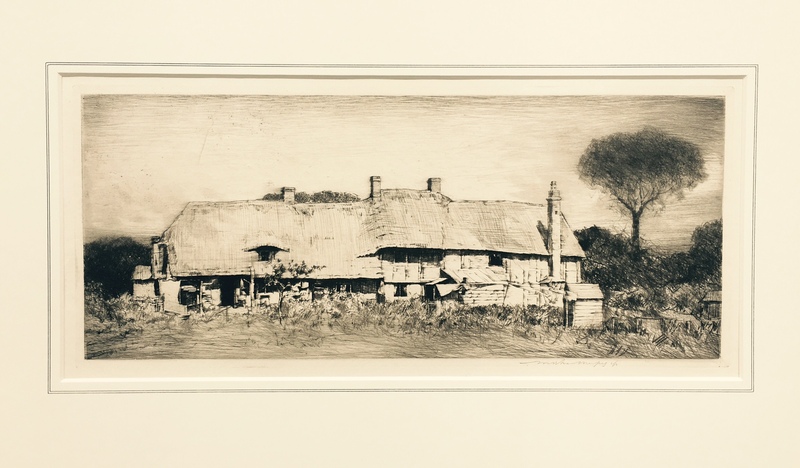 Sir Lionel Arthur Lindsay (1874–1961) ‘White Goat’ 15X14.5cm Wood engraving. 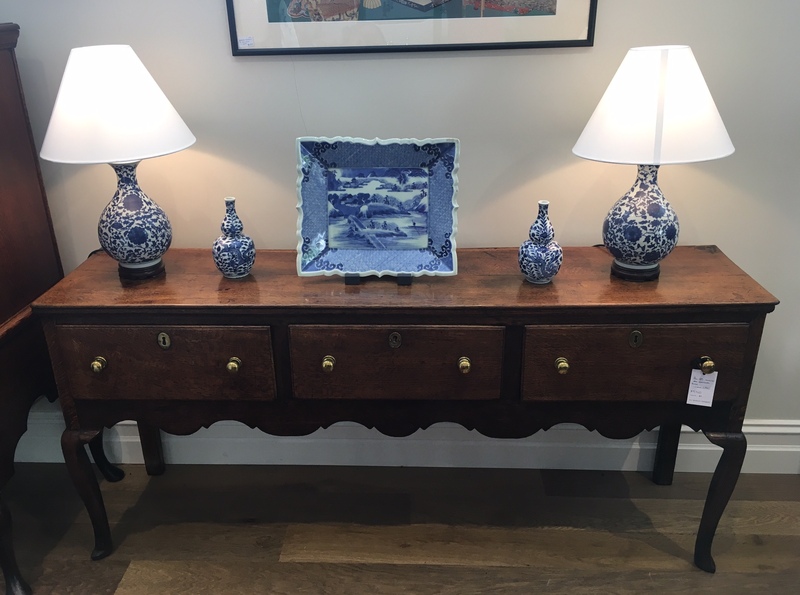 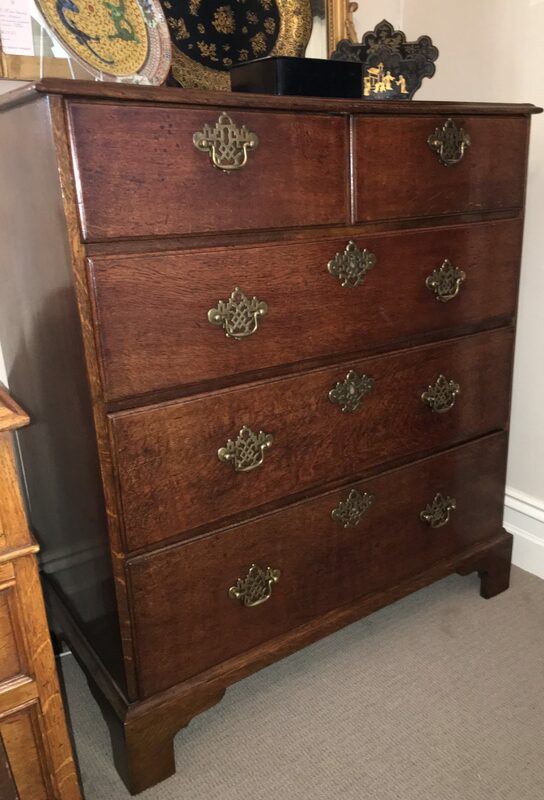 English oak mule chest c.1850. 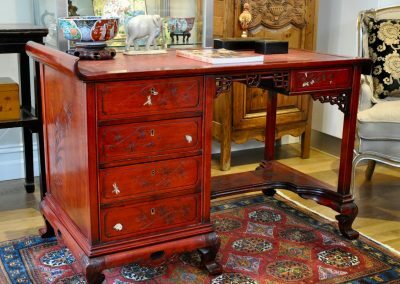 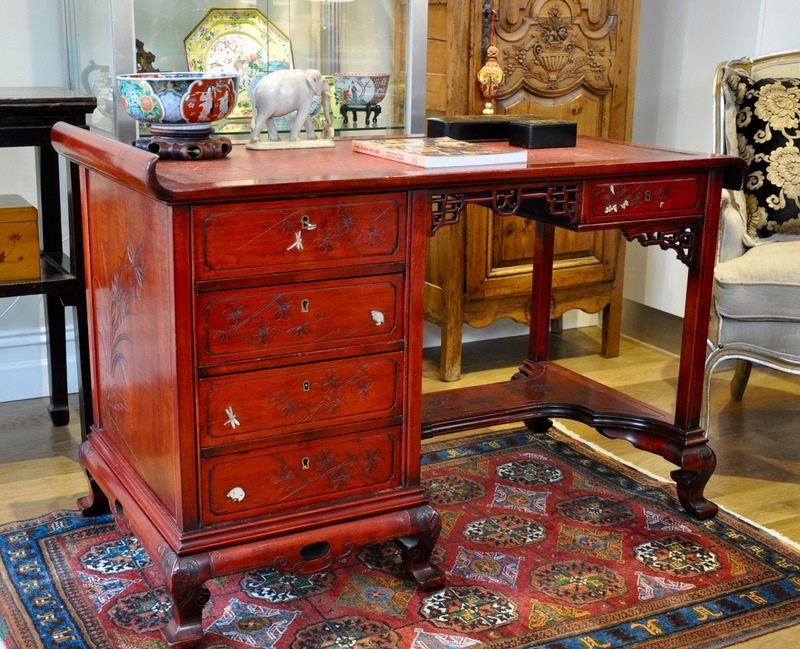 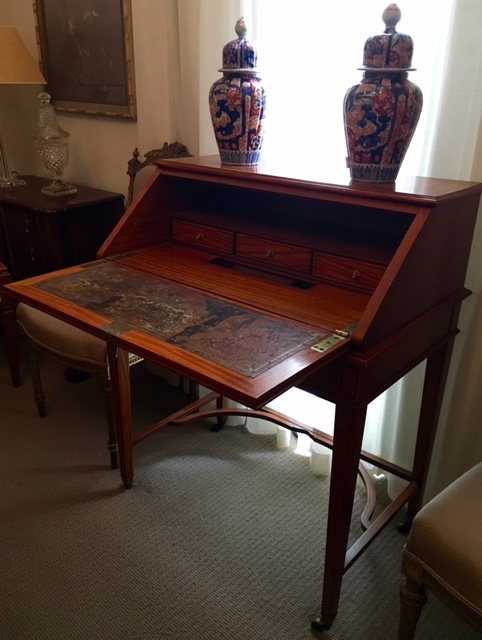 A French red lacquered desk with tooled leather top circa 1920. 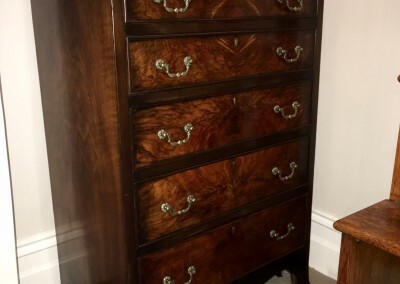 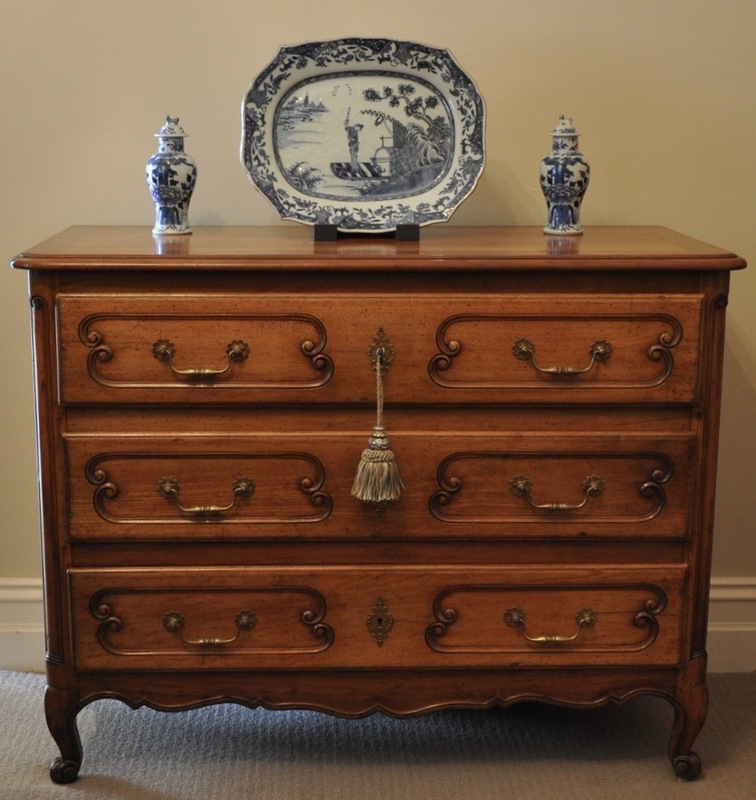 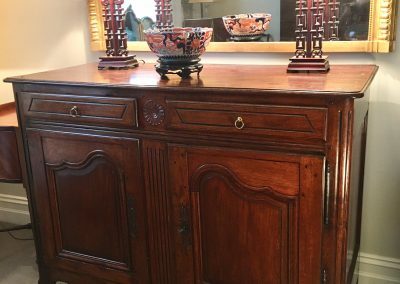 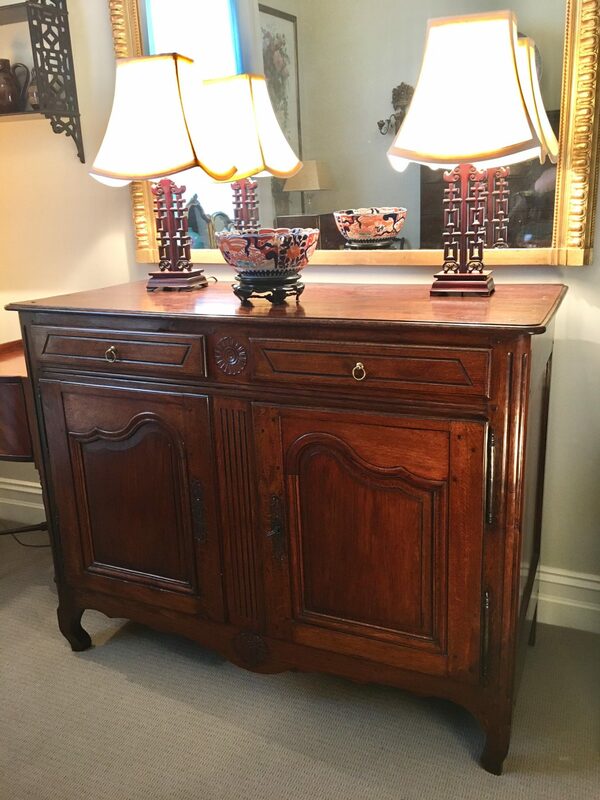 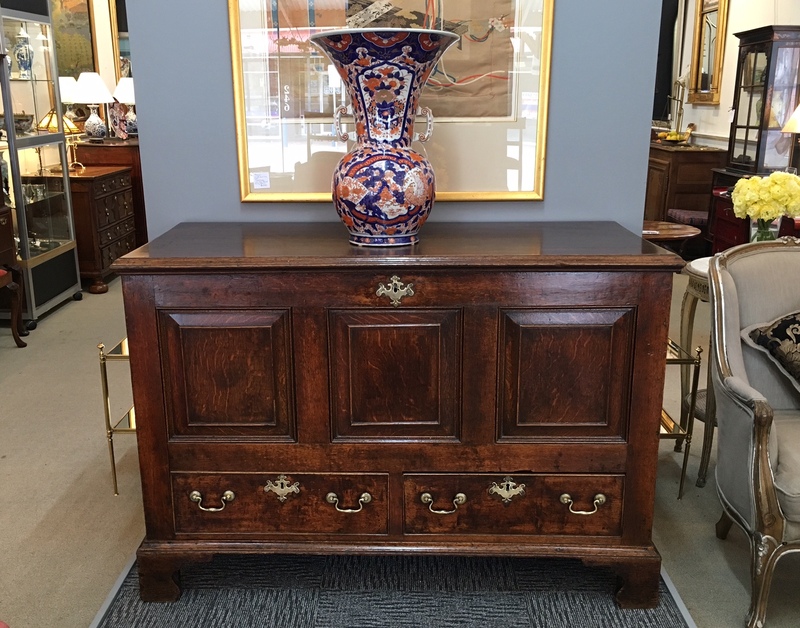 French walnut commode circa 1930. 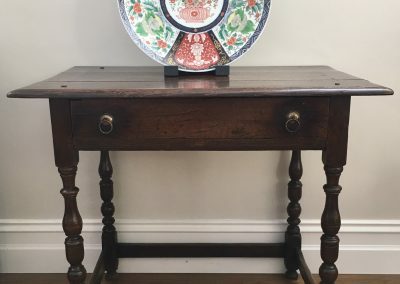 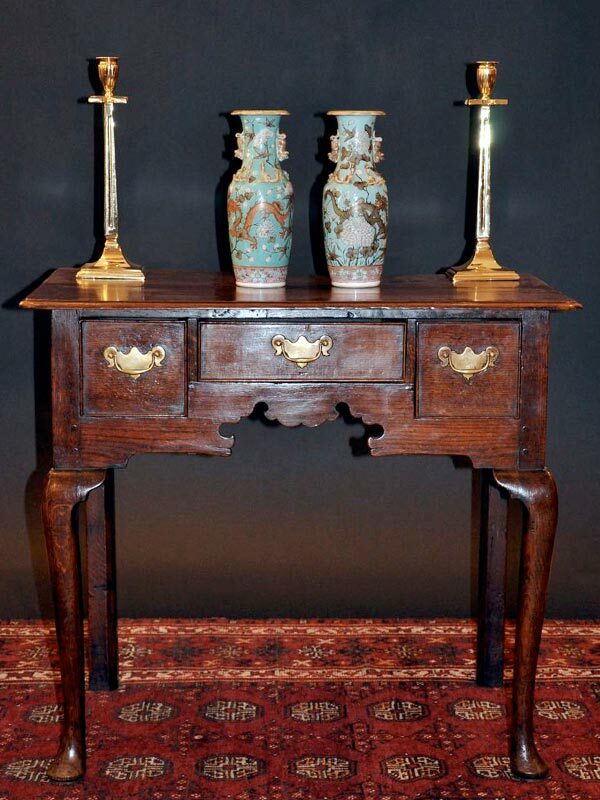 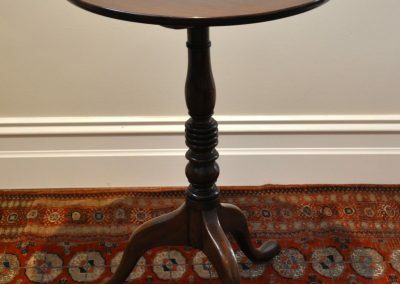 An 18th century tripod table. 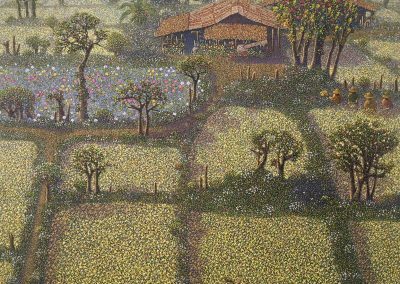 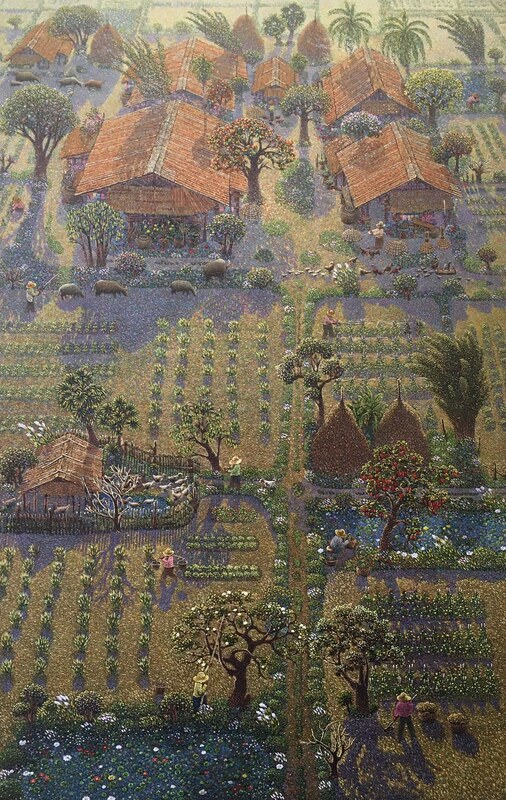 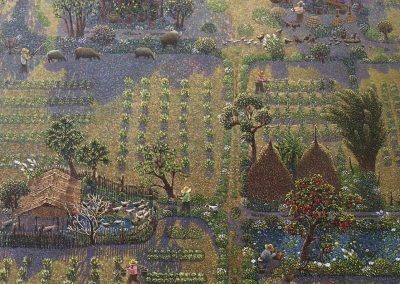 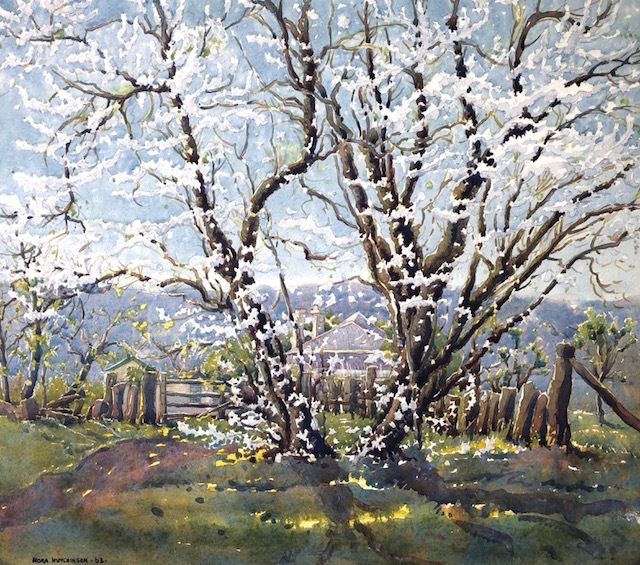 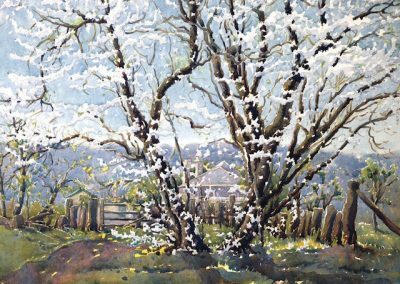 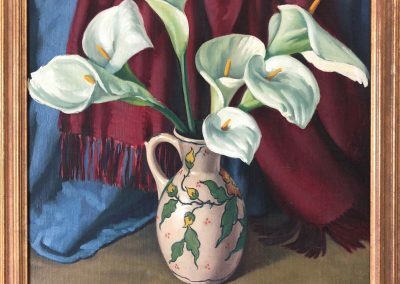 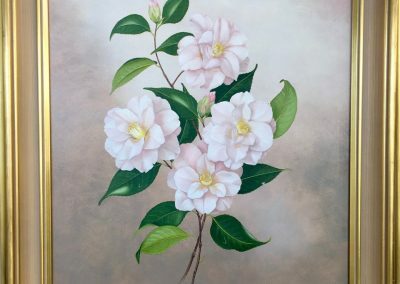 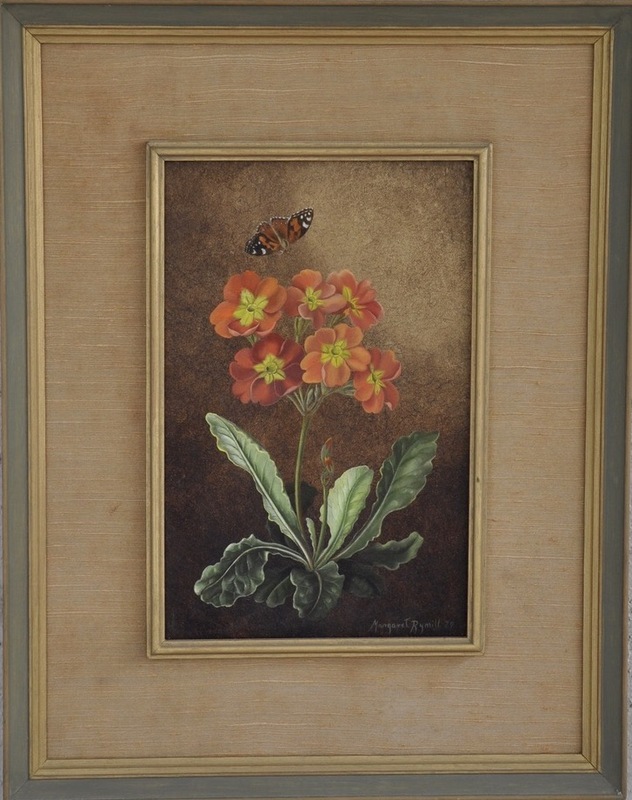 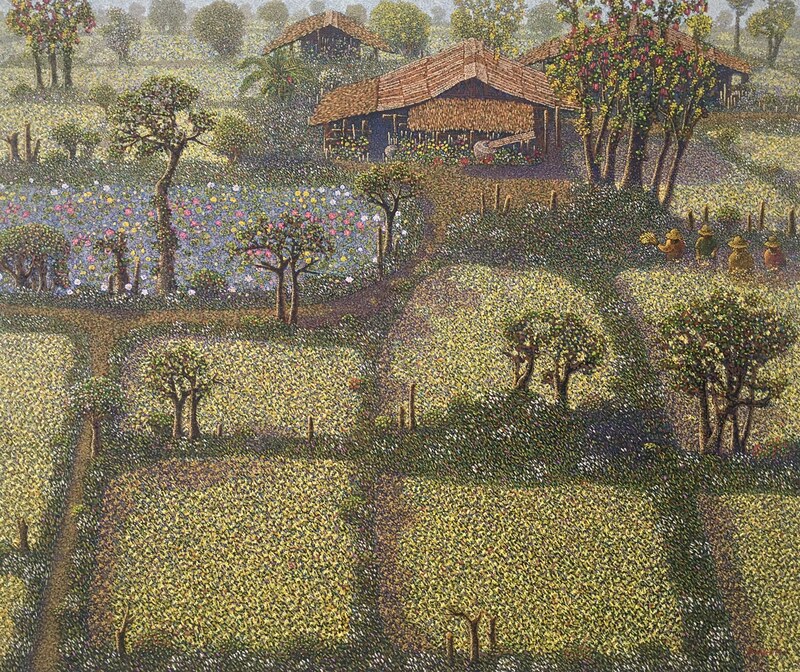 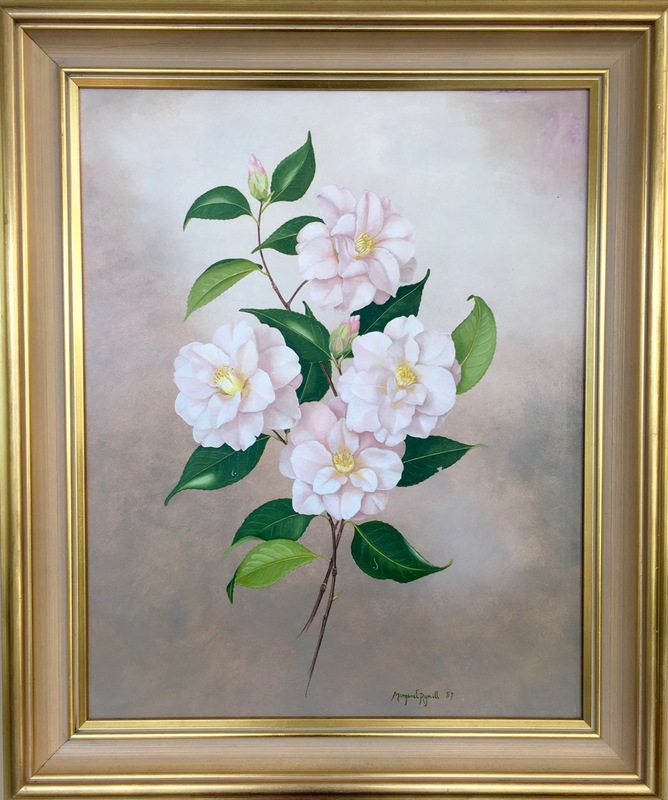 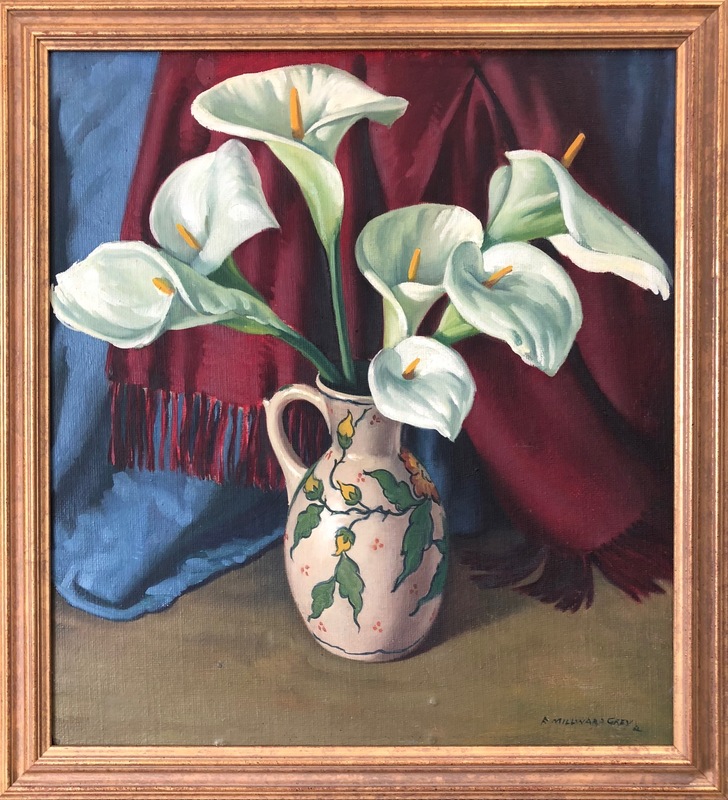 Margaret Rymill (1913-2004) Polyanthus, signed & dated 1979, oil on board. 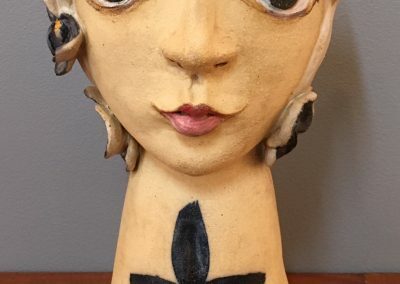 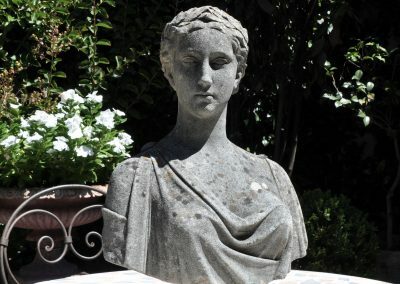 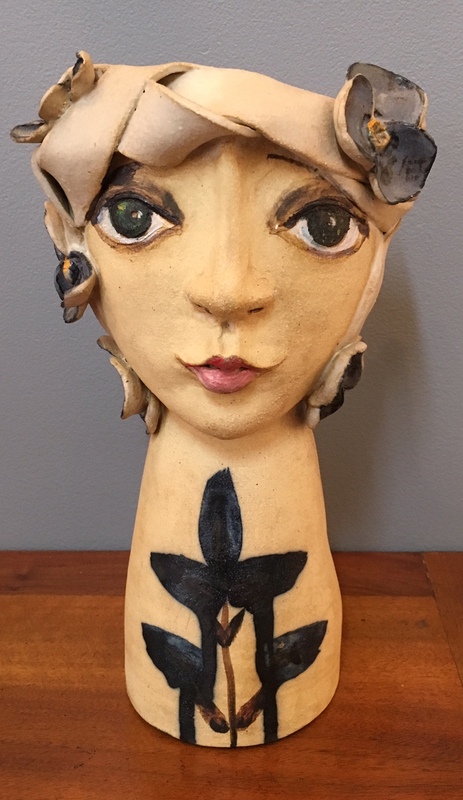 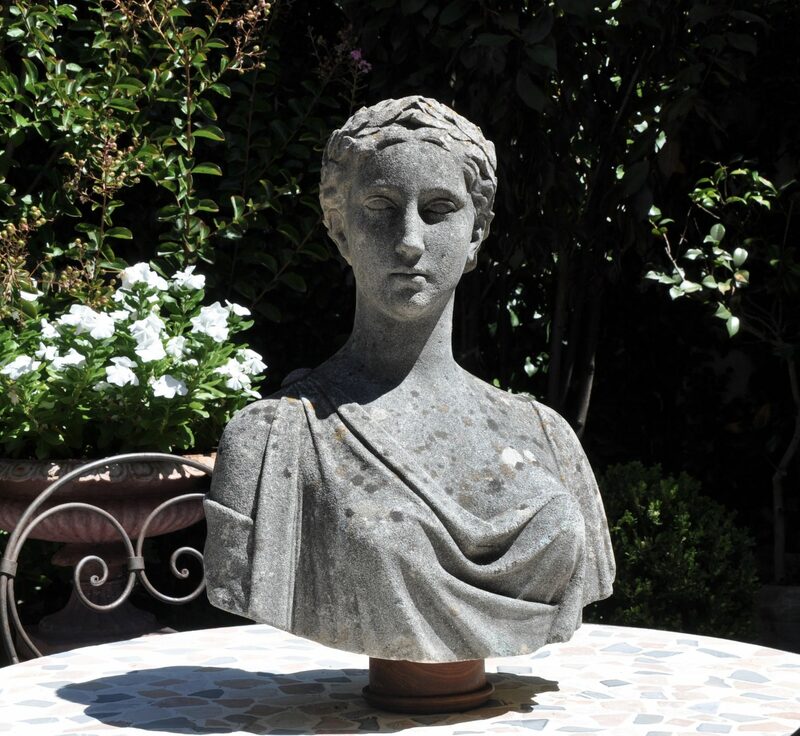 A reconstituted stone bust, English circa 1920. 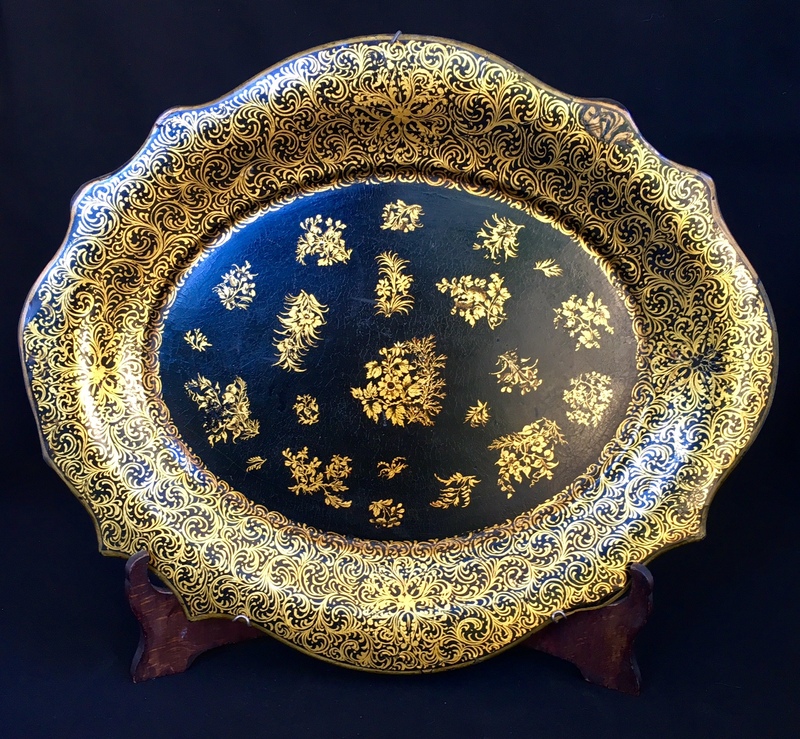 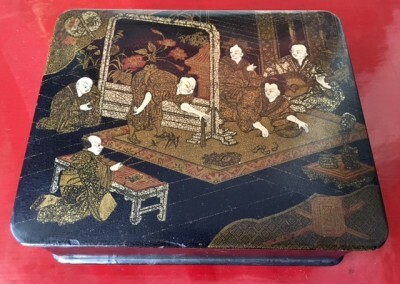 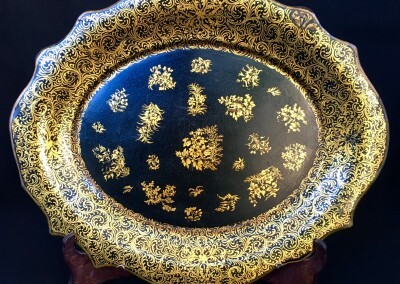 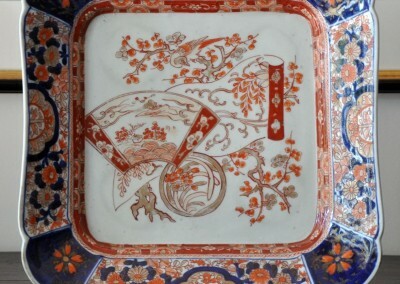 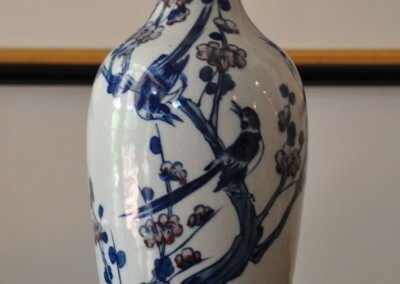 An Imari charger circa 1890. 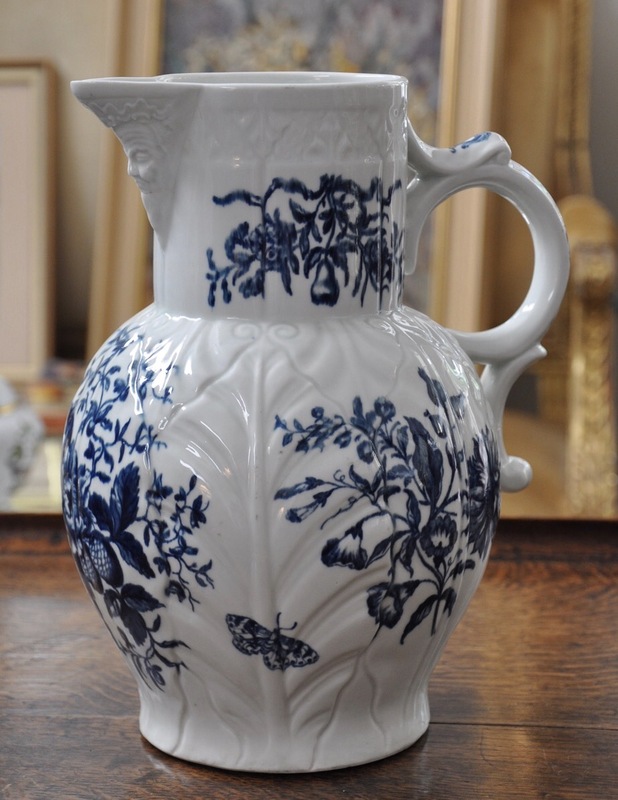 A 1st period Worcester jug circa 1770-1780. 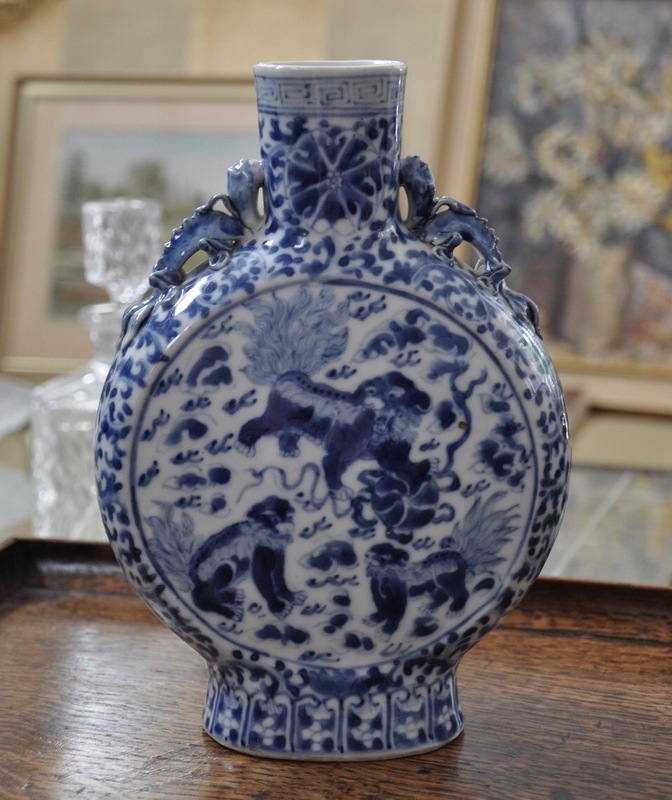 A Chinese moon flask c.1890. 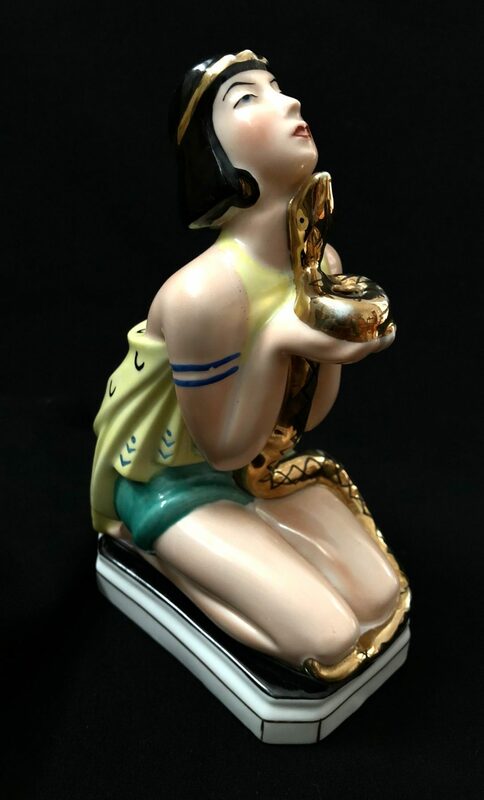 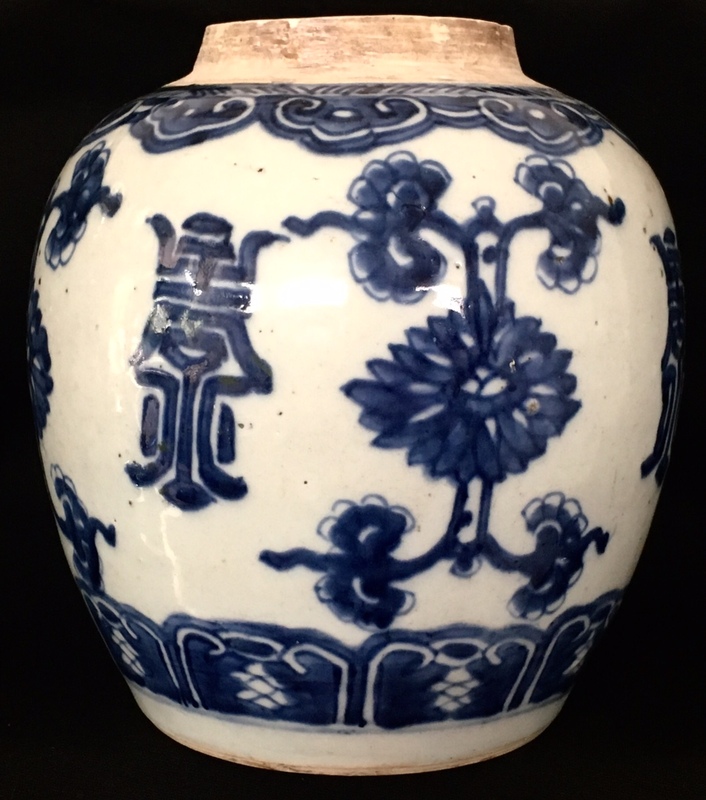 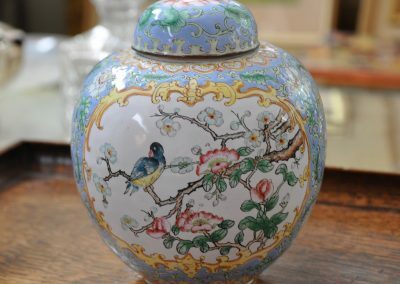 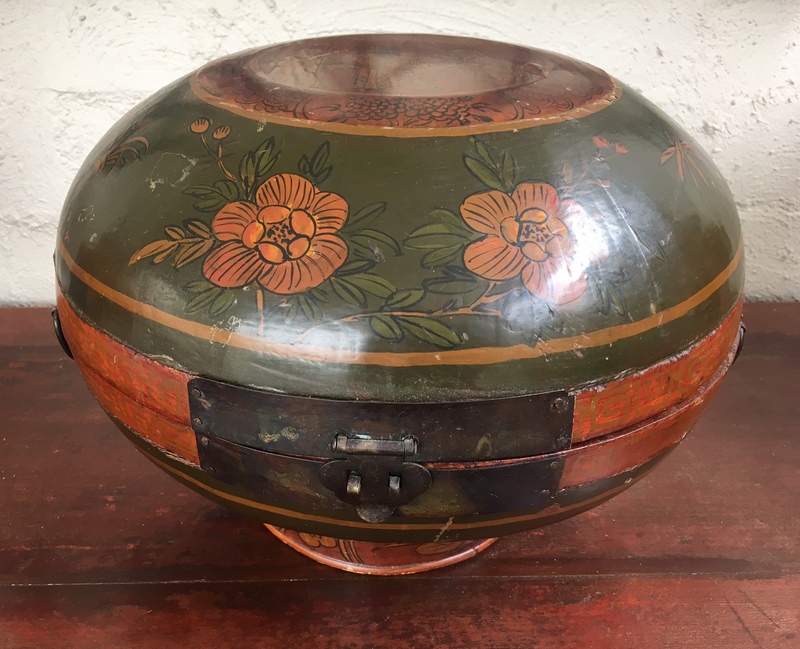 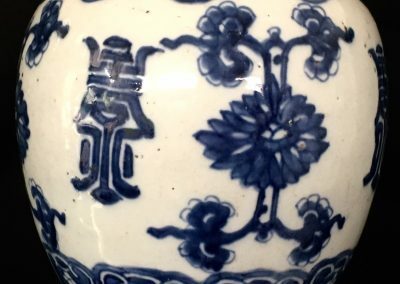 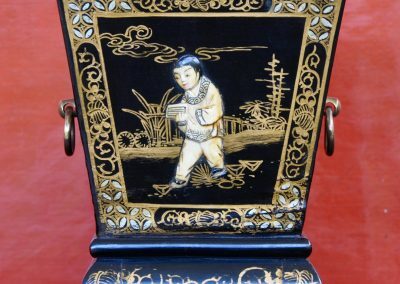 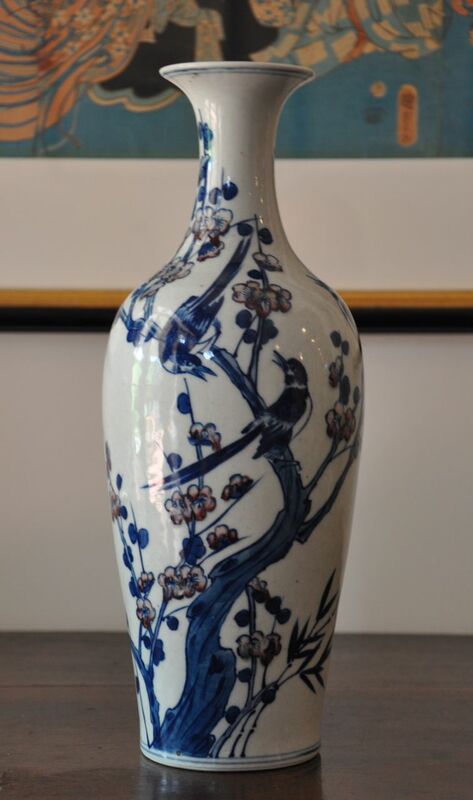 A Cantonese enamel ginger jar Circa 1900. 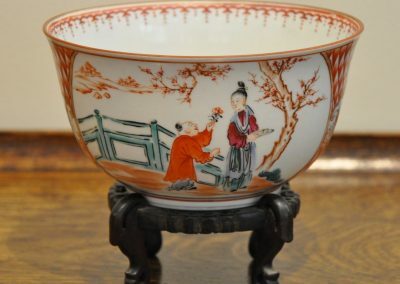 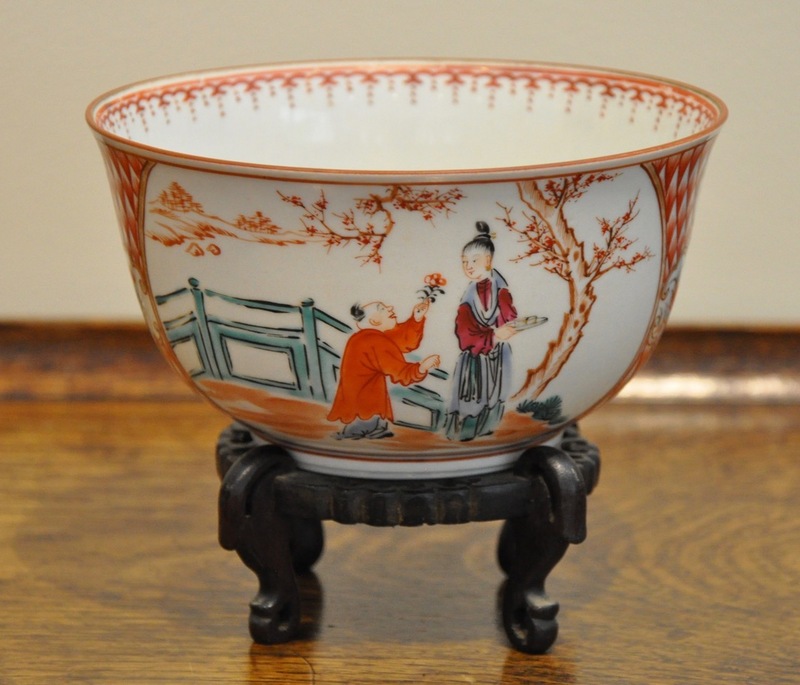 A Worcester bowl c.1780 on stand. 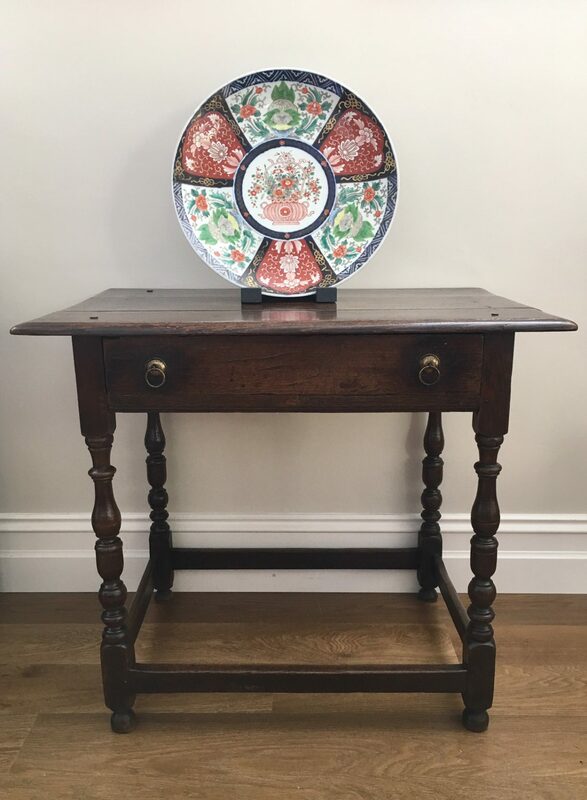 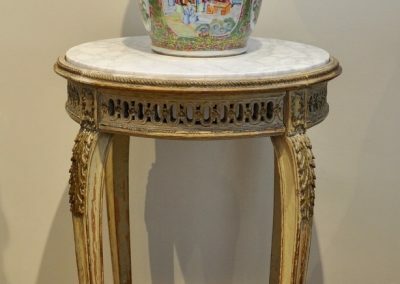 A French painted table with marble top c.1880. 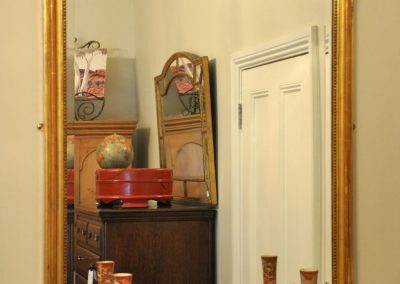 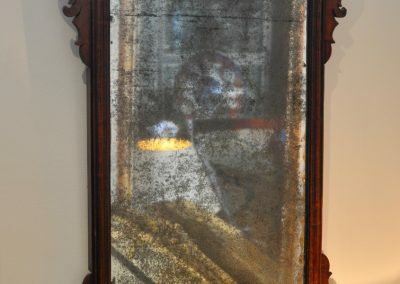 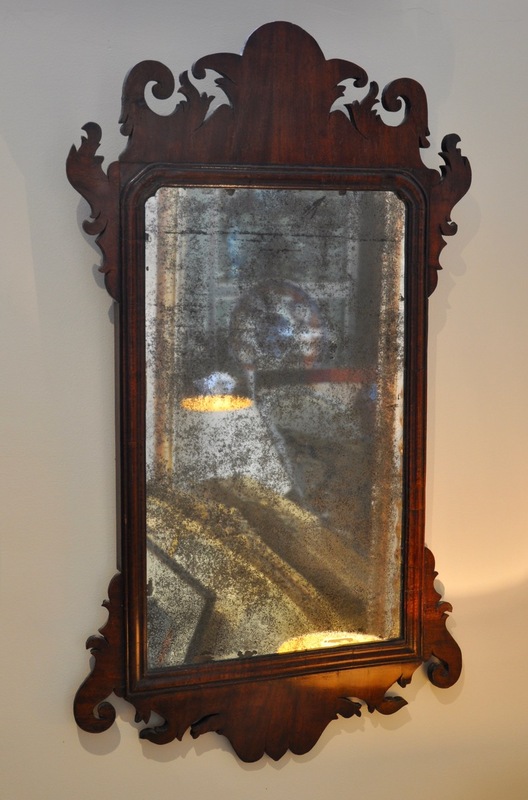 An 18th century fret mirror with original plate c.1760. 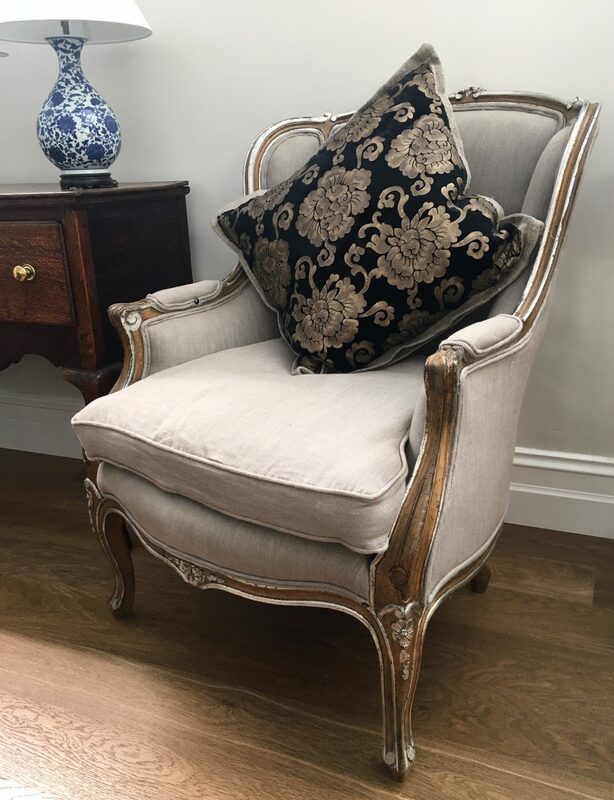 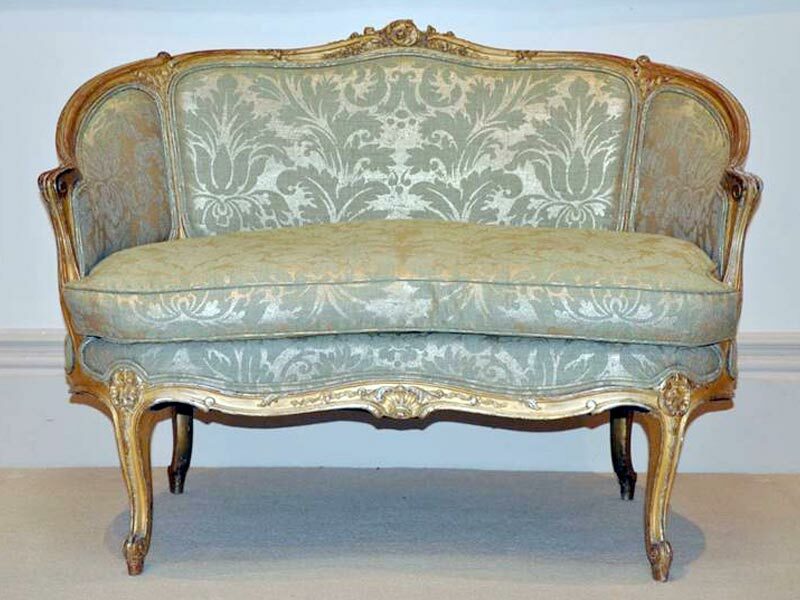 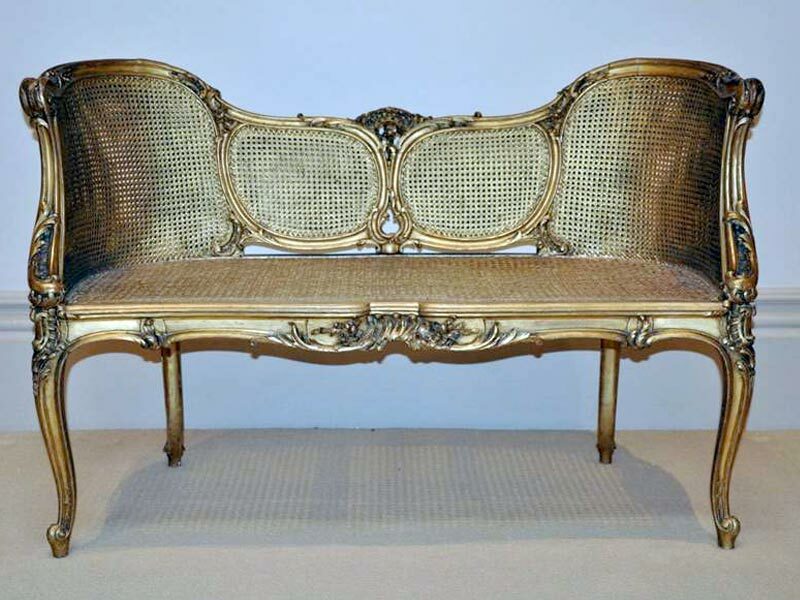 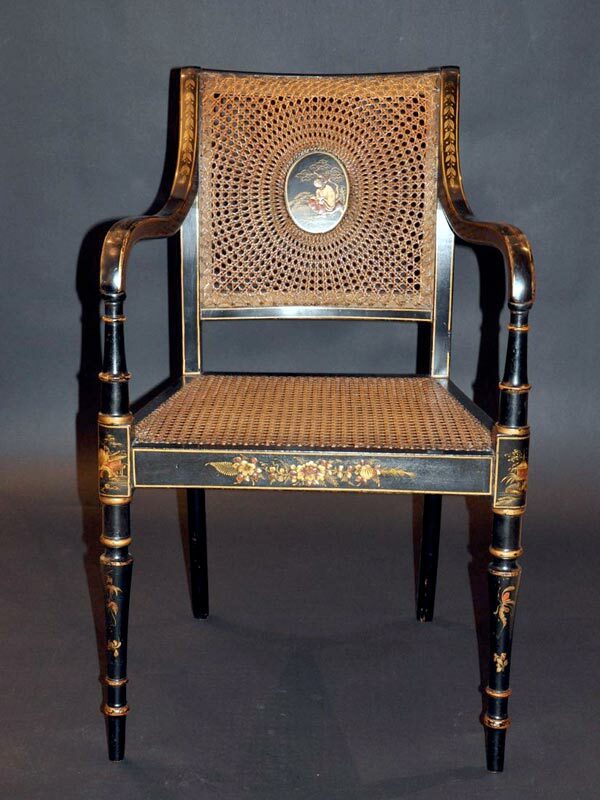 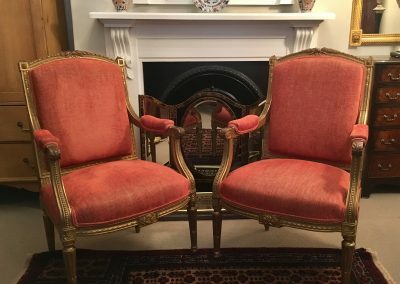 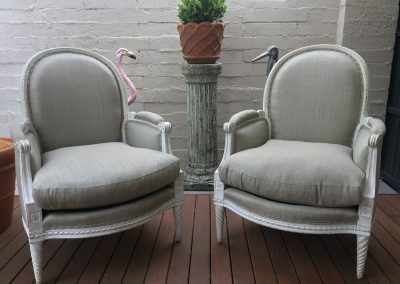 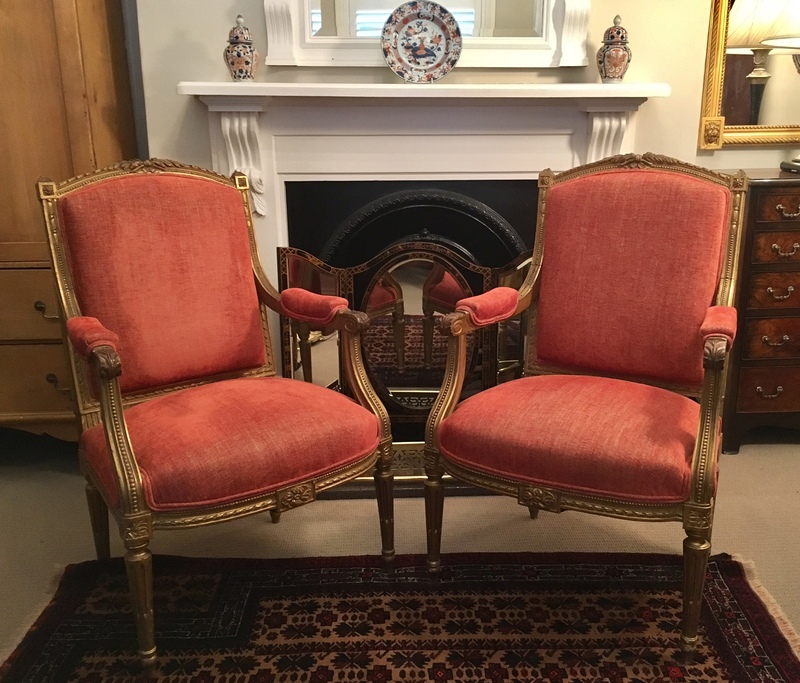 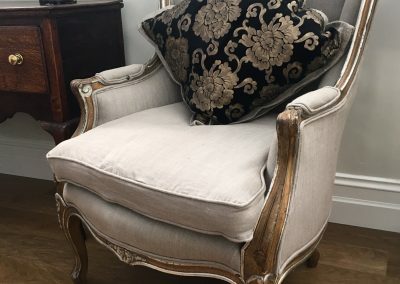 A pair of 19th century French chairs with giltwood frames. 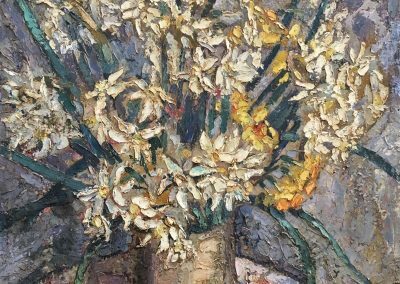 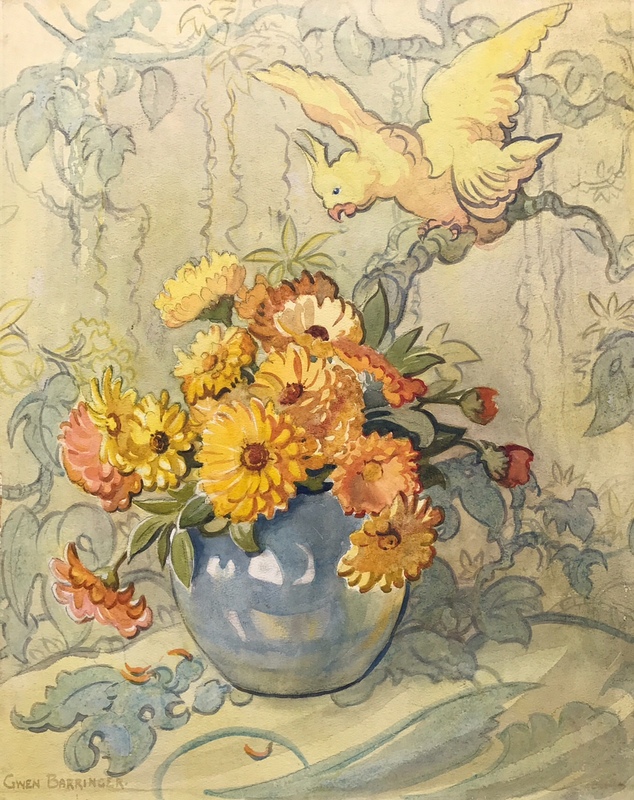 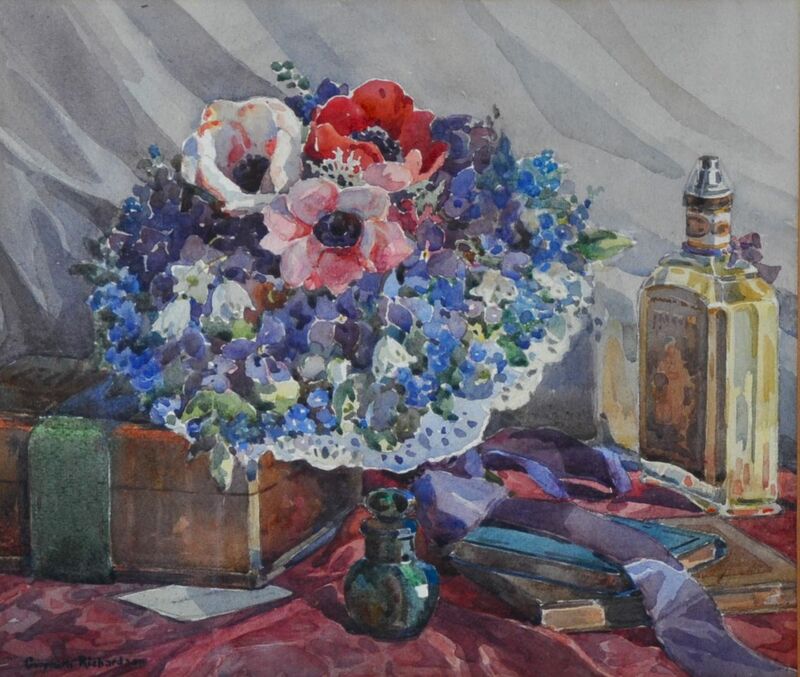 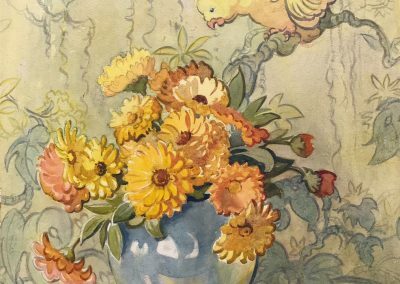 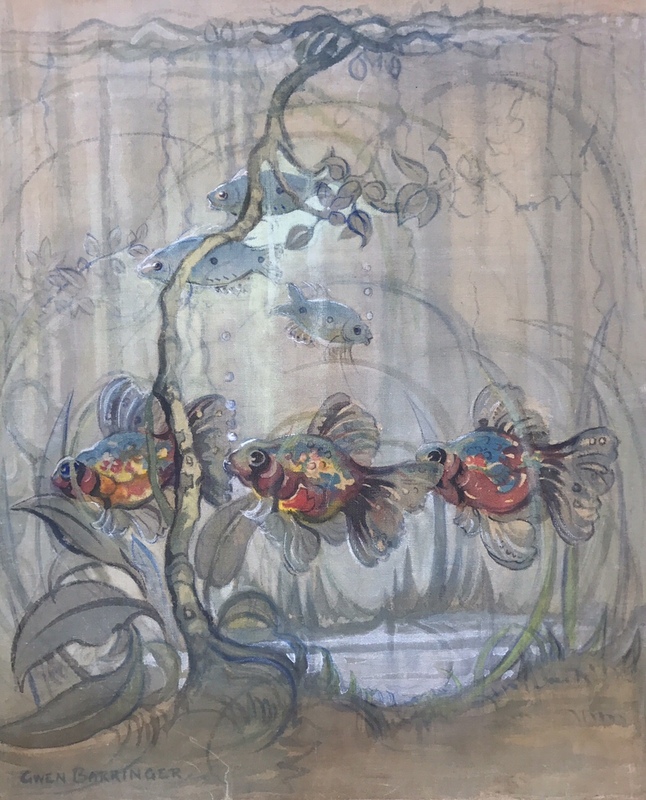 Marjorie Campbell Gwynne (1886-1958) Oil on board. 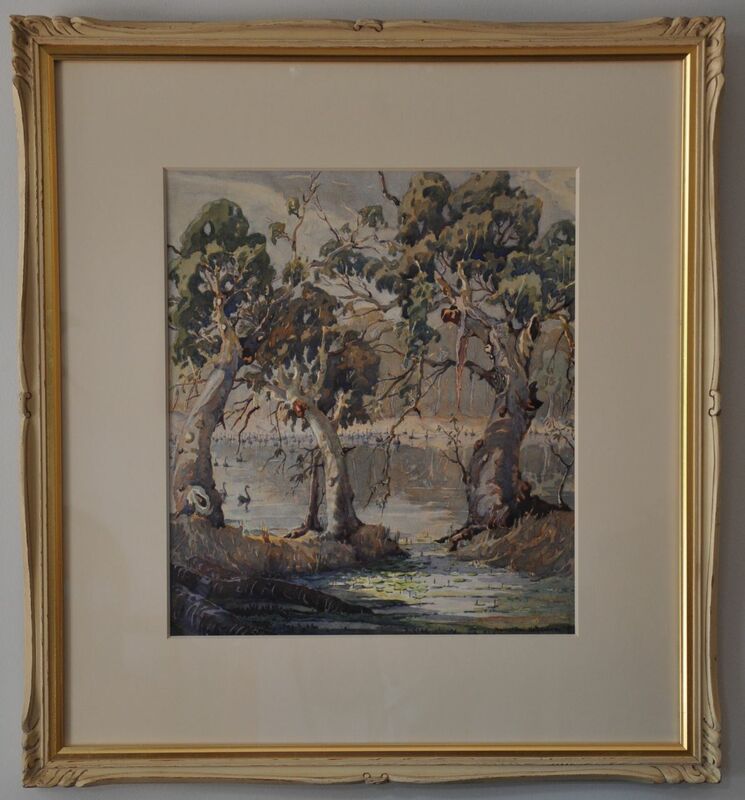 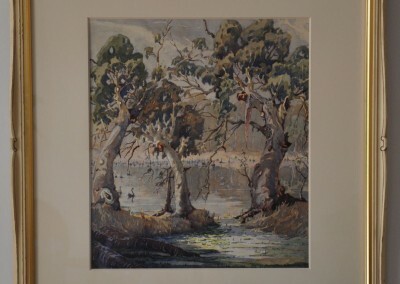 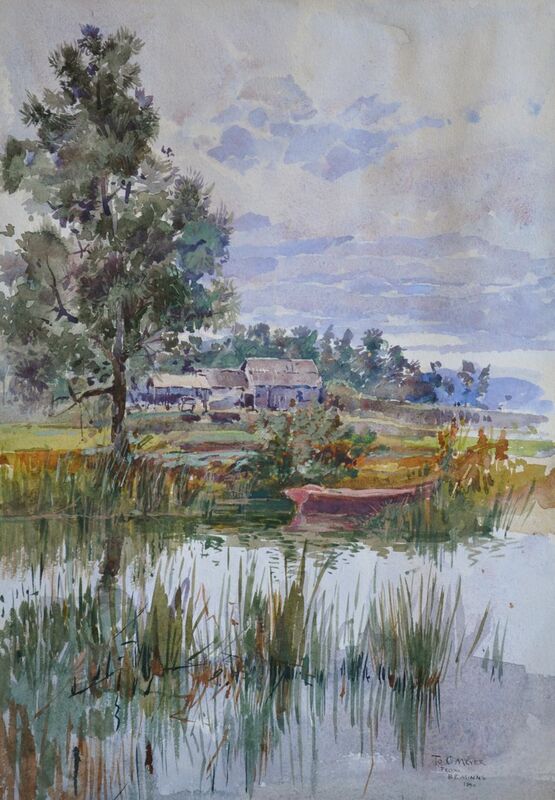 Herbert Barringer (1882-1960) Swans on the Murray 1946. 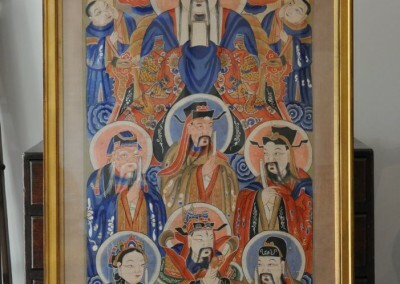 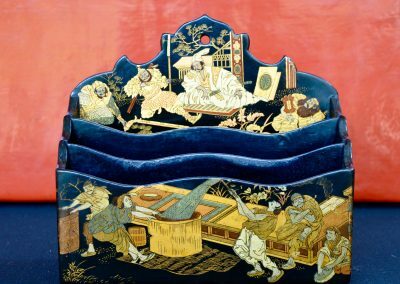 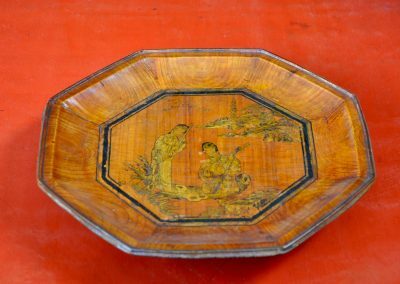 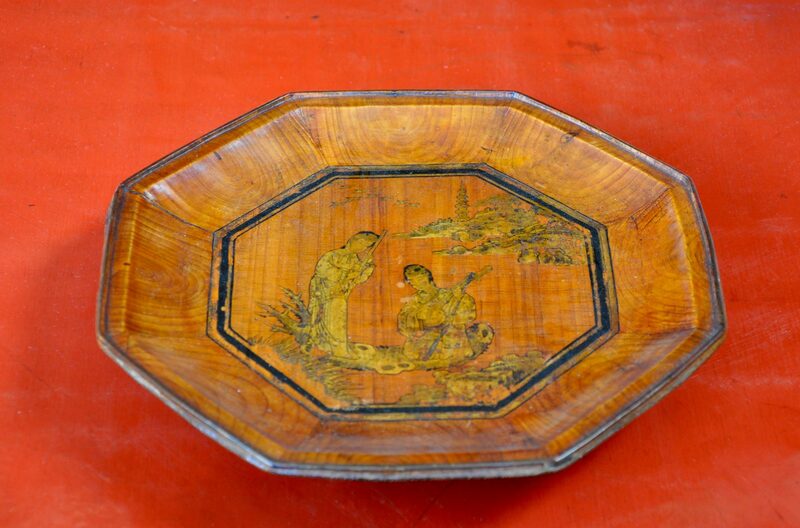 A Chinese lacqured food carrier. 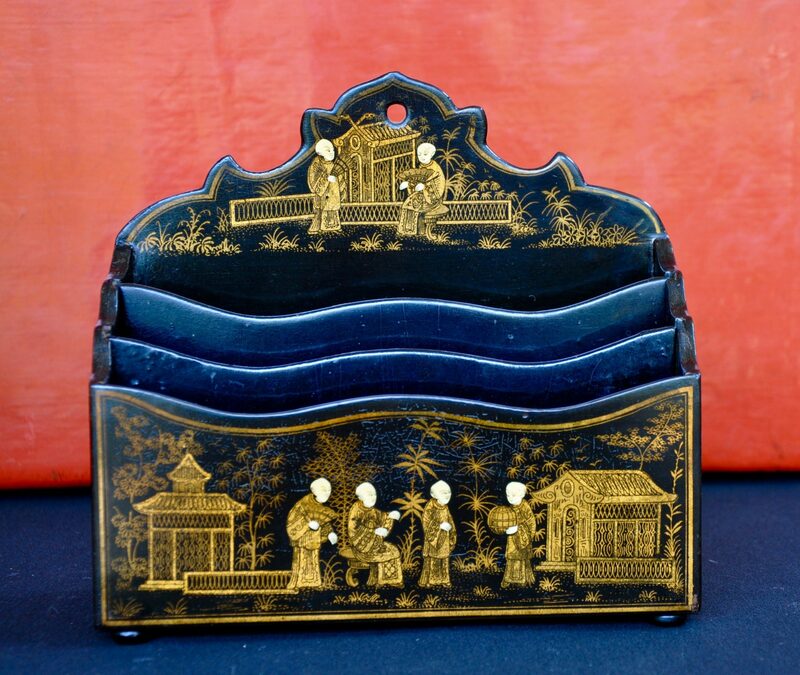 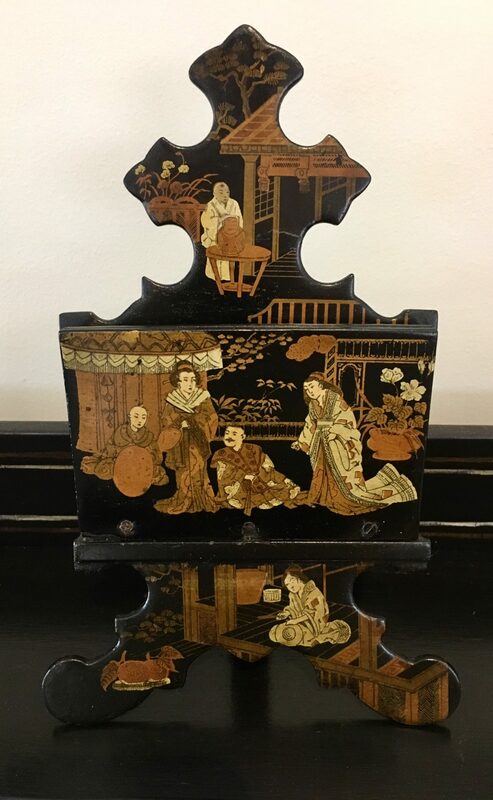 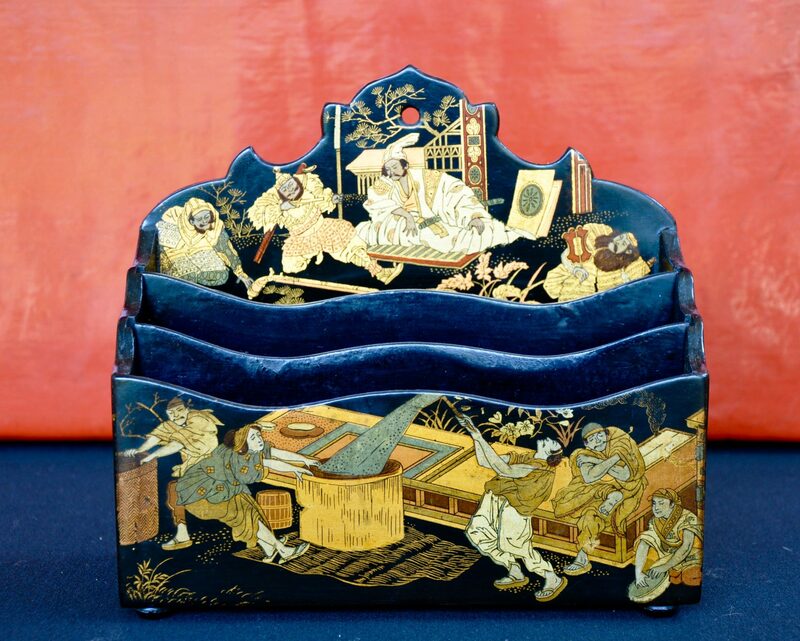 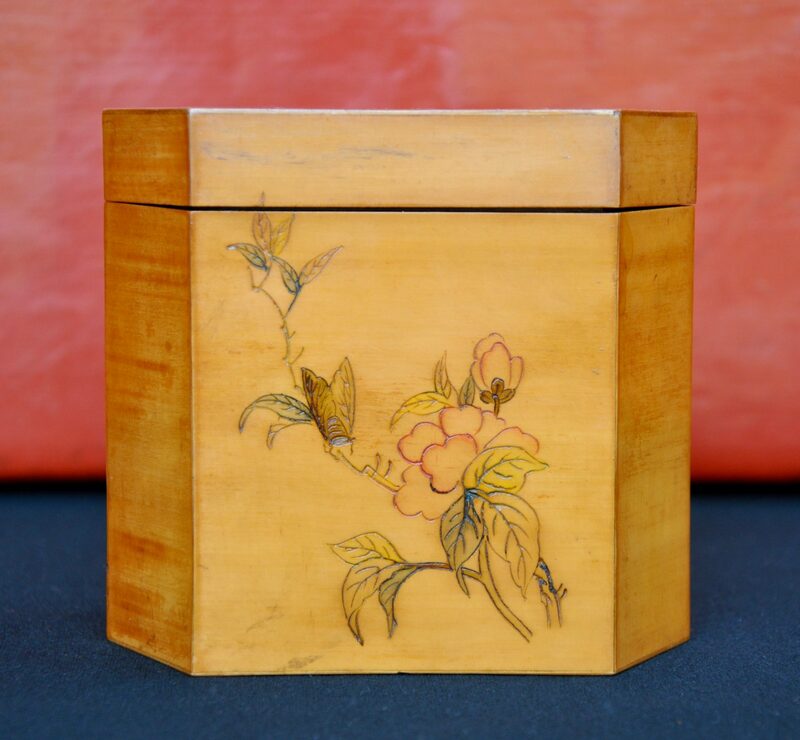 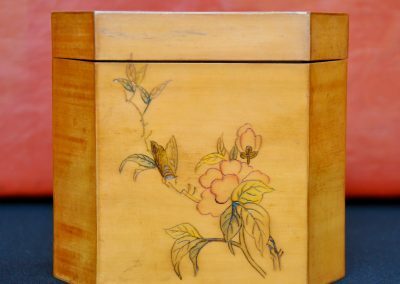 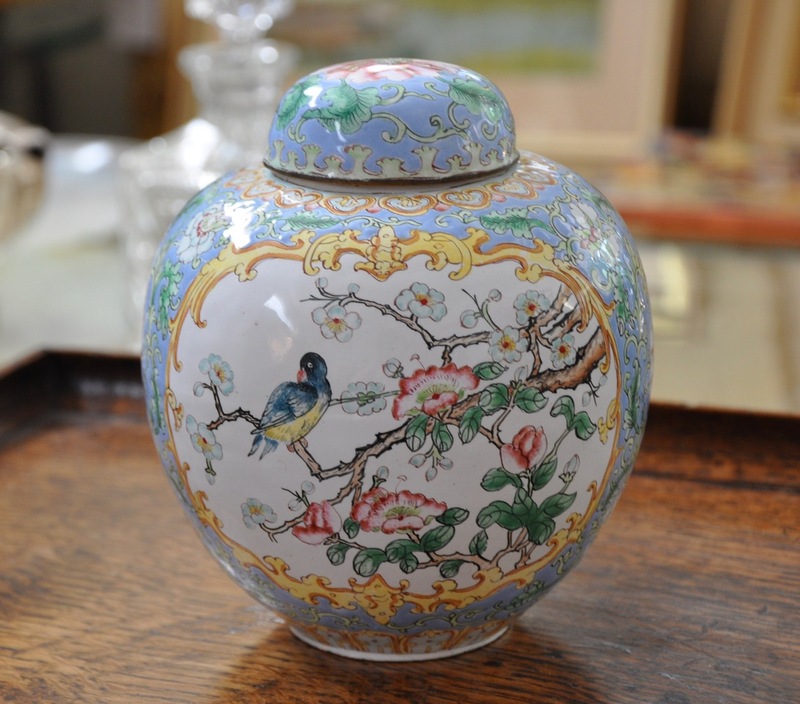 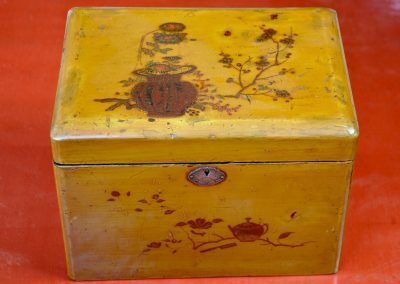 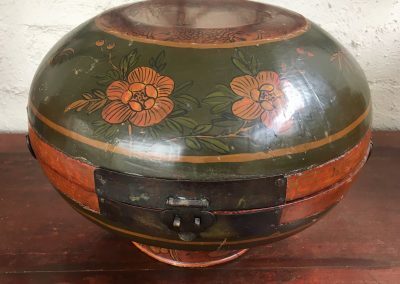 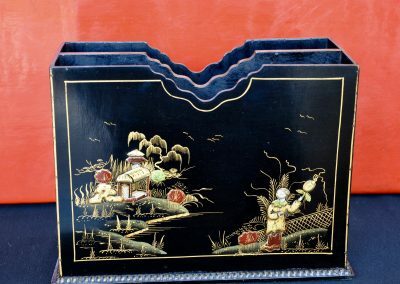 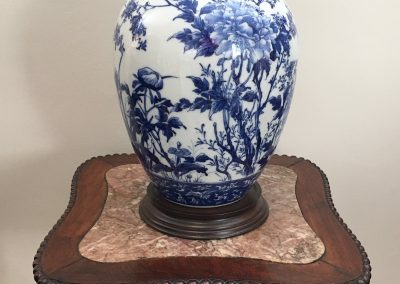 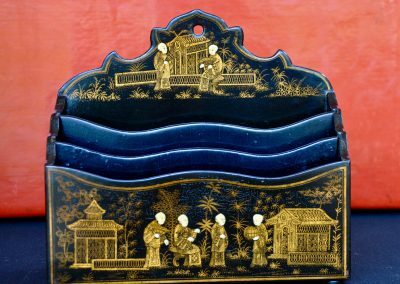 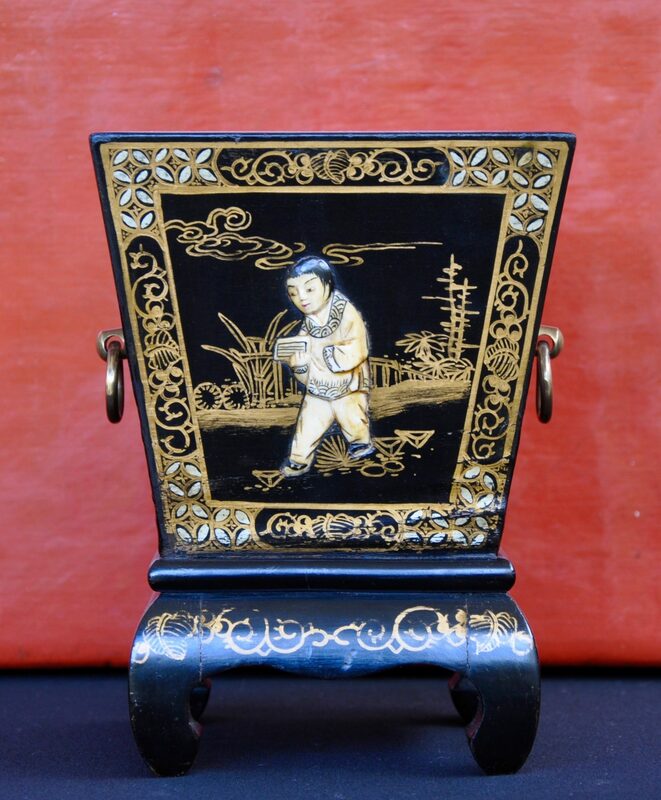 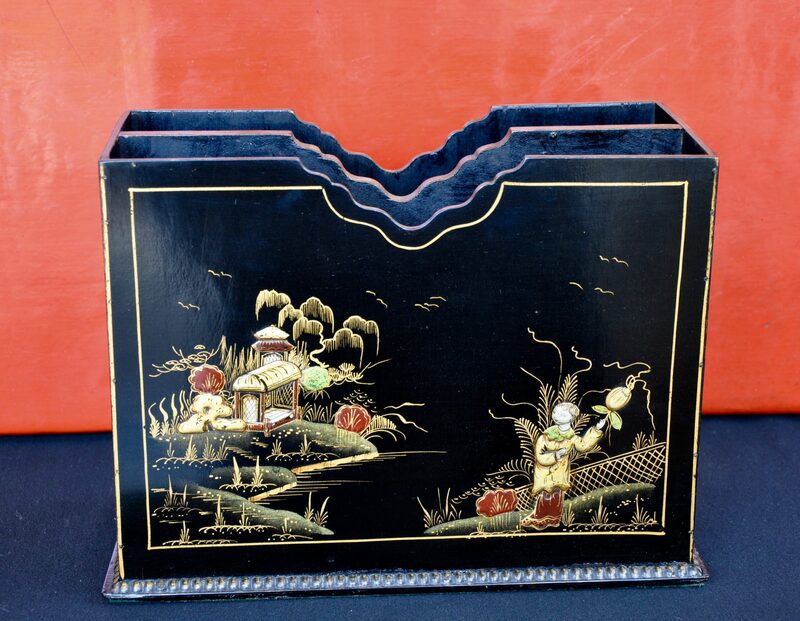 Chinese satinwood tea caddy. 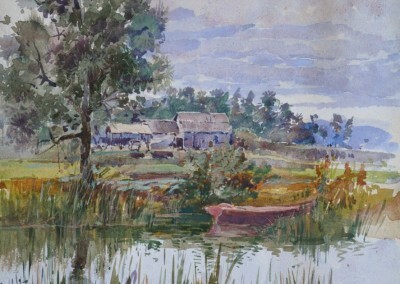 Signed, c.1900. 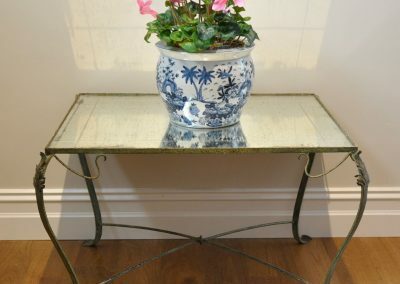 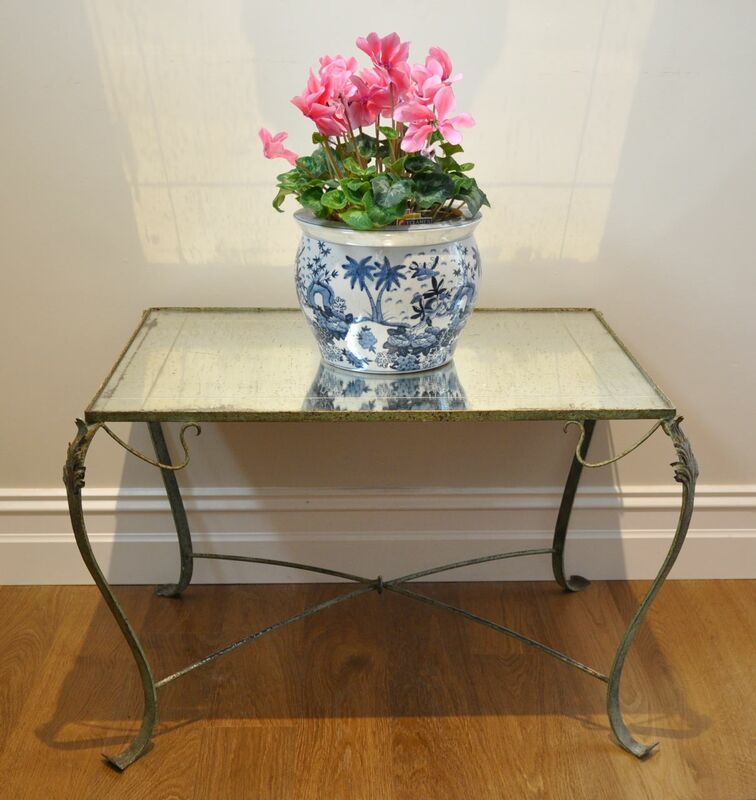 A French iron table with original mirror top c.1920. 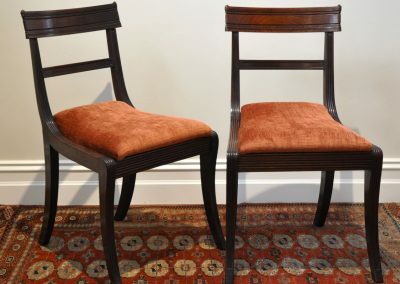 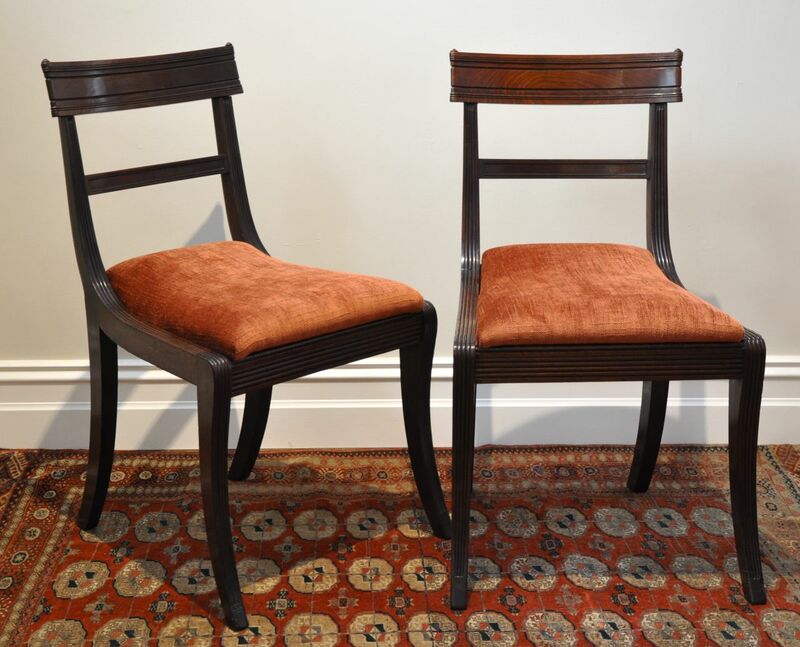 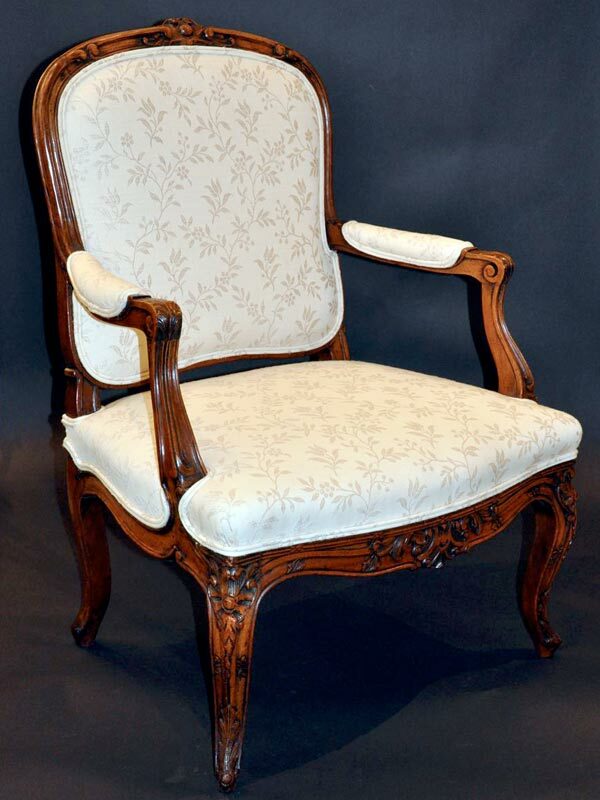 A pair of Regency mahogany chairs. 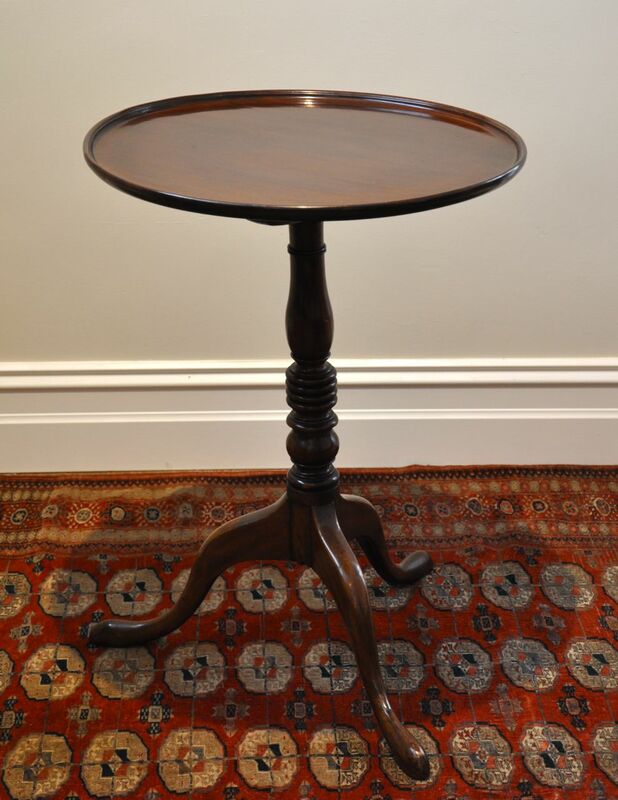 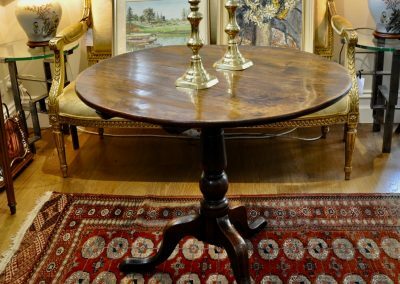 A Geo III mahogany tilt top table. 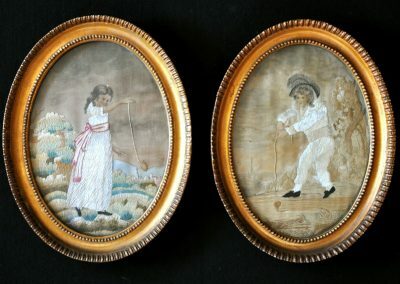 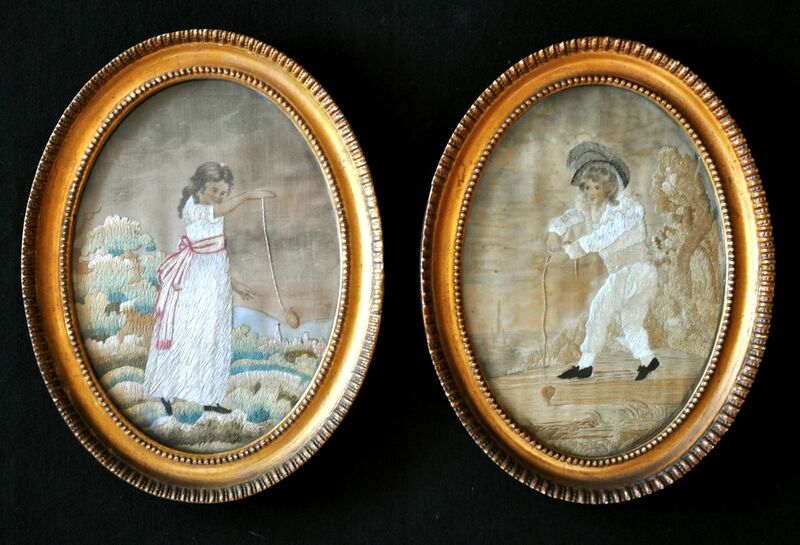 A pair of Regency period needleworks in original frames. 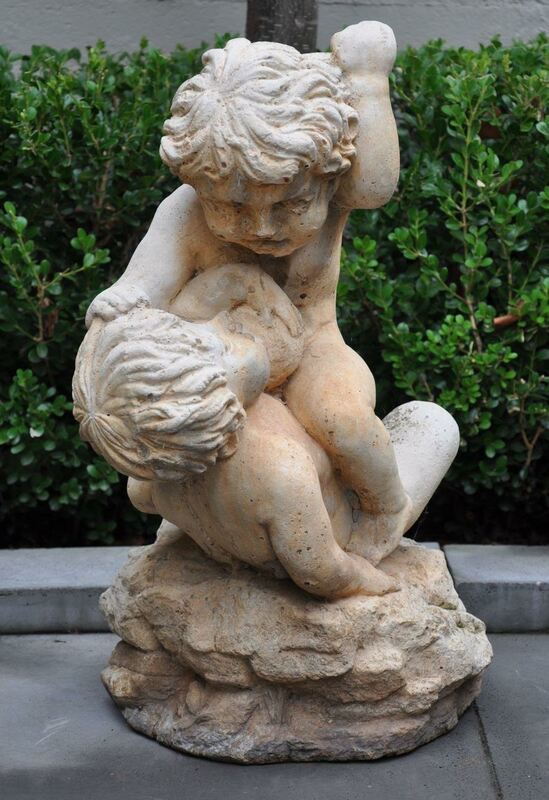 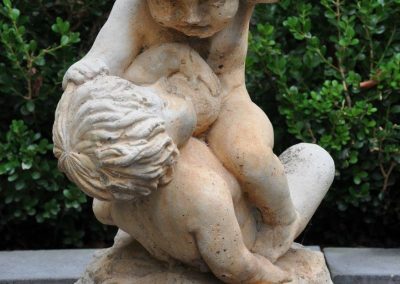 A figural group of boys play fighting. 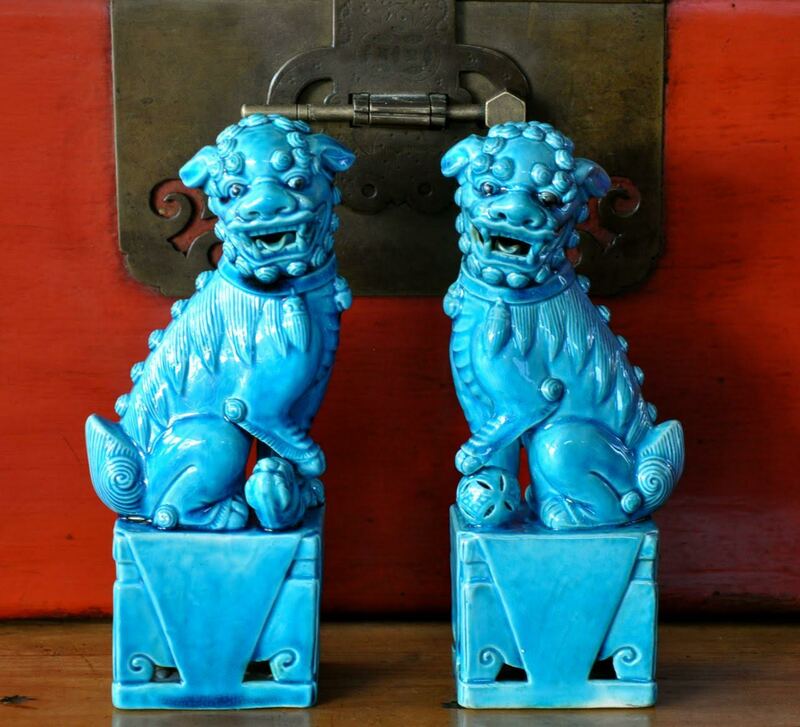 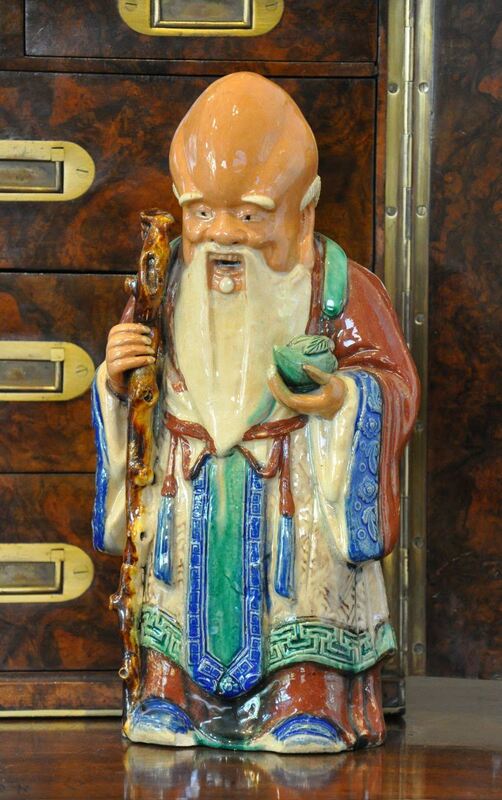 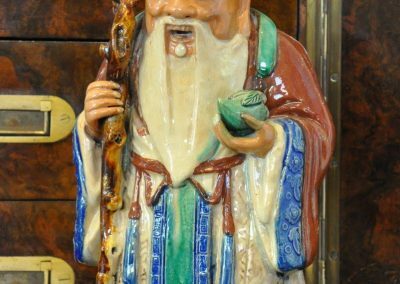 Pair of Chinese studio pottery temple dogs. 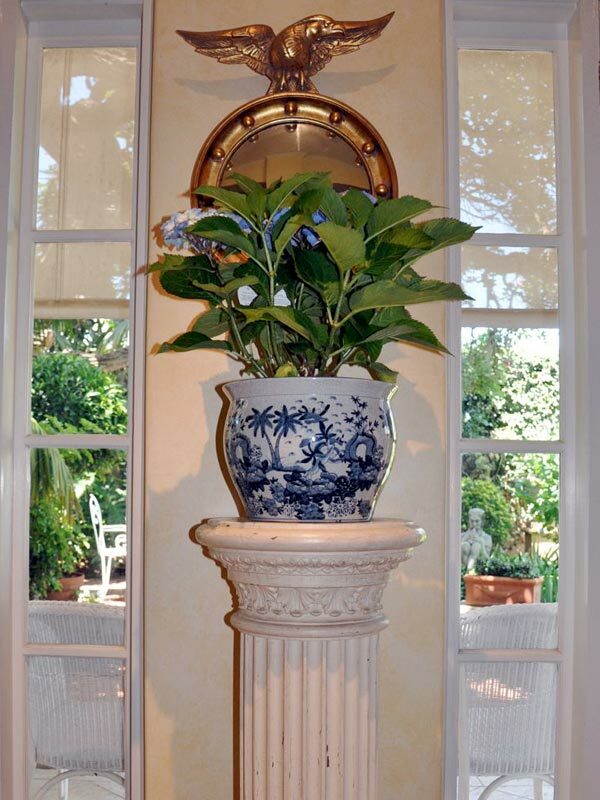 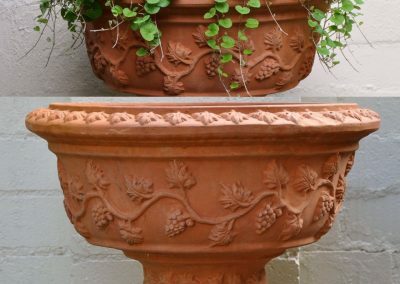 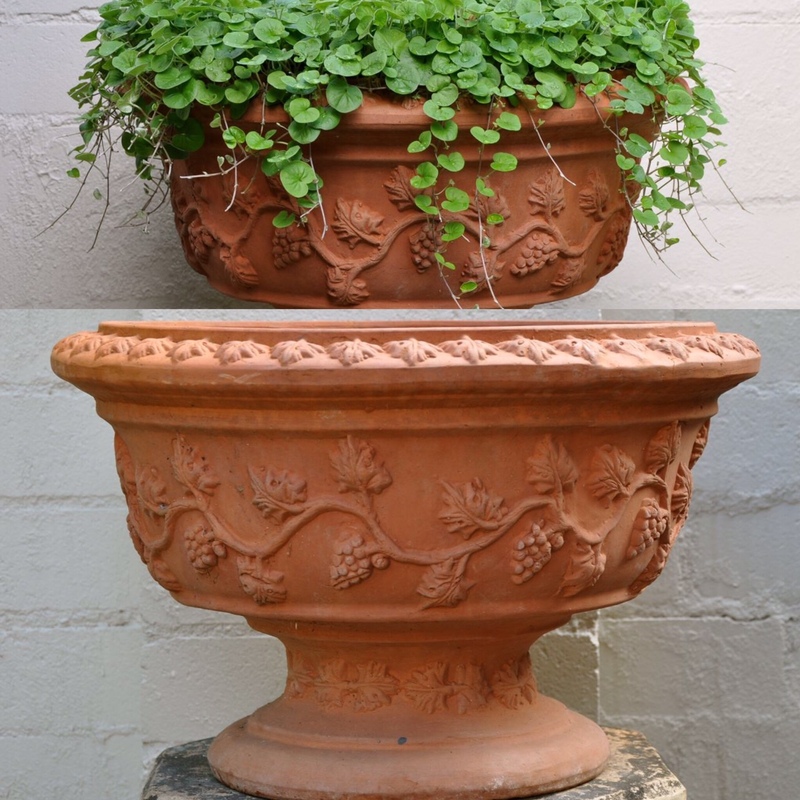 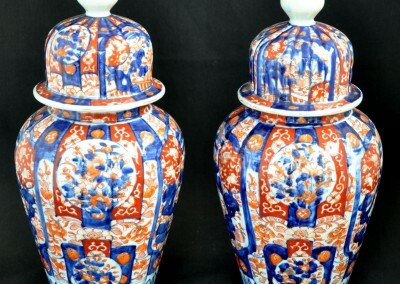 A pair of Italian terracotta urns. 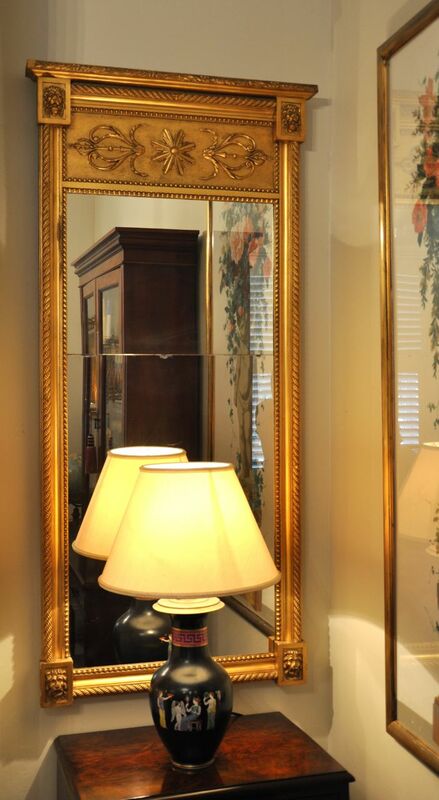 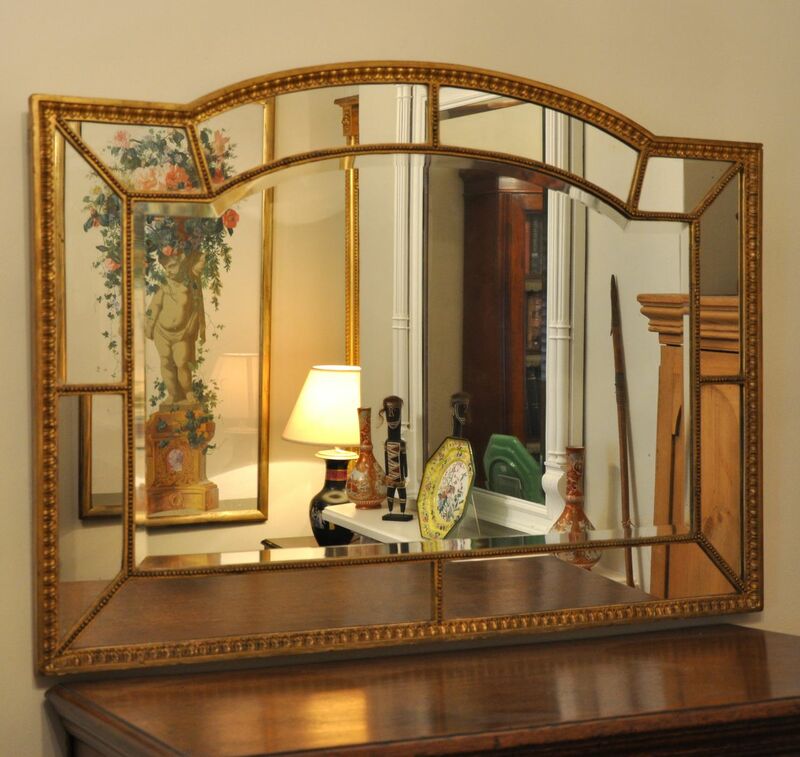 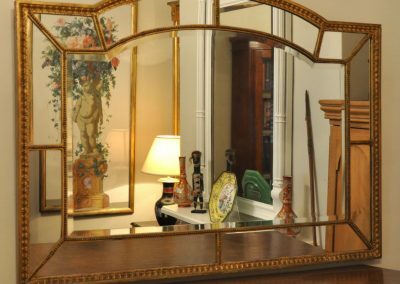 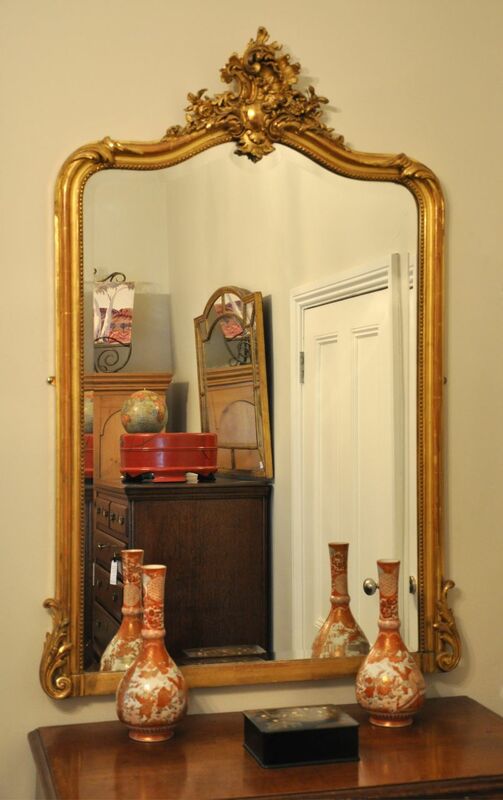 A Gilt Sectional Mirror c.1900. 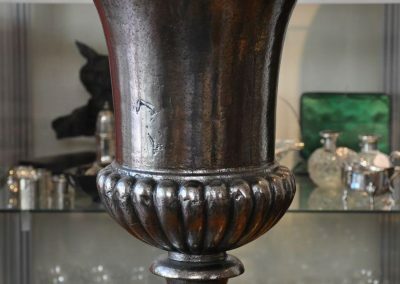 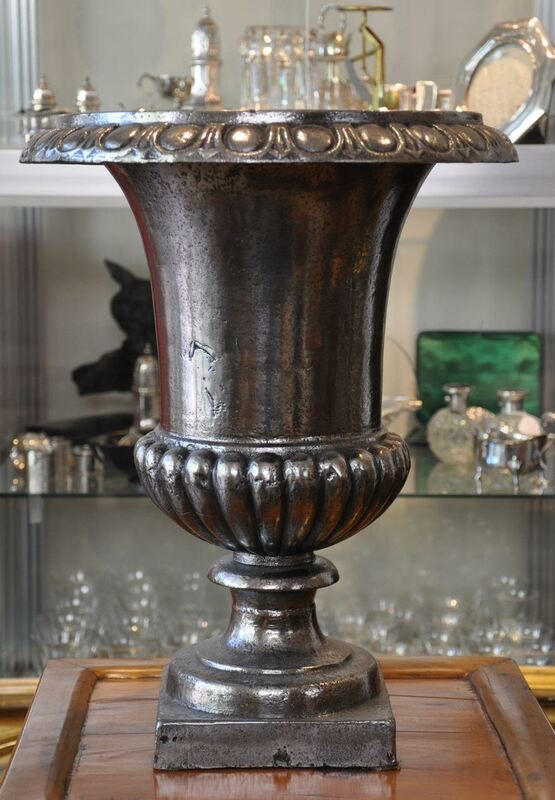 A 19th century polished cast iron urn. 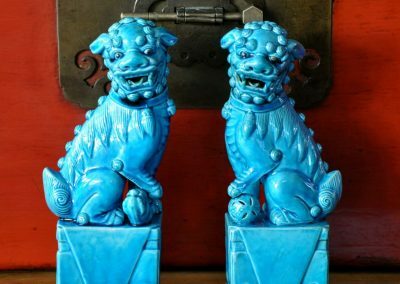 A pair of copper fire dogs c.1910. 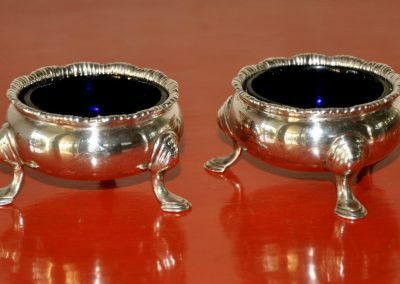 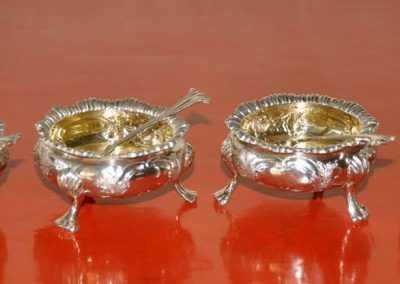 Pair of Sterling Silver Salts. 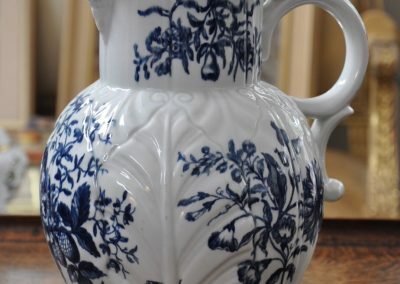 London 1736. 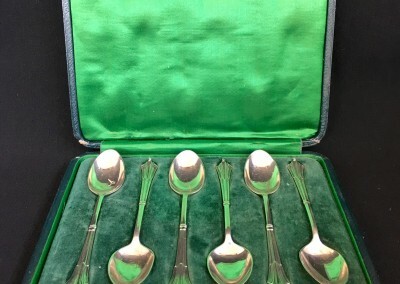 A set of four Sterling Silver Salts with spoons. 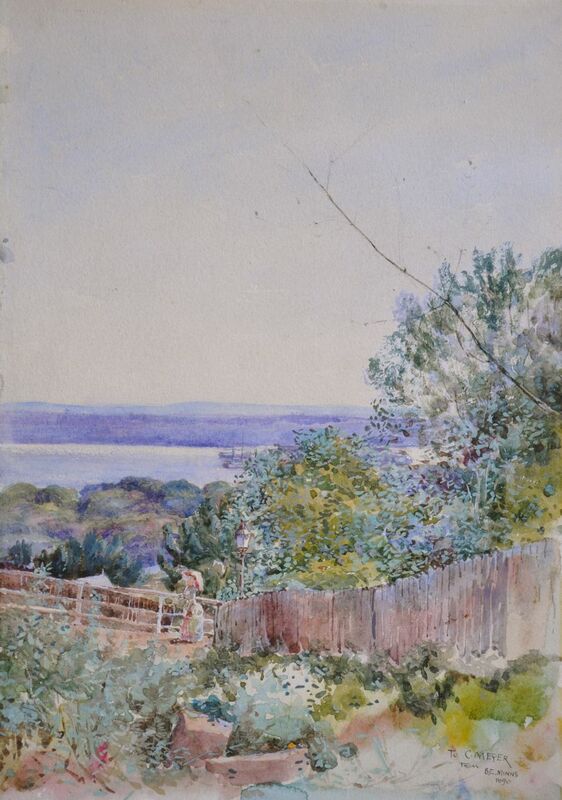 London 1890. 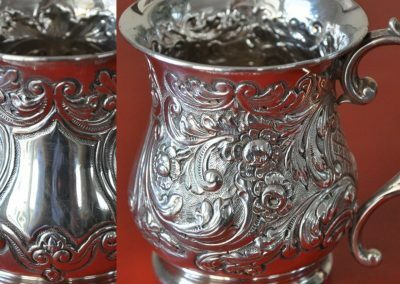 Sterling Silver Christening Mug. 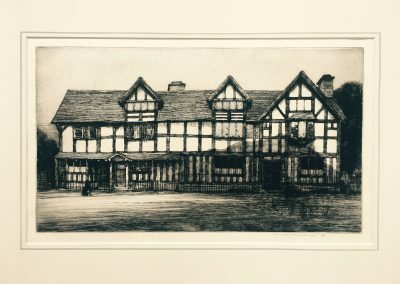 Birmingham 1903. 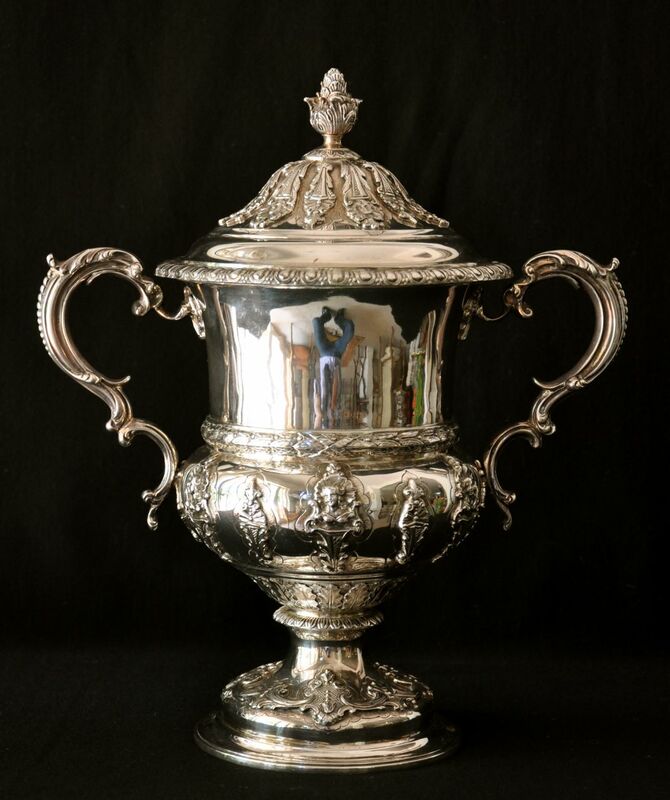 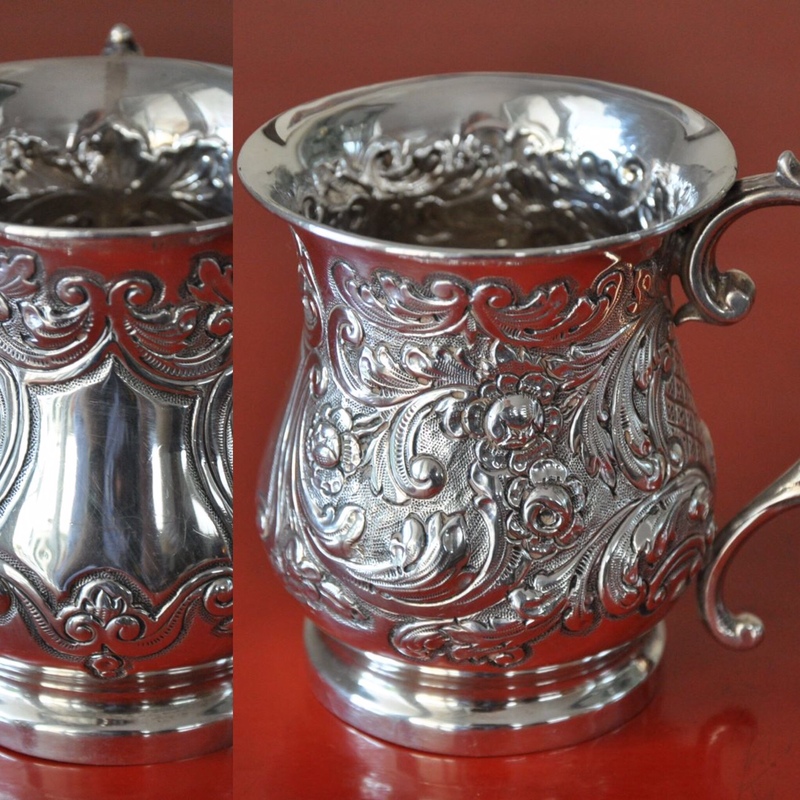 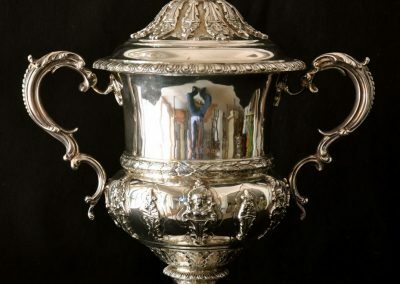 A Sterling silver lidded presentstion cup. 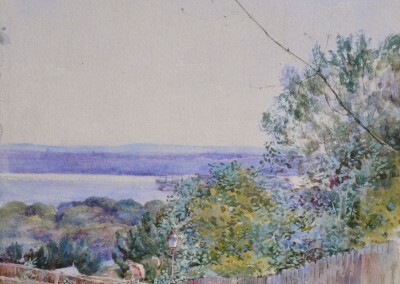 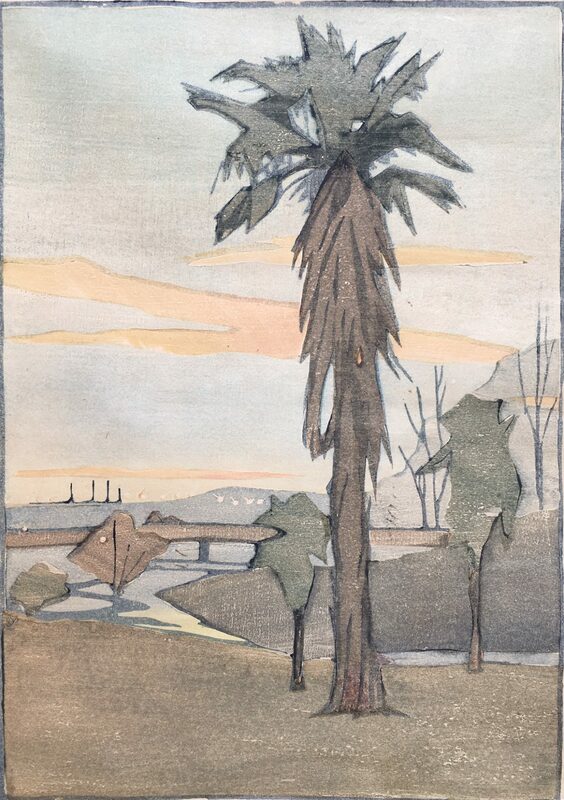 London 1903 H. 34cm. 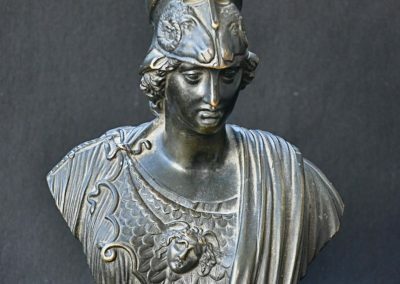 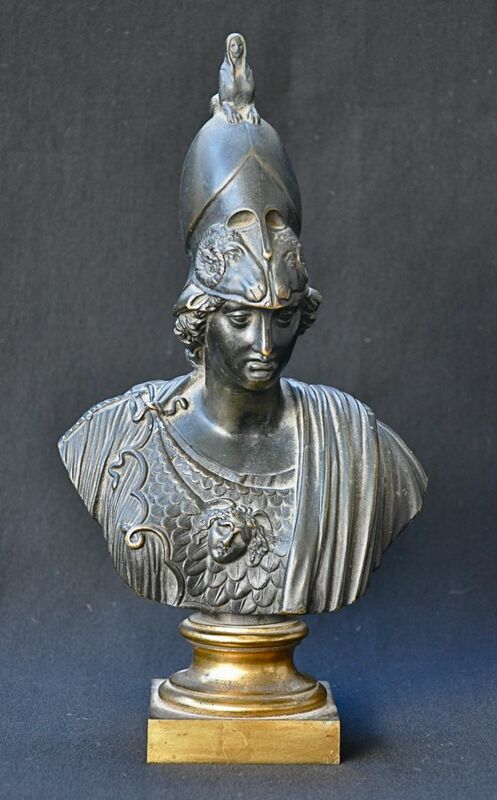 Bronze bust of Athena on brass base. 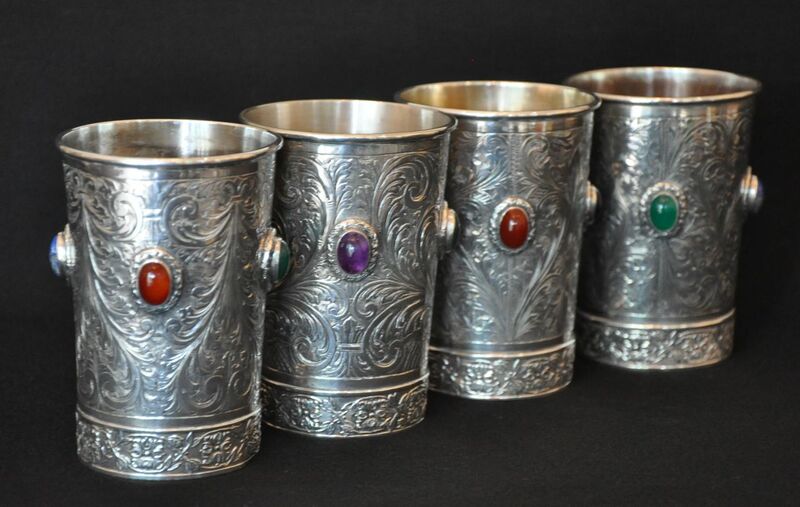 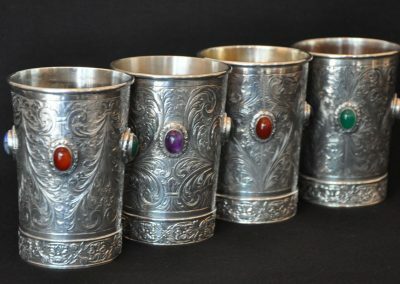 A set of four silver beakers inset with stones. 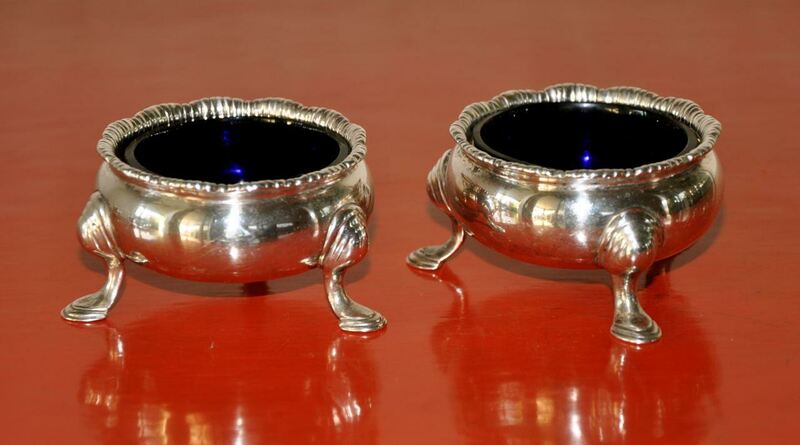 Coppini Silversmith Florence. 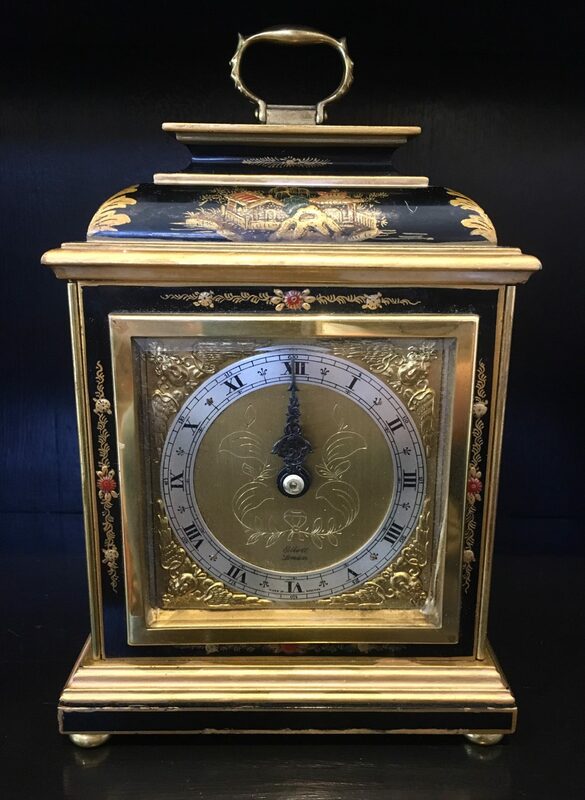 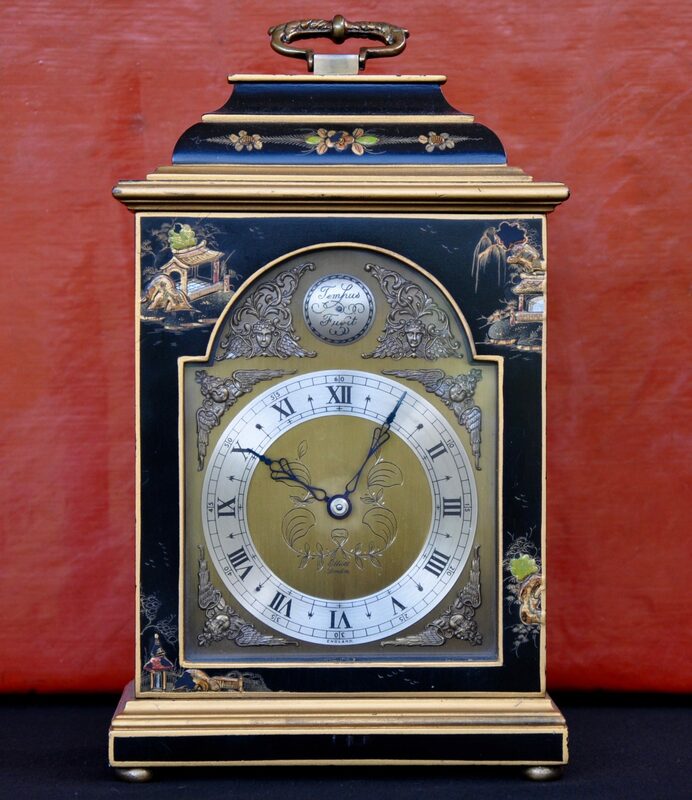 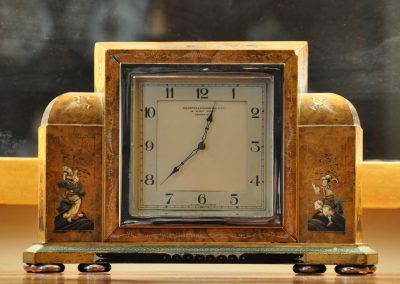 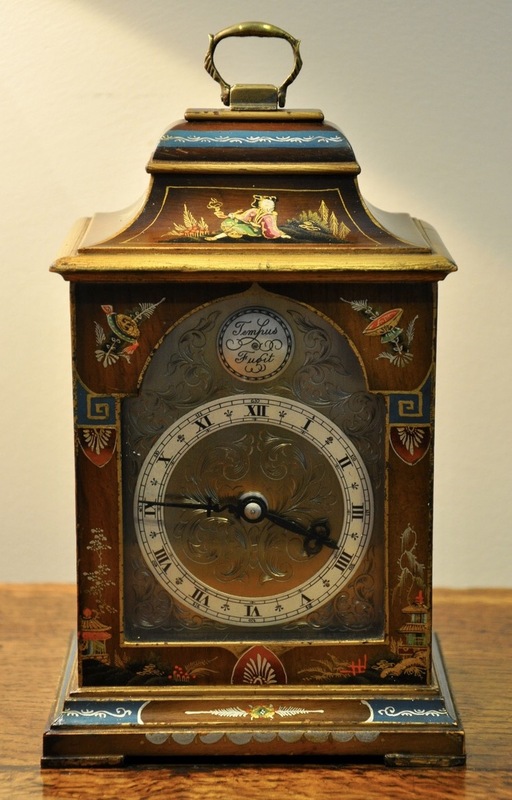 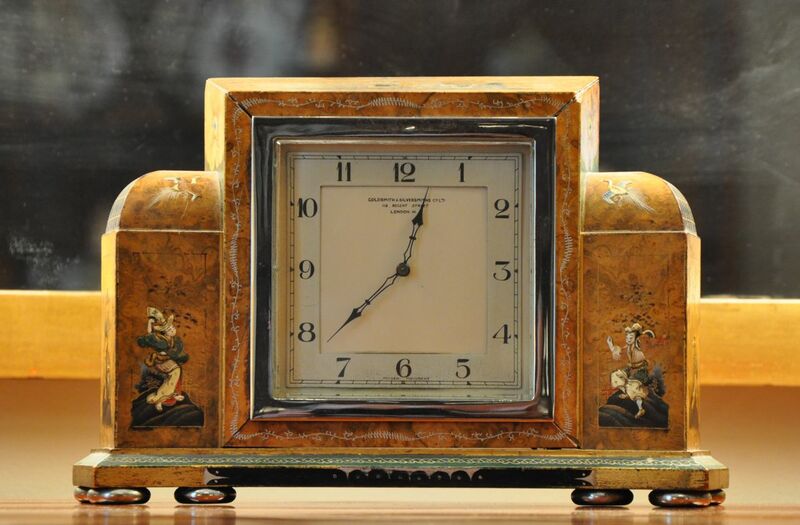 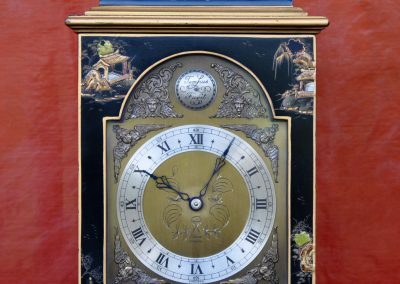 Art Deco Mantle Clock with Chinoiserie decoration c.1930. 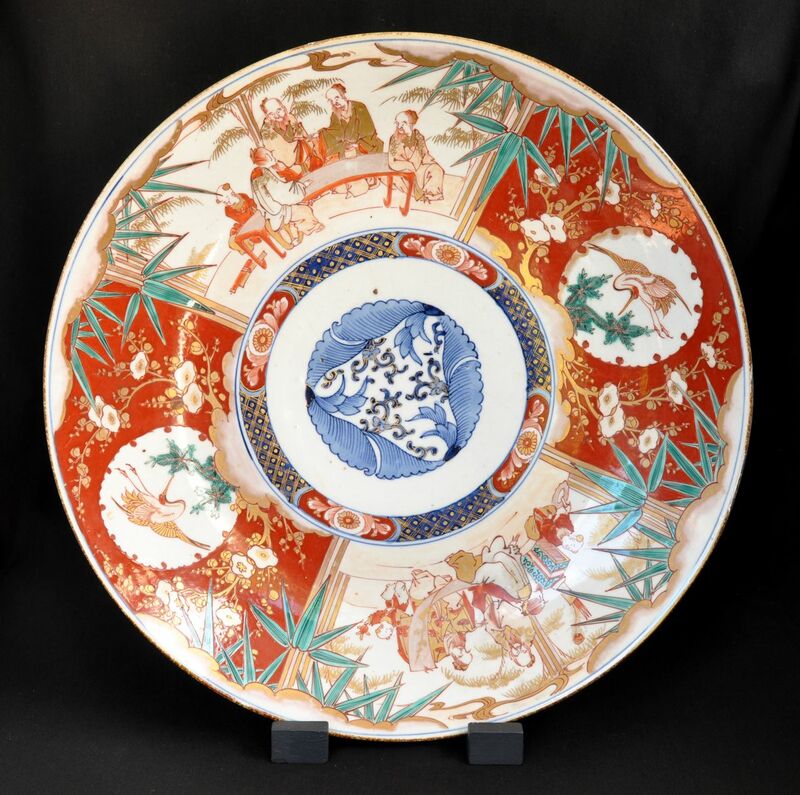 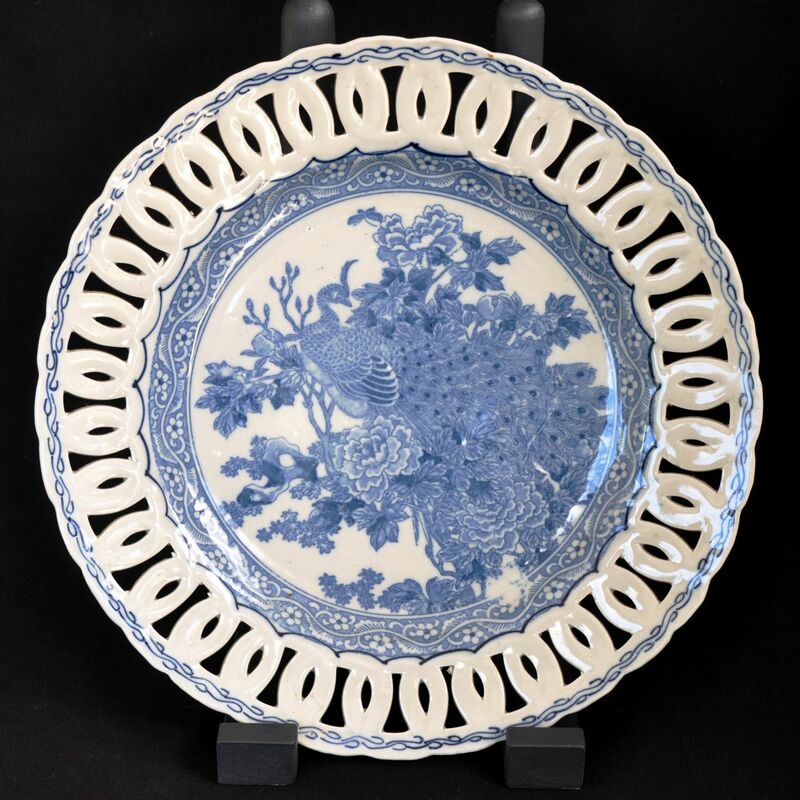 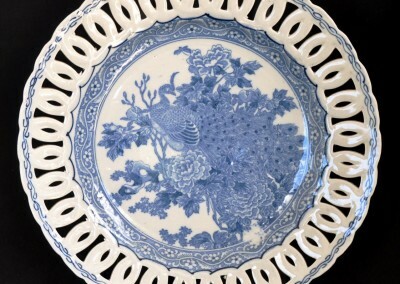 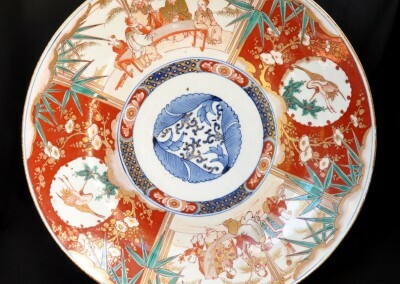 A Japanese blue & white plate with pierced border. 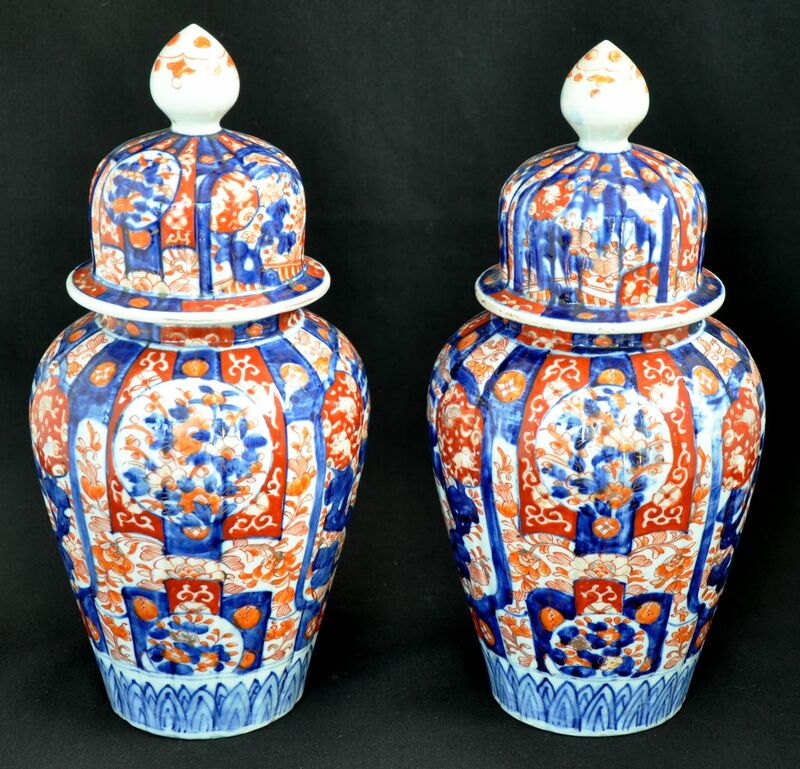 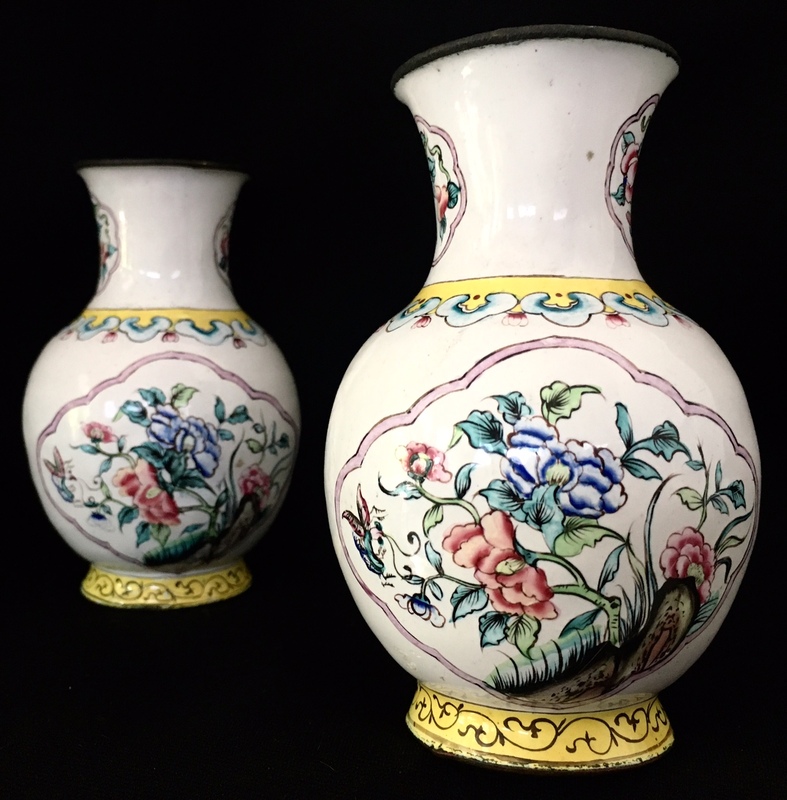 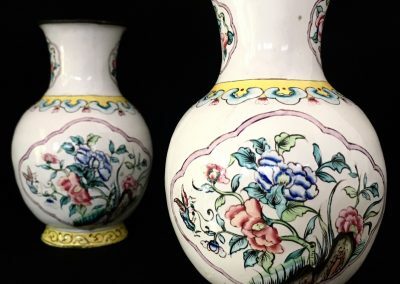 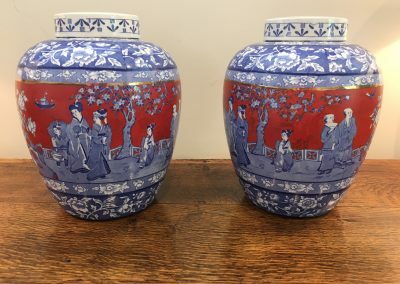 A pair of Iidded Imari vases c.1880. 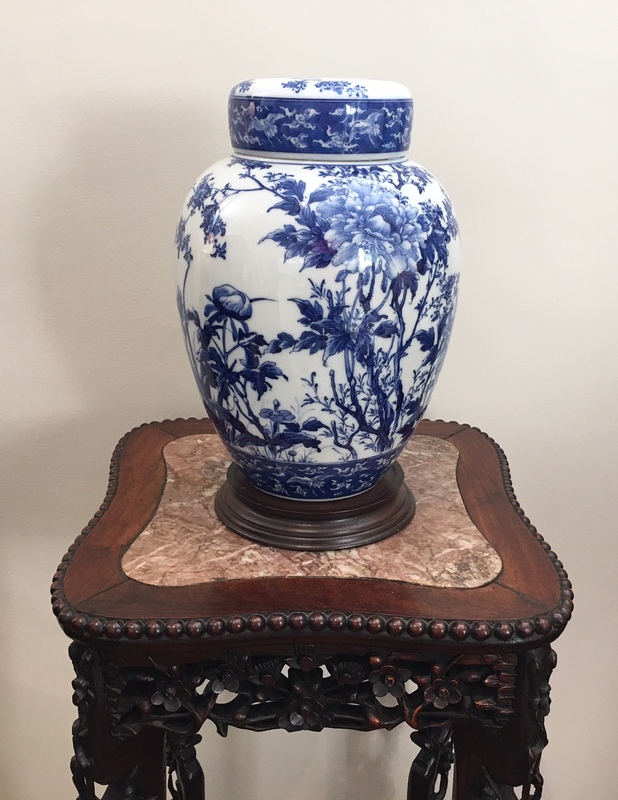 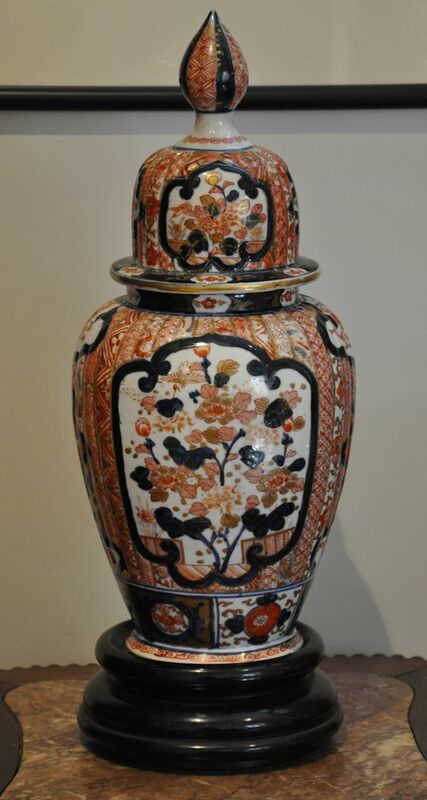 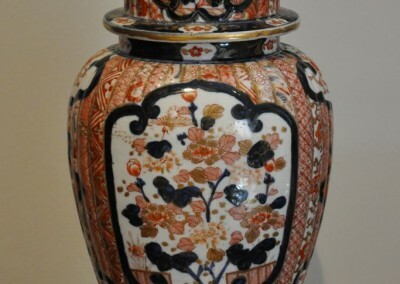 An Imari lidded vase on stand c.1860. 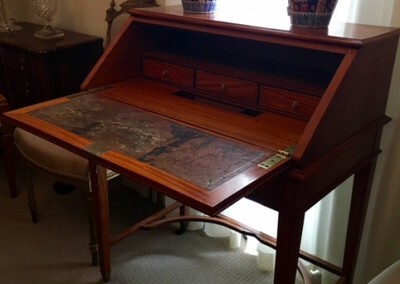 A satinwood bureau by Maple & Co. c.1900. 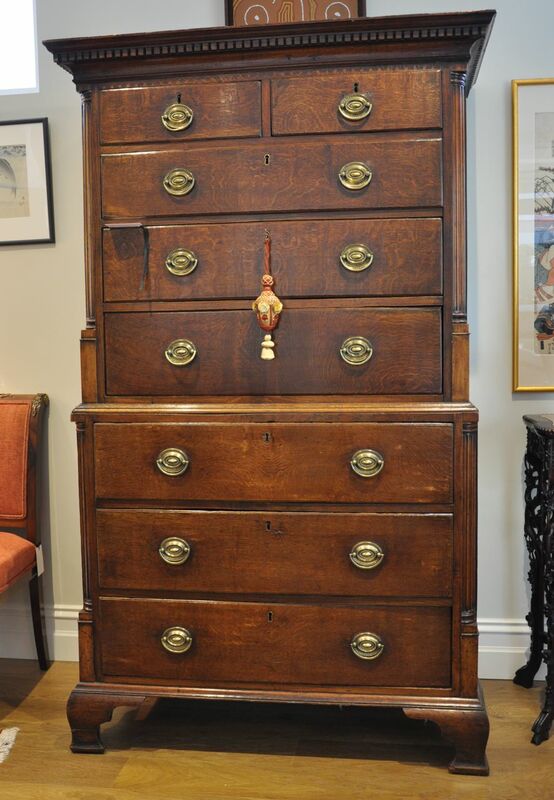 A walnut chest of small proportions c.1920. 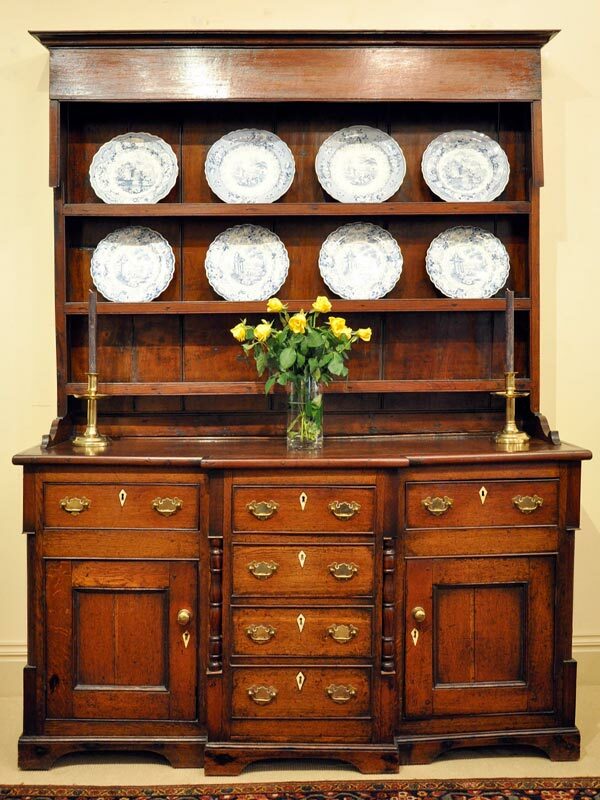 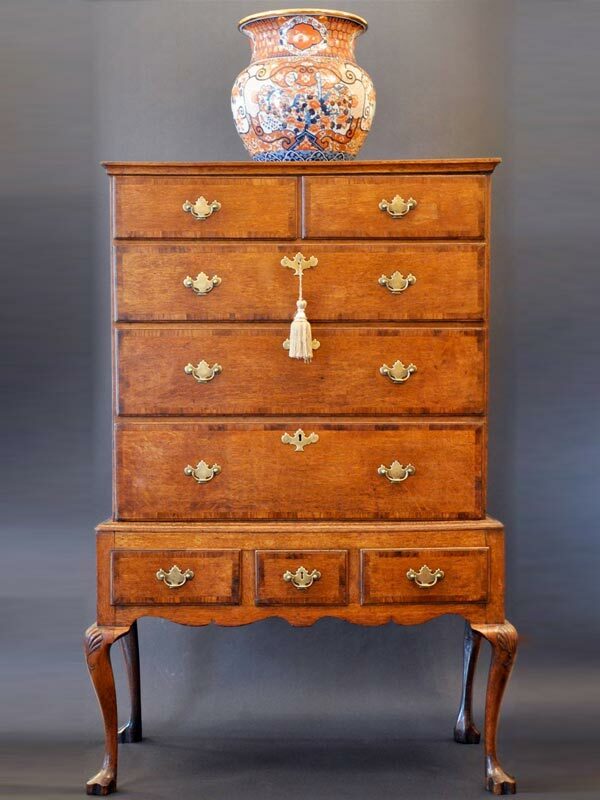 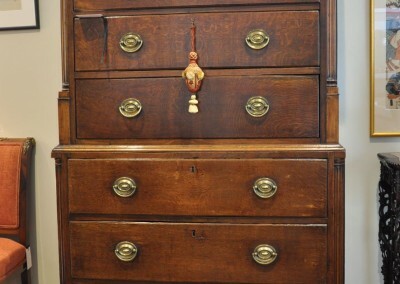 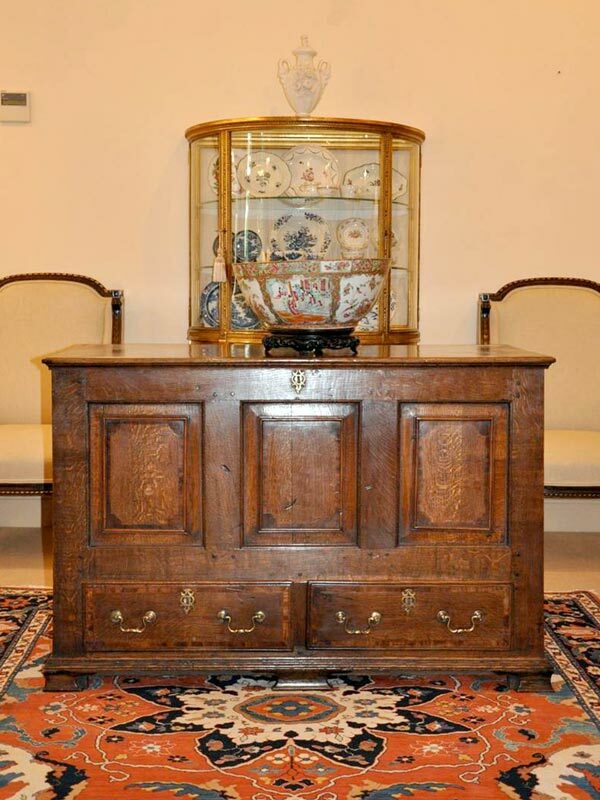 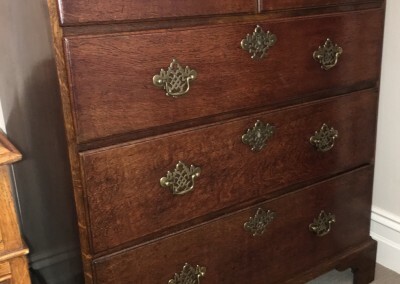 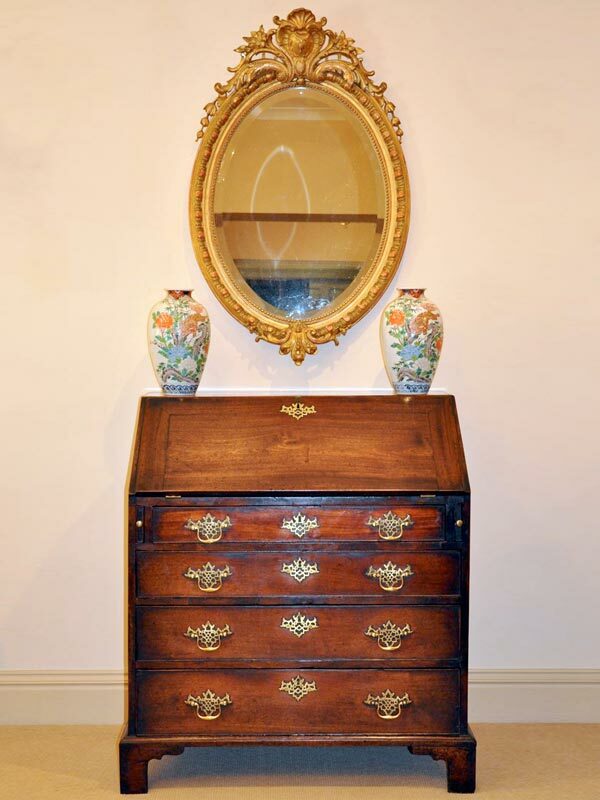 Fine quality oak chest on chest c.1800. 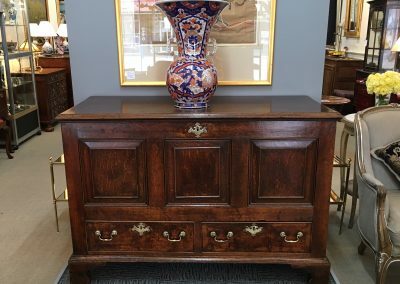 A GEO 111 oak chest c.1800. 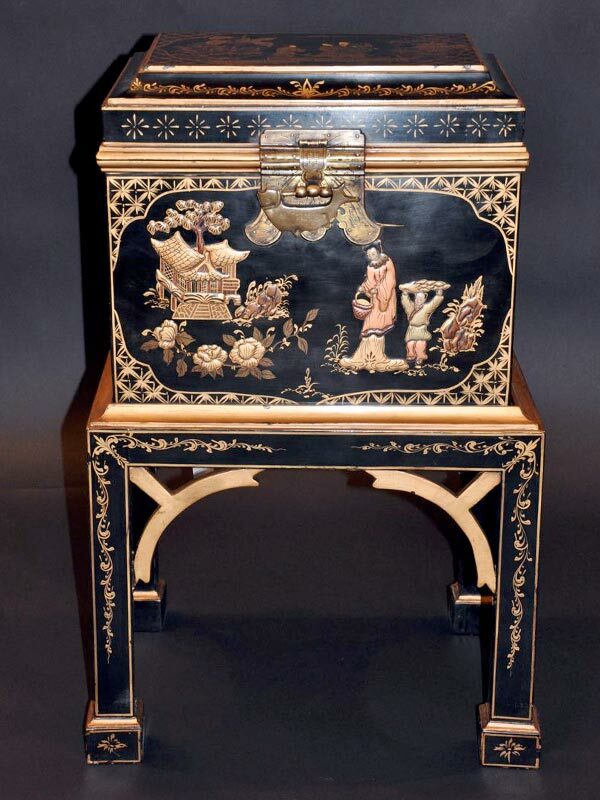 A painted and ebonised vertrine stamped PE GUERIN c.1900. 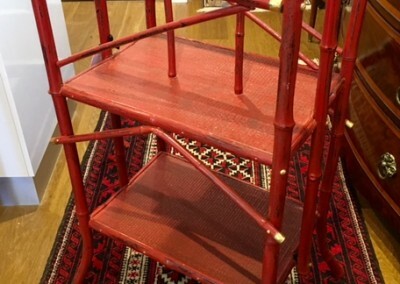 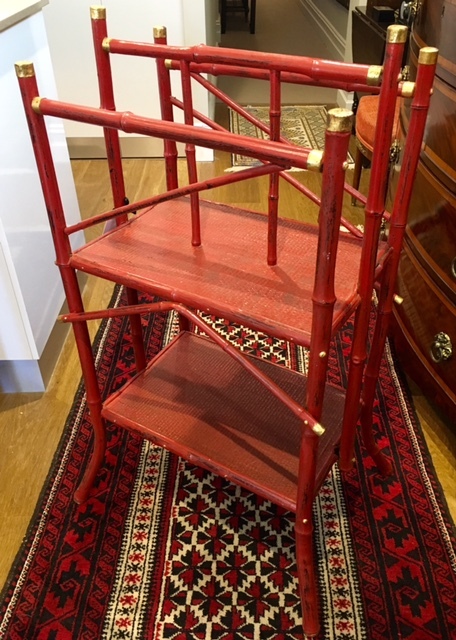 Faux bamboo magazine stand c.1900. 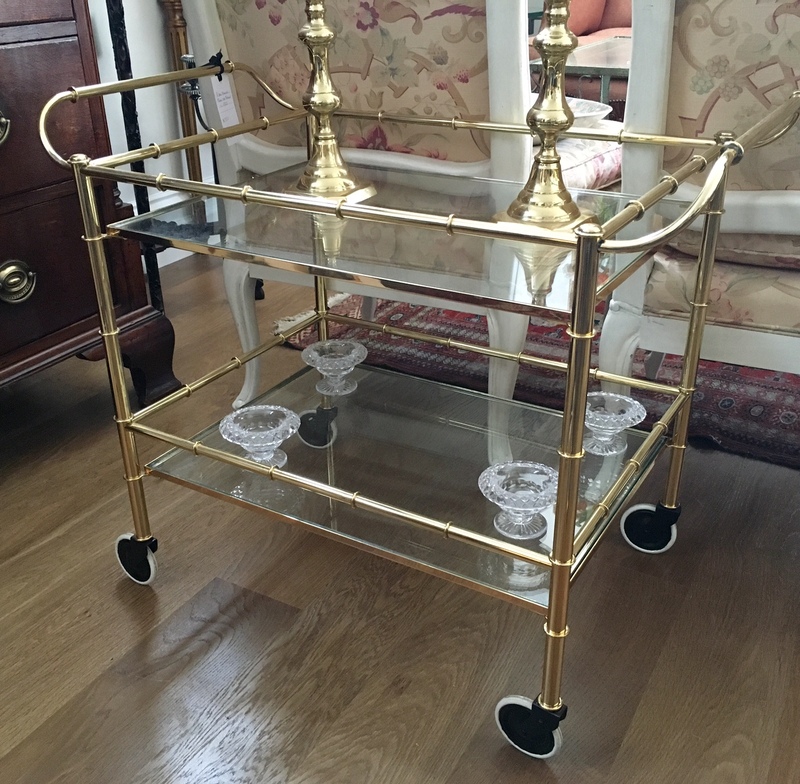 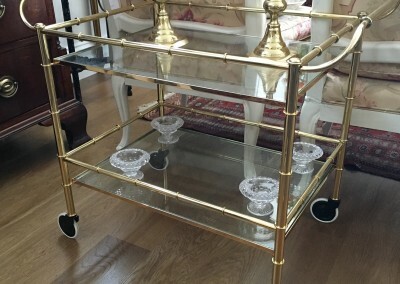 A faux bamboo brass tea trolley c.1950. 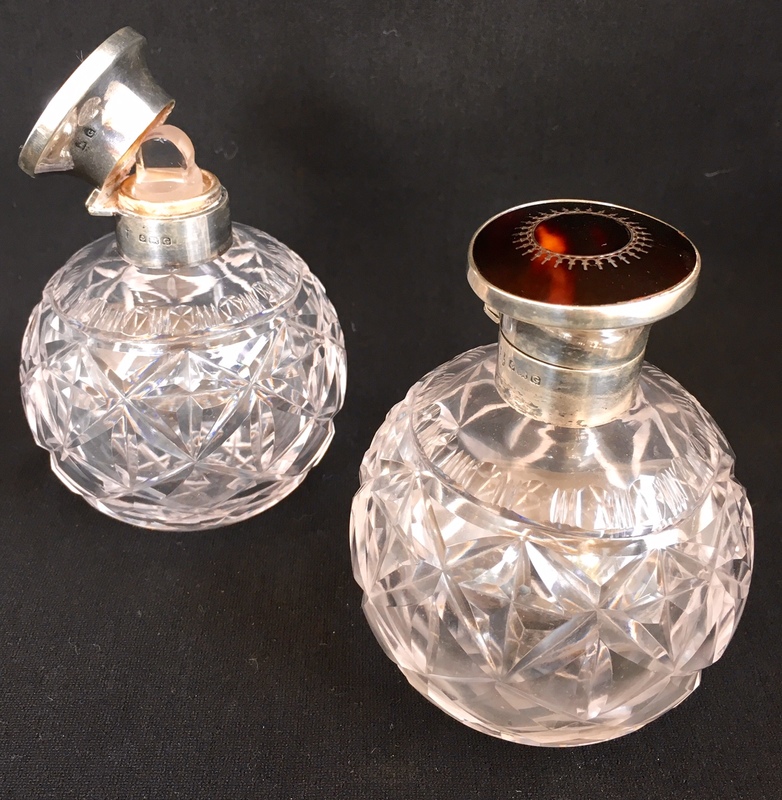 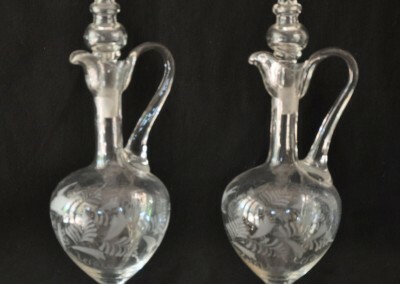 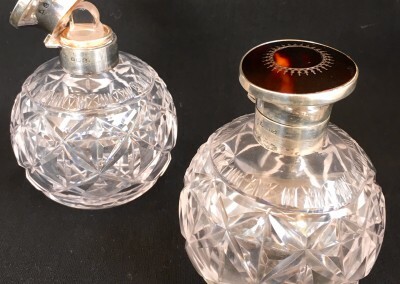 A pair of perfume bottles with sterliing silver mounts. 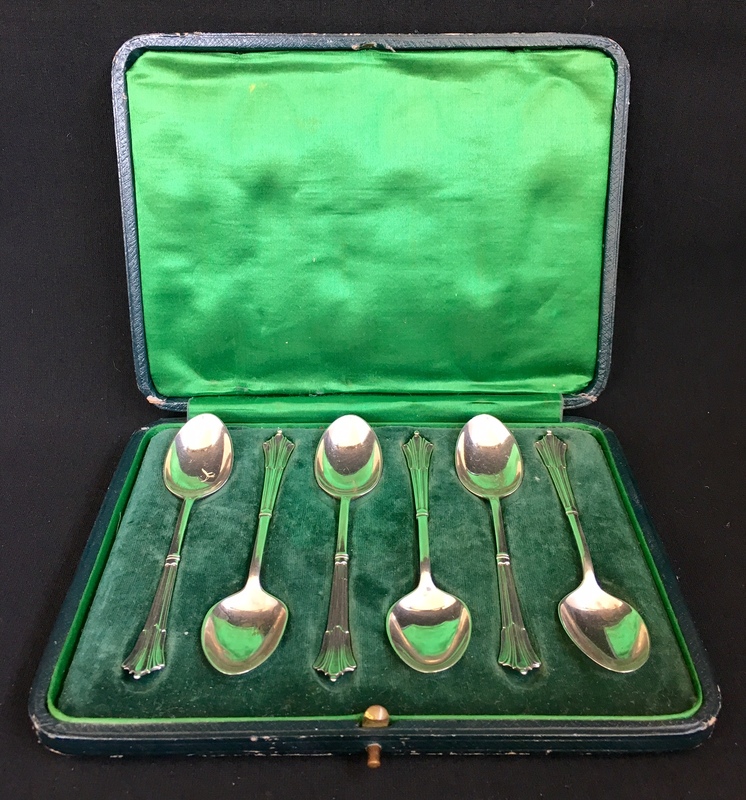 A set of 6 sterling sliver tea spoons Sheffield 1909. 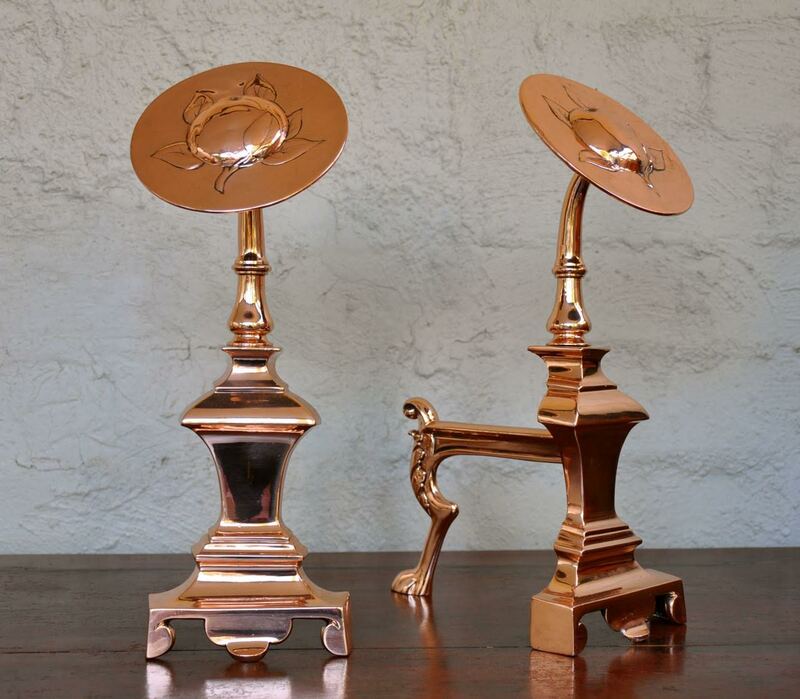 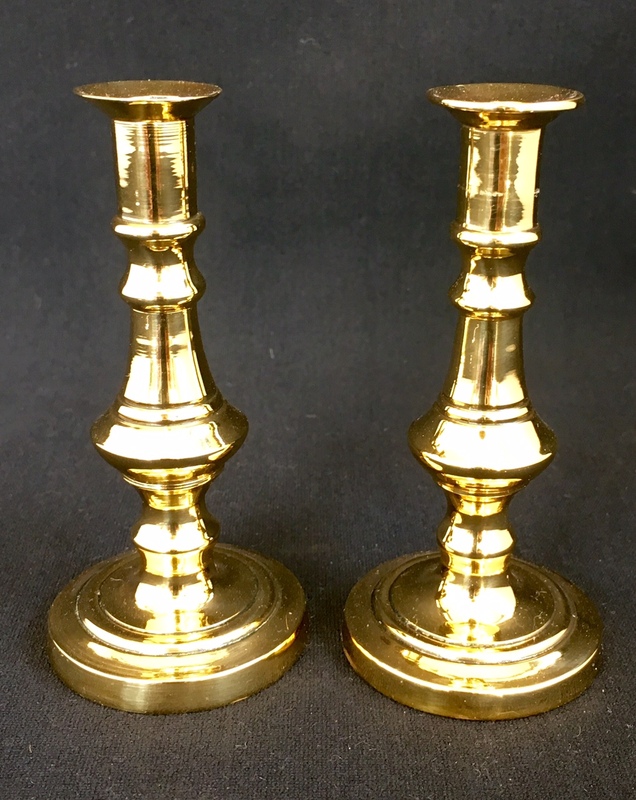 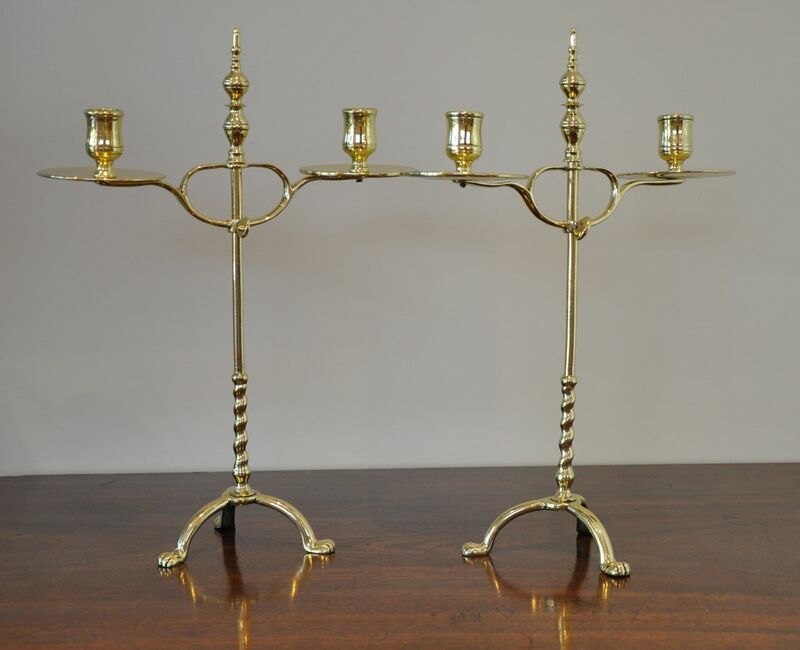 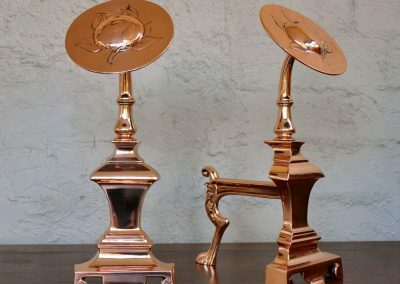 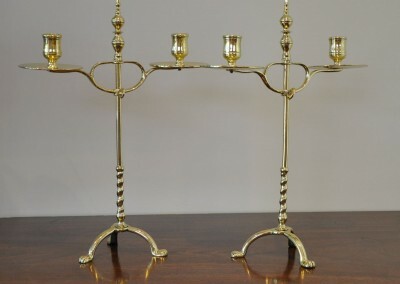 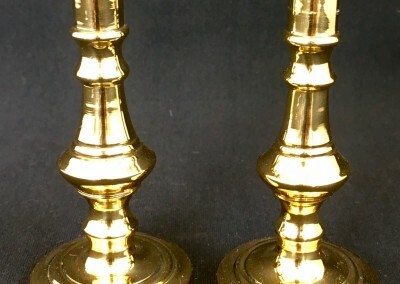 A small pair of brass candle sticks. 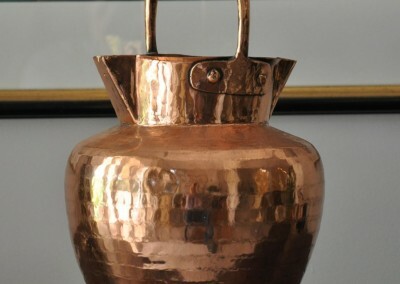 A 19th century copper and brass water pourer. 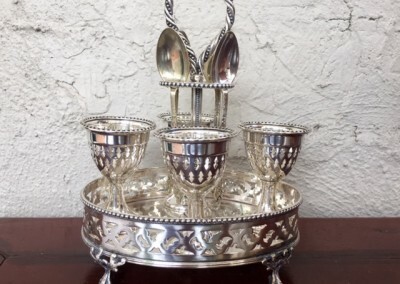 Silver plated egg cruet set c. 1920. 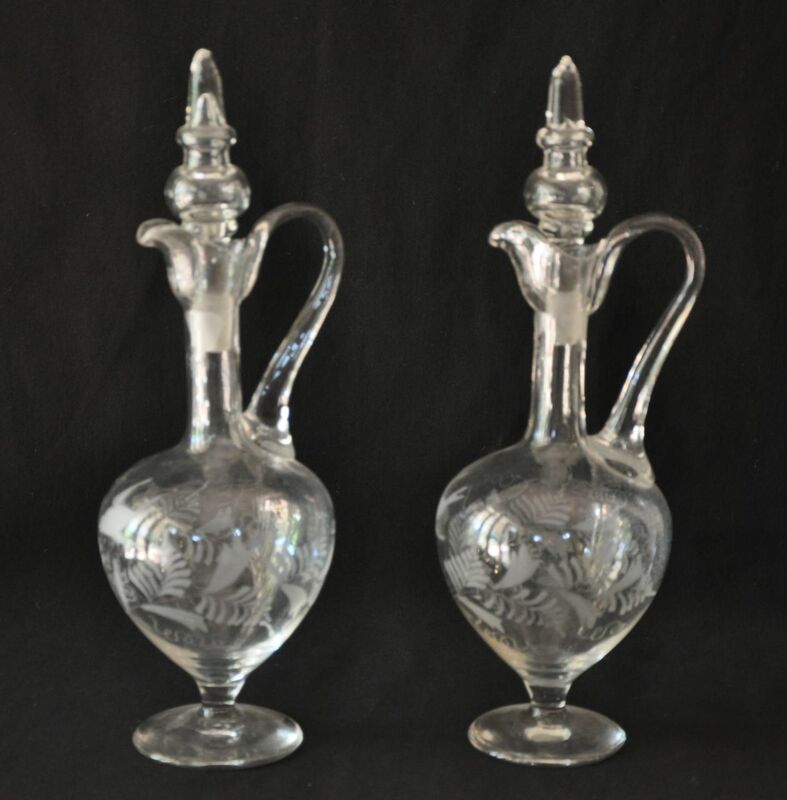 A pair of 19th century ewers c.1870. 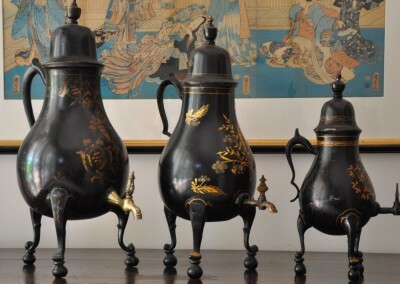 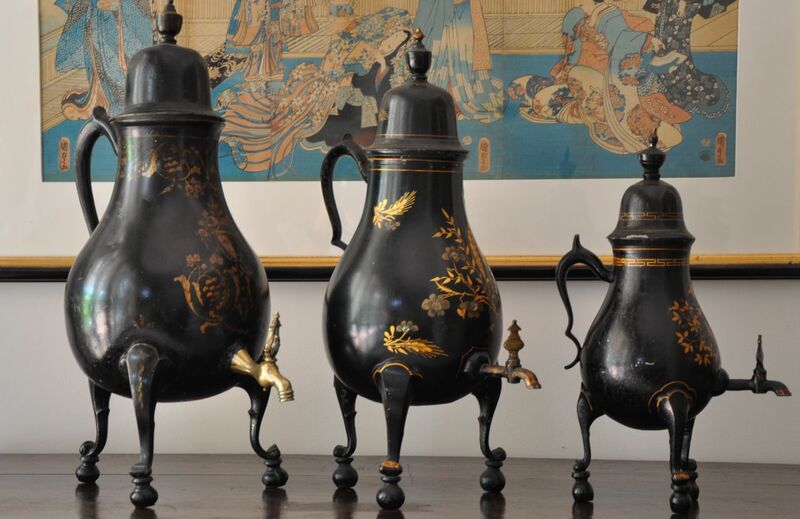 A set of 3 Regency tole tea urns. 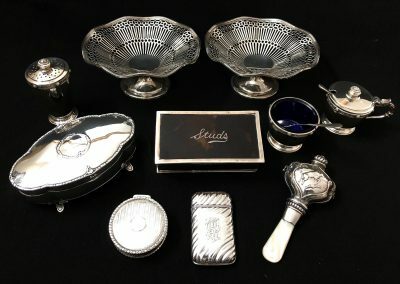 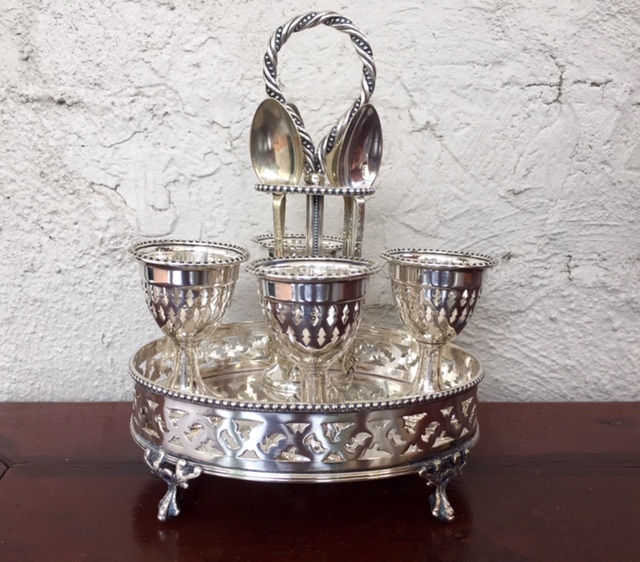 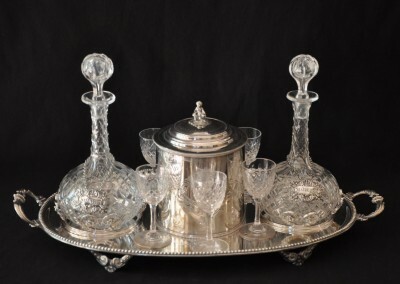 A silver plated tray with decanters, glasses and biscuit tin. 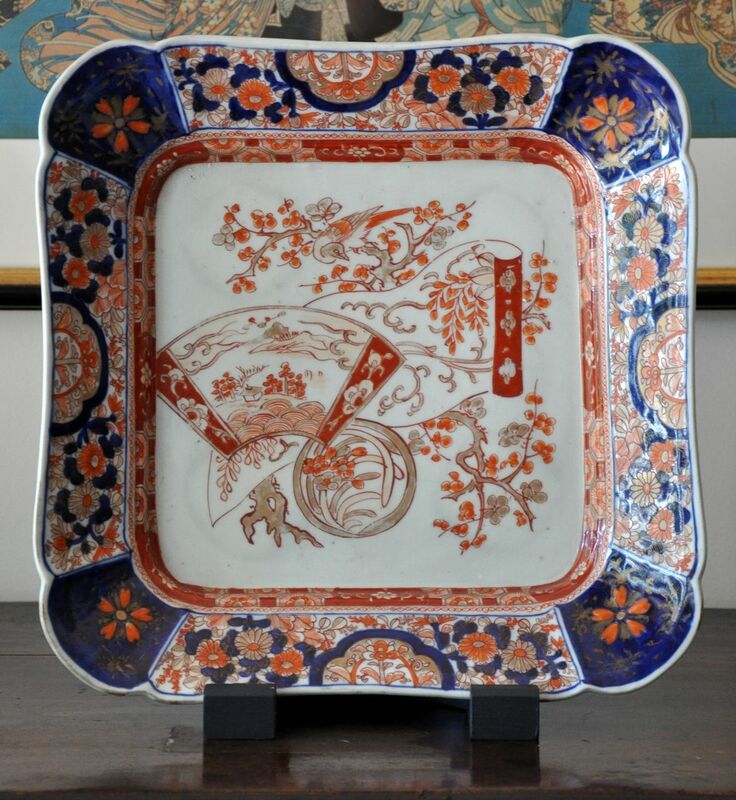 A papier mache plate c.1900. 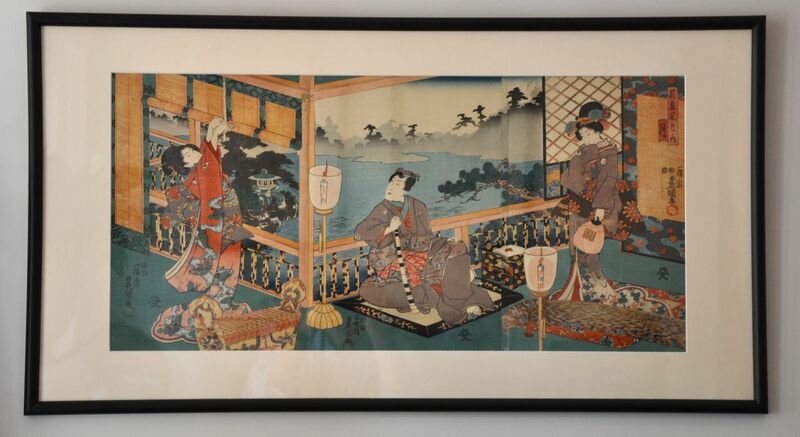 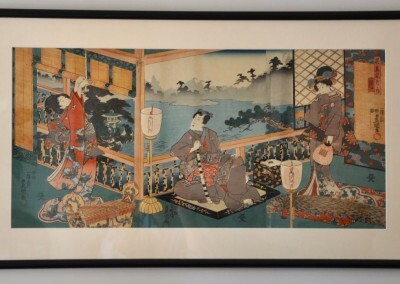 Japanese triptych by Kunisada c.1845. 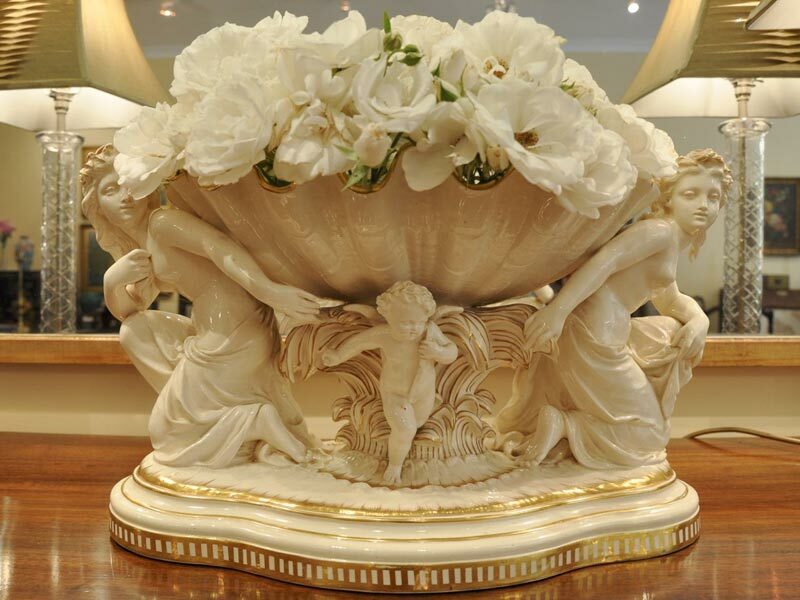 We ship world wide. 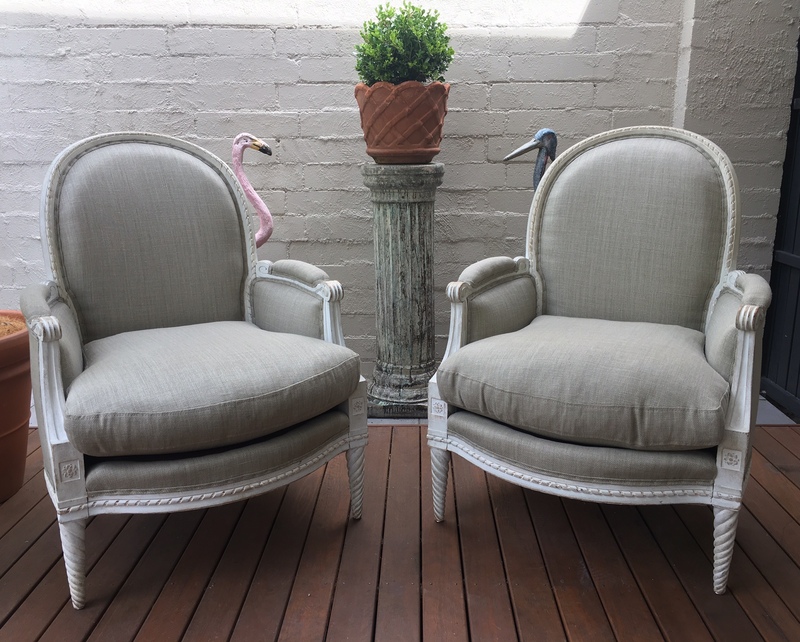 Quotes available upon request. 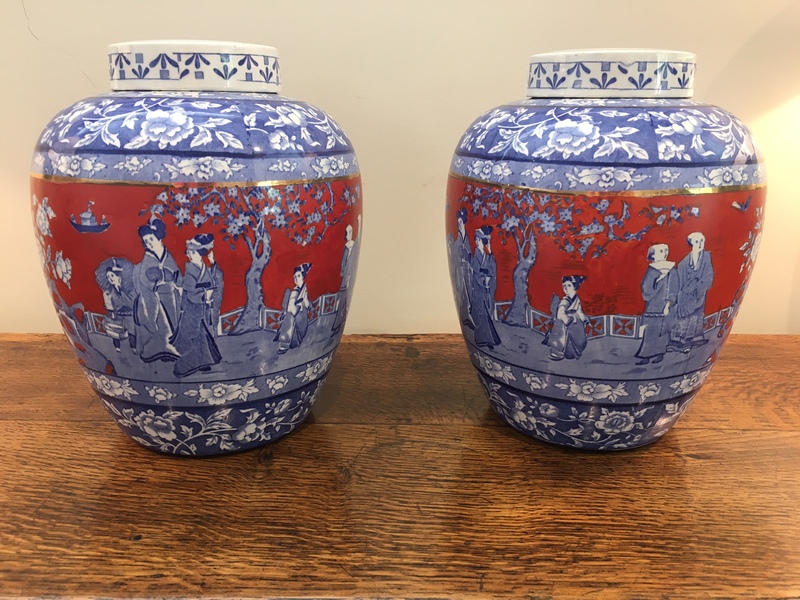 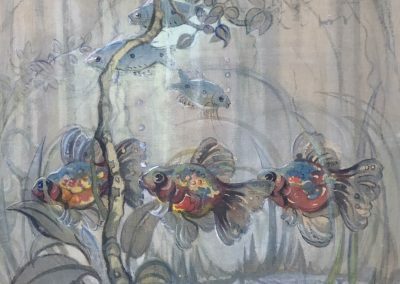 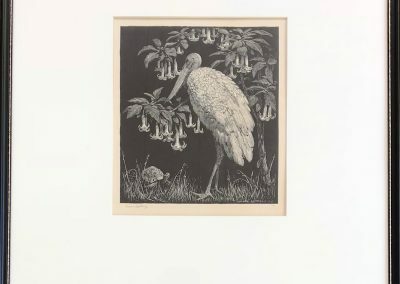 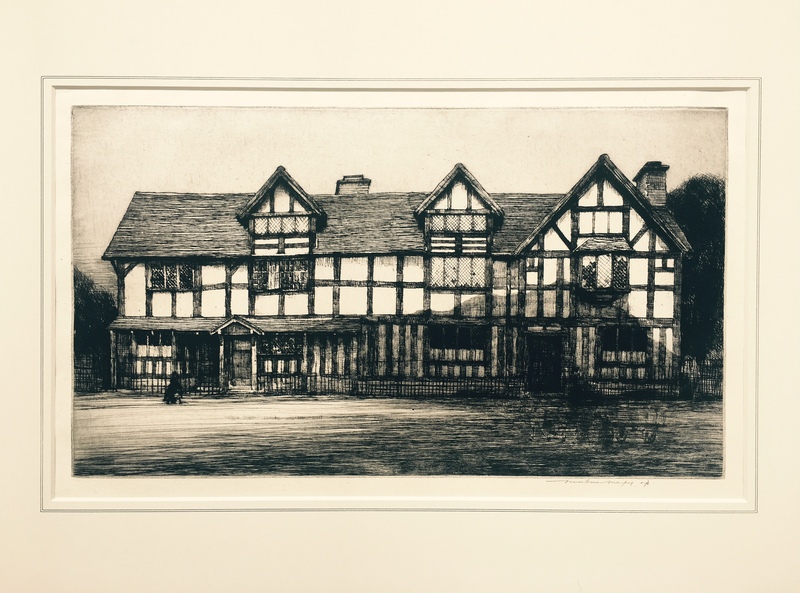 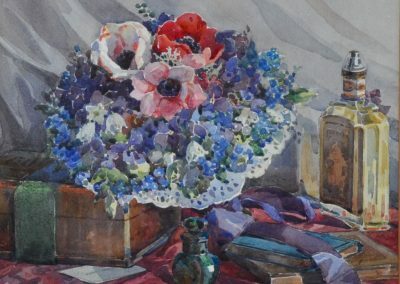 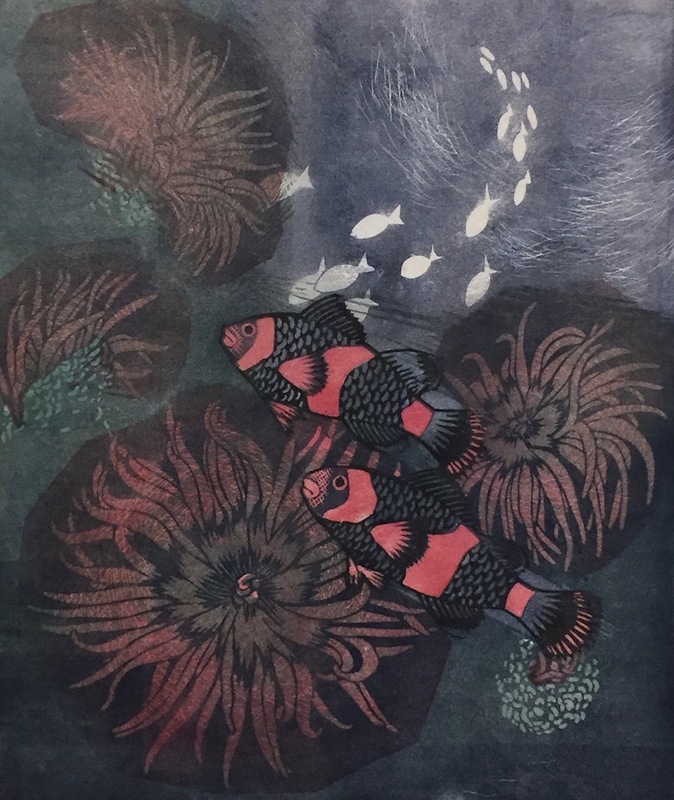 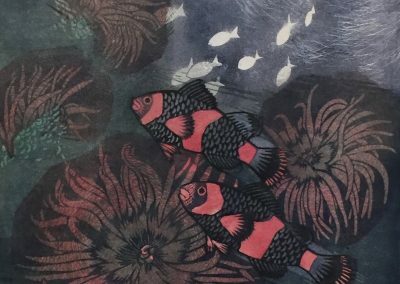 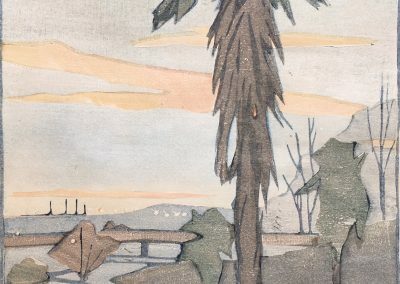 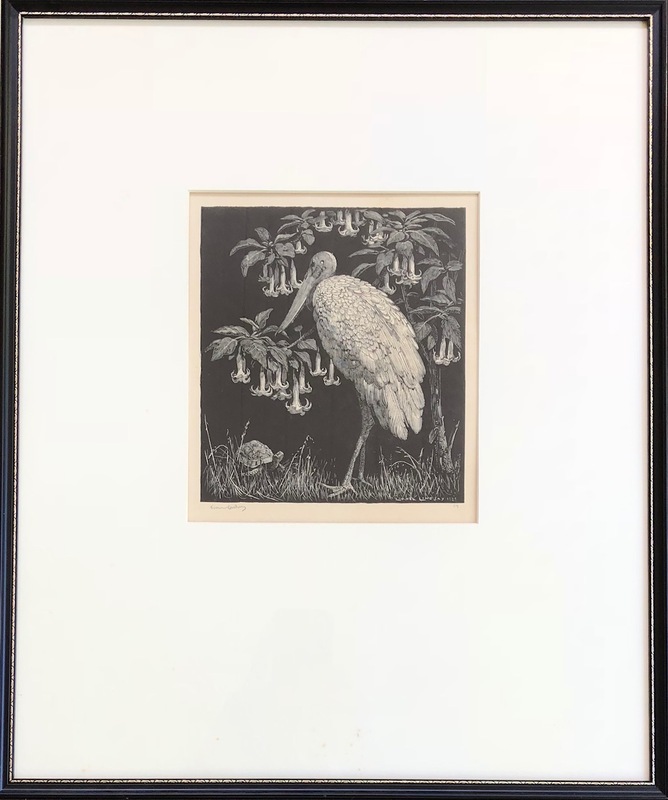 If you would like to be added to our mailing list and alerted to new acquisitions and collections please send us an email through the enquiry form.